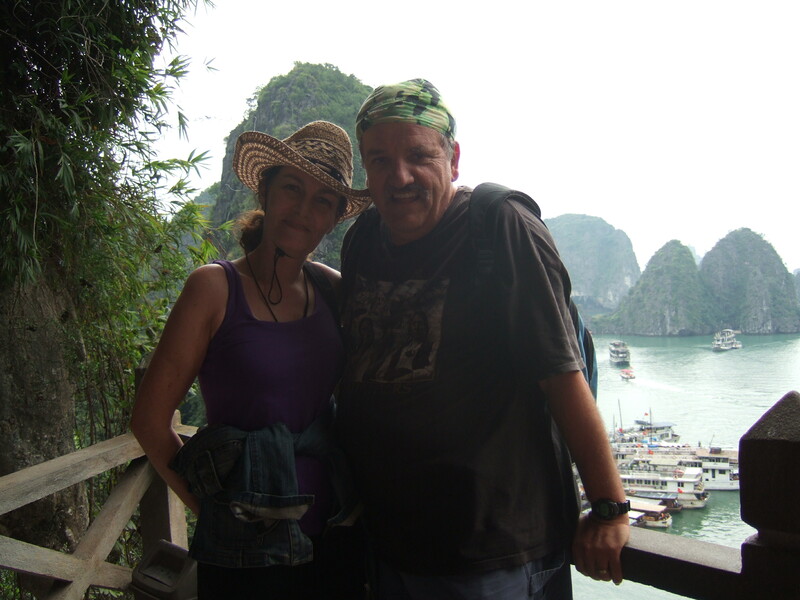 Living and working in the Arab Gulf has afforded my husband and me some remarkable travel opportunities, including a visit to the incredible Vietnam. 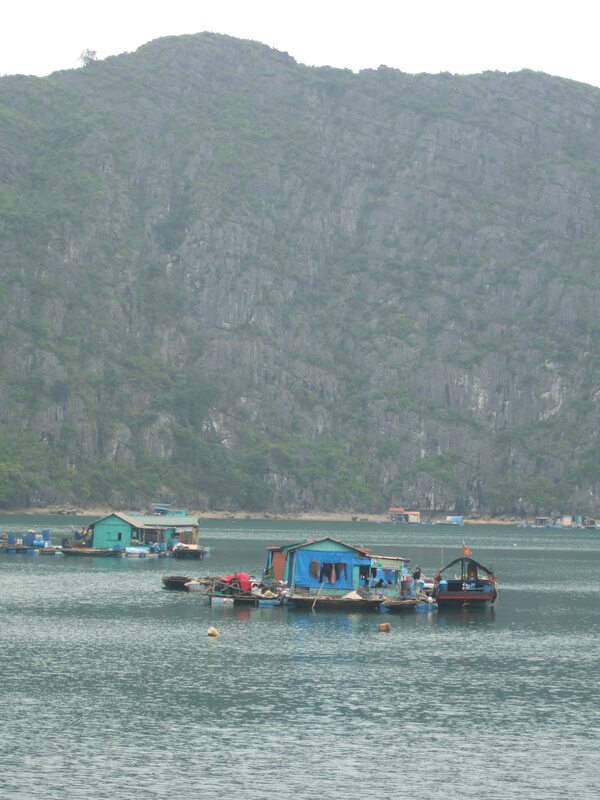 Although in Vietnam for merely a week, my husband, Bishara, and I had managed to sample the exotic cuisines and districts of Hanoi’s Old Quarter, cruise picturesque Halong Bay, bike on lush Cat Ba Island, climb Sapa’s impressive Dragon’s Jaw, and visit the intriguing Hmong village of Ta Van in the Hoang Lien Son mountain range. 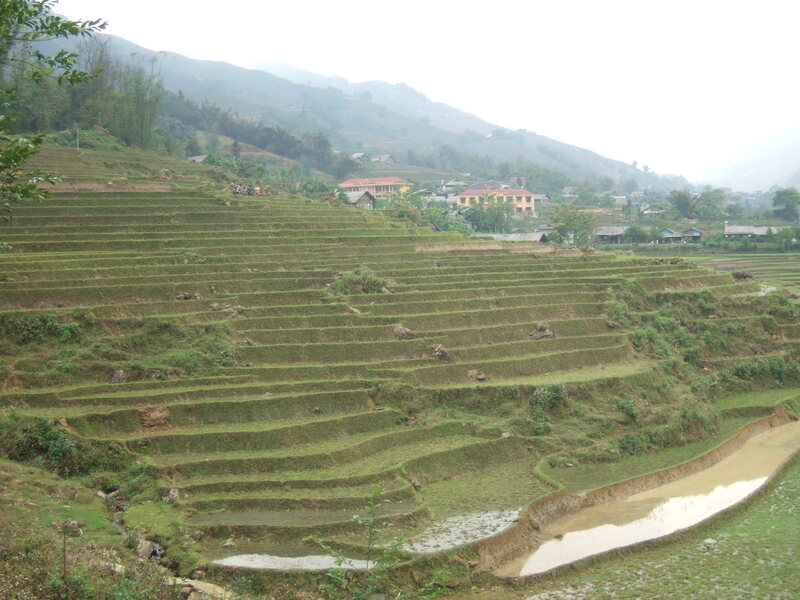 Our itinerary now included a highly anticipated return to the Old Quarter of Hanoi on an overnight train from Lao Cai, an hour’s drive outside of Sapa. 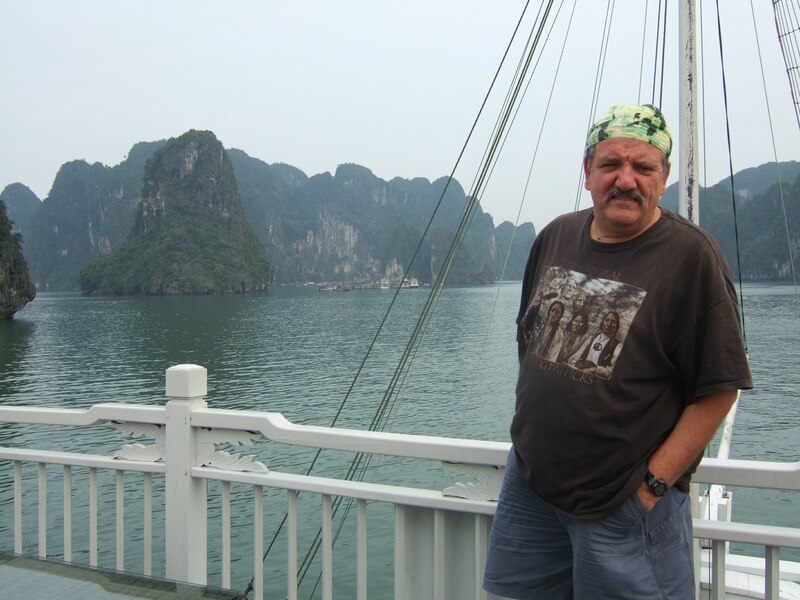 While initially apathetic over the prospect of visiting Vietnam, Bishara’s avidity for experiencing this unconventional vacation destination, in conjunction with a plethora of affirmative anecdotes from friends regarding this Indochinese nation, ultimately persuaded me to assent to the trip. 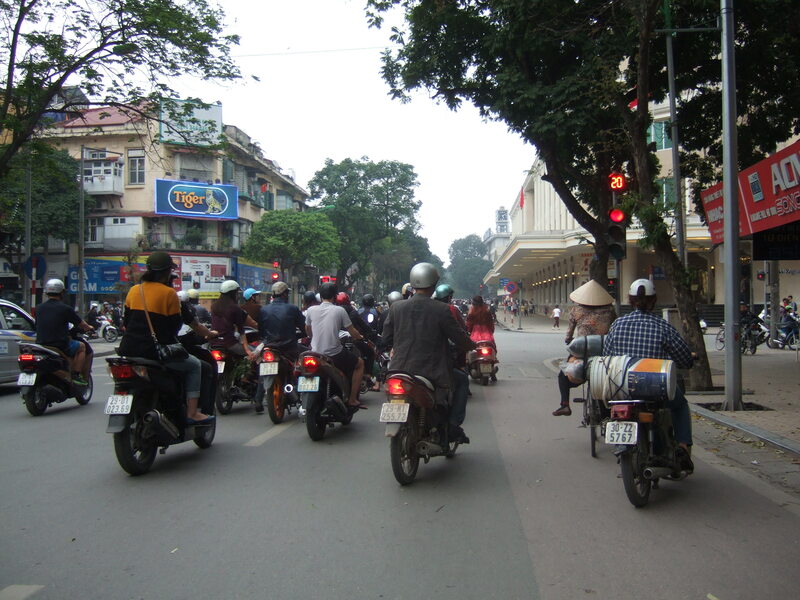 From the moment we entered the outskirts of Hanoi a week earlier, I became captivated by this delightful dizzying city – the tall narrow French colonial-style buildings, ubiquitous scooters, and an almost tangible buzz and spirit on the streets. 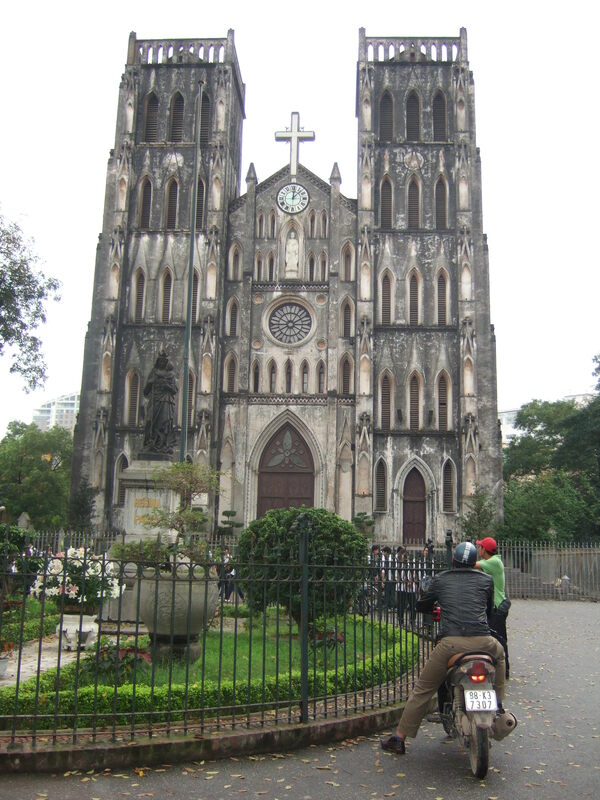 While the original plan was for Hanoi to be our primary domicile and launching point for convenient expeditions to Halong Bay to the east and Sapa in northwest Vietnam, the frenetic metropolis had become much more than a “home base.” Bishara and I felt strangely invigorated, yet relaxed, in this raucous city despite normally being partial to holiday locations with appealing natural settings – white sandy beaches framed by banyan trees or pristine mountains flush with pines, evergreens, and clean fresh air. 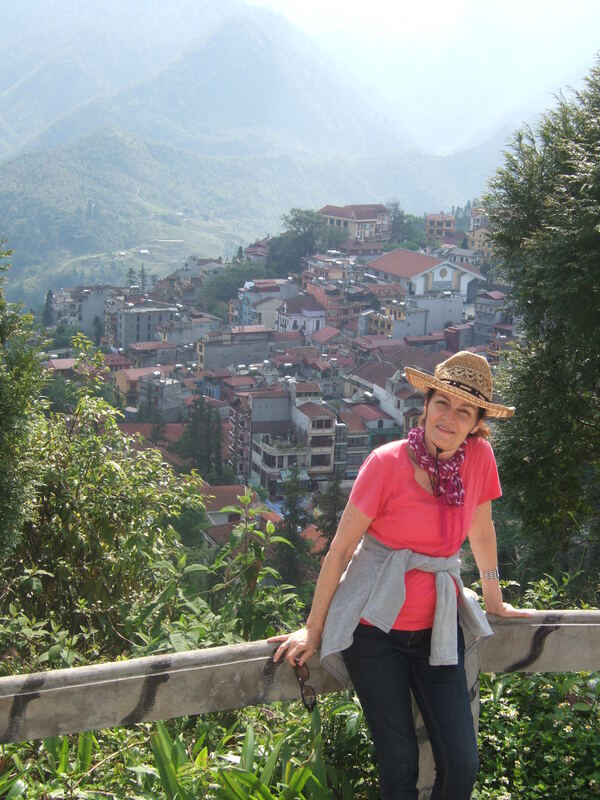 Although feeling somber about leaving the splendor of Sapa and the surrounding mountain-scape, we were keen on wedging in several more indulgent hours before departing for the train station in the late afternoon. 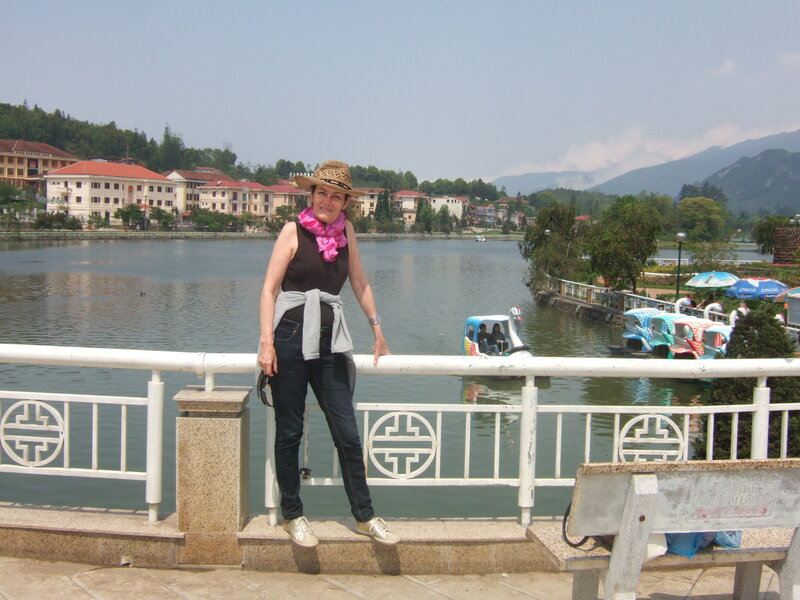 In this spirit, we patronized the dynamic Sapa marketplace where Bishara purchased a florid dress and “earthy” toned Hmong skirt he insisted were “me,” and strolled to the lake, replete with paddle boats, on the far side of town. 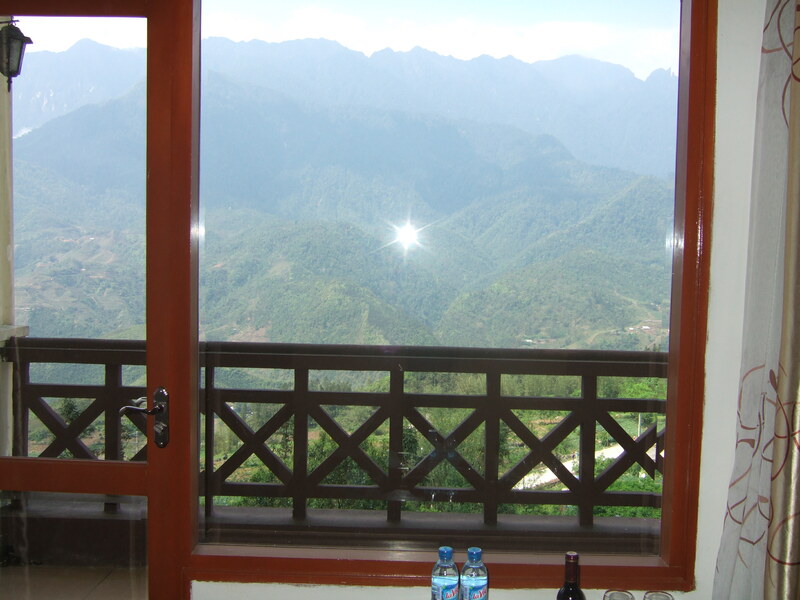 Lunch ensued at the Sapa Nature View restaurant where open windows allowed us remarkable views of the “Tolkinese Alps,” positioned along the fringe of the Himalaya Mountains. 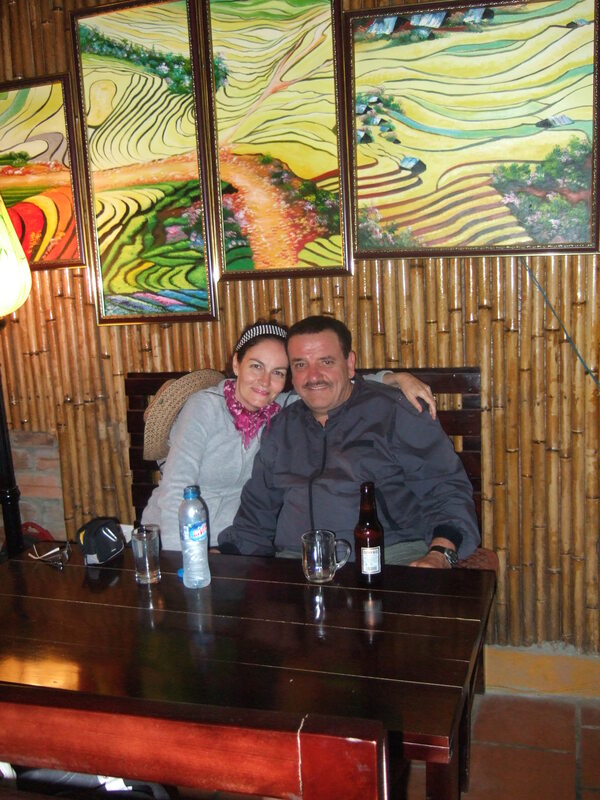 Fresh mountain breezes swept throughout the room complementing our meals of shrimp and chicken soup, sweet and sour shrimp, and grilled chicken with noodles. 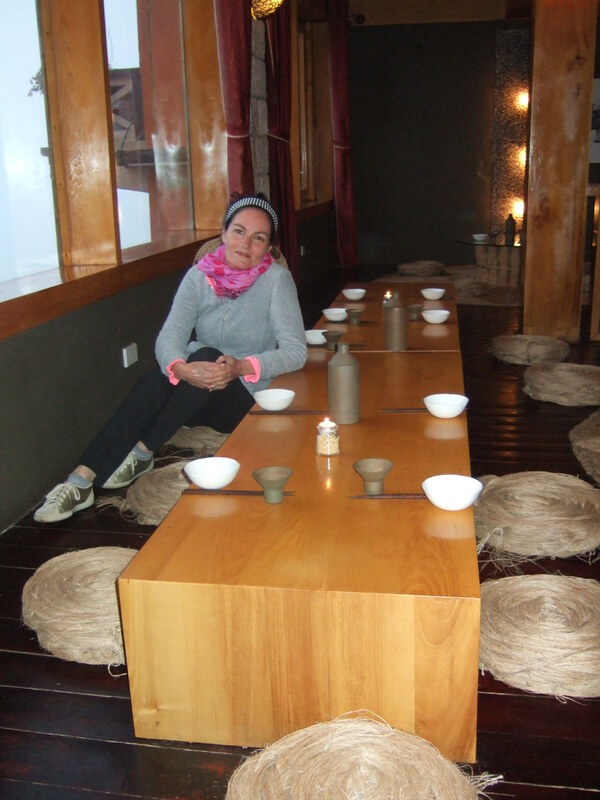 Leg, shoulder and upper back massages on the second floor of the restaurant building enriched our delectable lunch outing yielding more incredible mountain glimpses. 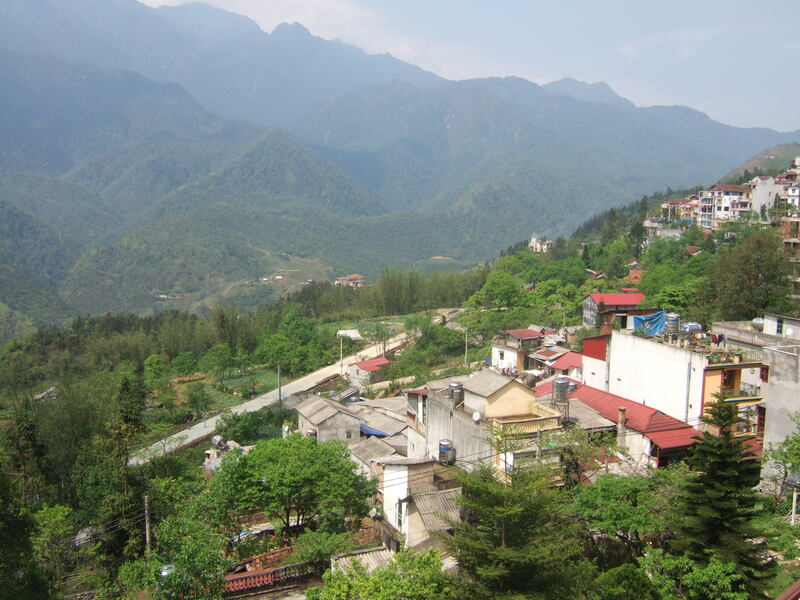 Yearning to linger in this charming town, we rambled down the road to an open air café and relished sips of fragrant Vietnamese milk coffee and stunning foliate terraces in the distance. 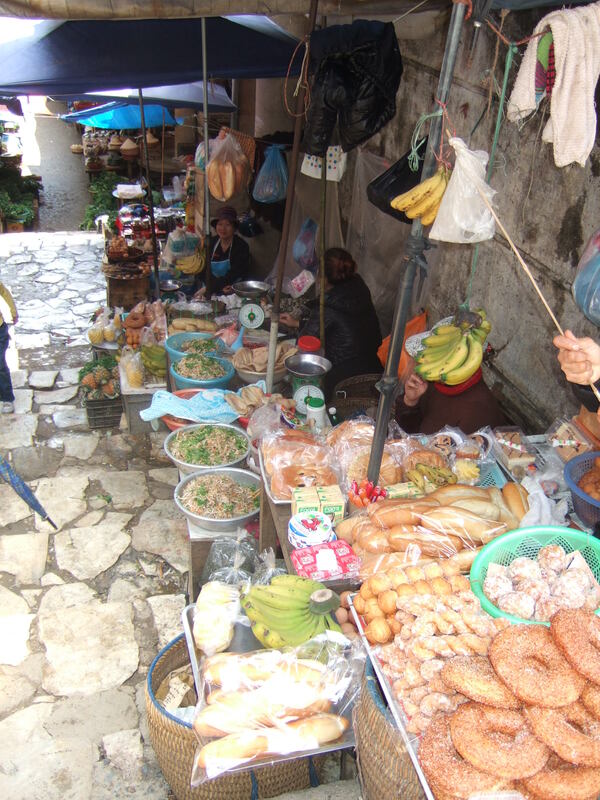 Street food at Sapa Market. 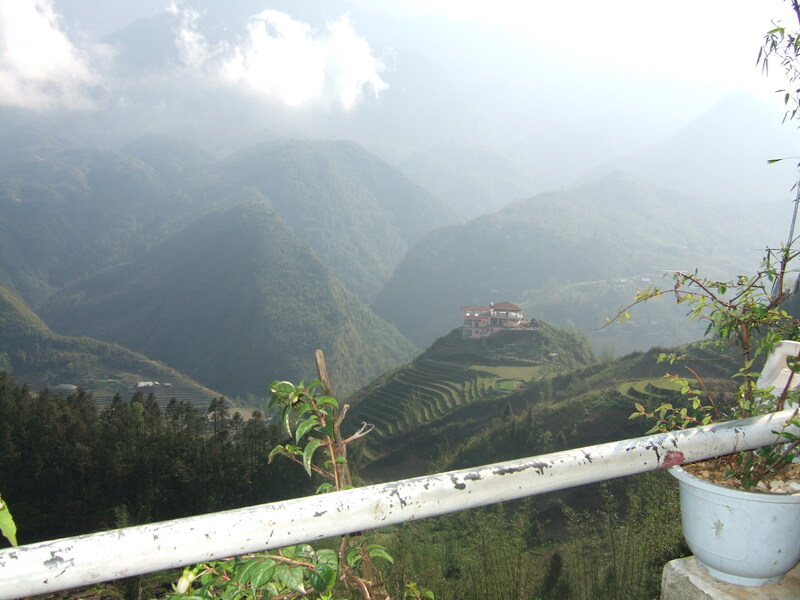 Towards dusk, we reluctantly left Sapa by private van travelling through the undulating mountain ridges and late afternoon light. 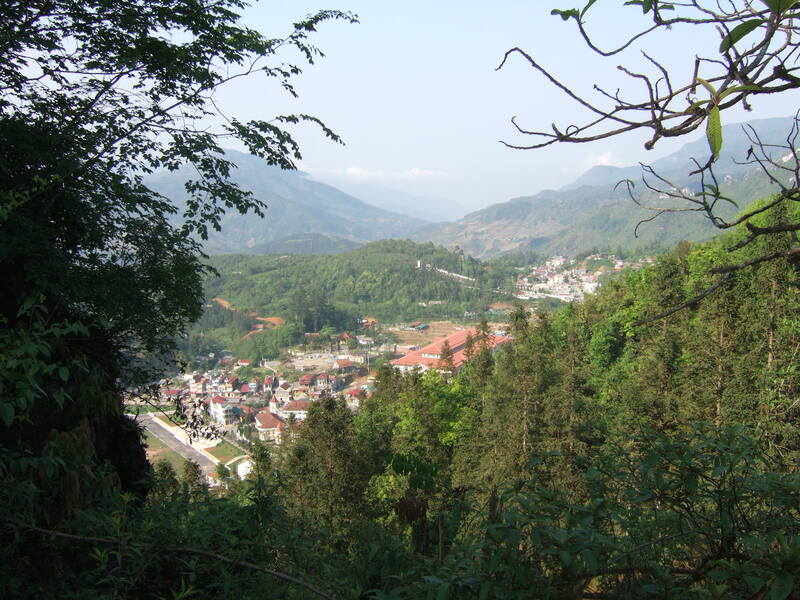 Reaching Lai Cao, an hour later, we lugged our suitcases through town and joined hordes of other tourists, and nationals alike, dining at casual outdoor cafes or otherwise passing the time as they waited for their trains to depart. Following our hurried meal of Vietnamese noodle dishes, Bishara and I felt somewhat debilitated after the representative at the train ticket booth told us in severely fractured English that we needed to “go over there, to that hotel” and speak with ‘so-and-so’ to confirm our tickets. As we squeezed by, and slammed into, other train travelers trying to make our way to “that hotel,” good fortune shone down, as we unwittingly bumped into the ‘so-and-so’ representative. “Oh, I’m sorry,” I tendered, as I collided with a professionally dressed and coiffed woman holding a clipboard. I took the offhanded chance that this official looking person amidst the multitudes of faceless strangers might be able to assist us. Showing the matron our paperwork, a glint of recognition showed in her eyes. 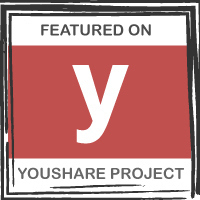 “Ah, yes” she submitted, as she signed and stamped our documents and pointed in the direction of the waiting area. Bishara and I stood, crammed up next to other commuters, near the sliding glass doors adjacent to the train tracks, as we did not want to miss any communication signaling our train was ready for boarding. Of course, this resulted in some missteps with Bishara and I jostling, along with everyone else, to get onto the train platform when the glass panes opened. 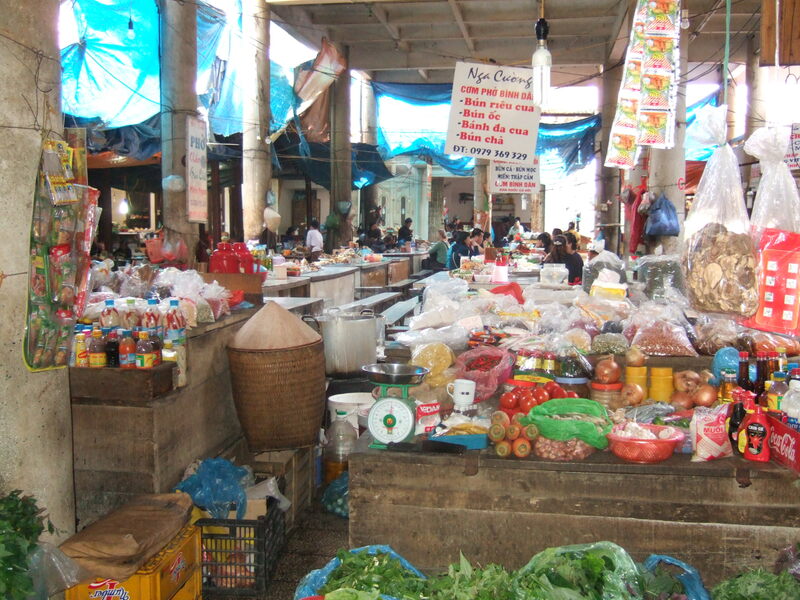 After one announcement, Bishara and I propelled forward, stumbling through the doors, only to knock over a snack kiosk as we turned back when we realized it was not our train; the kiosk vendors were not pleased. 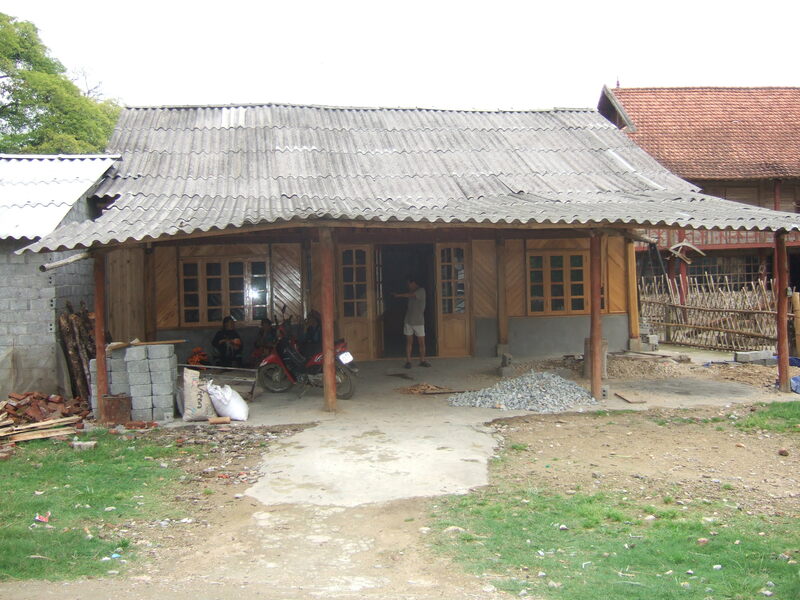 Our discomfiture continued once beside the train tracks, when Bishara hoisted our suitcases up onto the train carriage convinced a certain train line was ours, before becoming aware of a nearby railroad worker speaking an incongruent blend of terse Vietnamese with bits of English asserting that the train number did not match the information on our documents. This train employee charitably helped us unload our luggage and assisted in locating the correct train line and carriage. Safely in our diminutive, though comfortable and familiar, train cabin, I could finally exhale and look forward to all the creaks and grinds of our upcoming train ride, while basking in the singular awareness of this exotic trip. Exiting Lai Cao station at 8:50 PM, our train ride to Hanoi was nearly as fanciful as our inceptive ride two days prior. 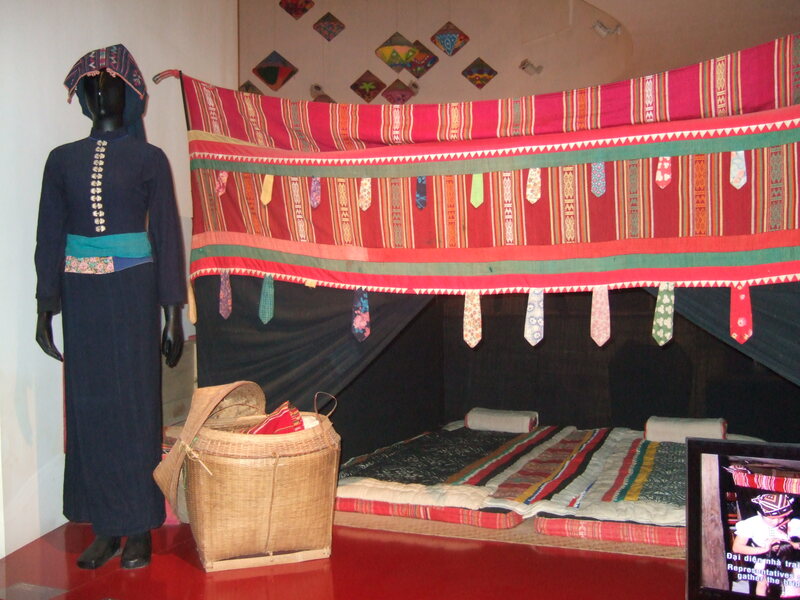 While Bishara slept rather well based on the depth of his snoring, I fell into the same erratic sleep as during our earlier train trip, vacillating between fatigue and wonder. 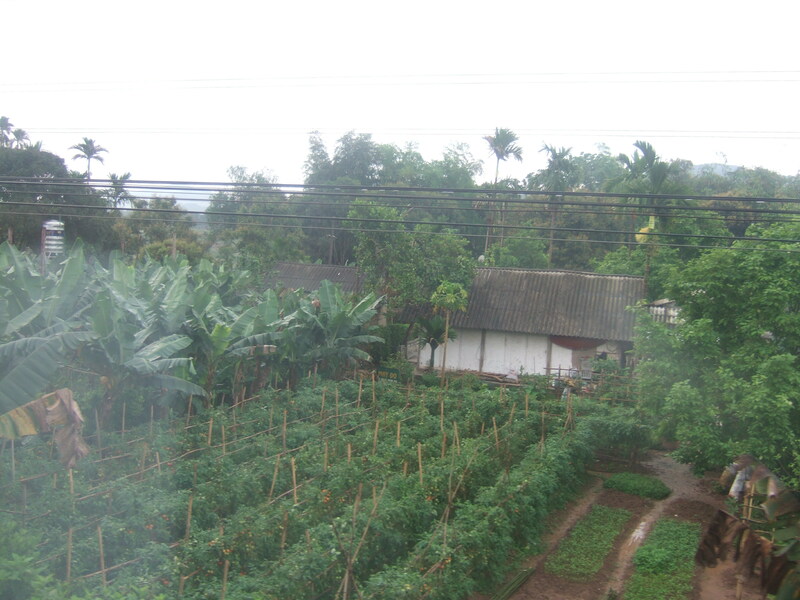 Close to 6:00 AM, as rain lightly pelted our cabin window, Vietnamese music permeated our compartment, and a brusque emphatic message in monosyllabic Vietnamese carried over the loudspeaker. 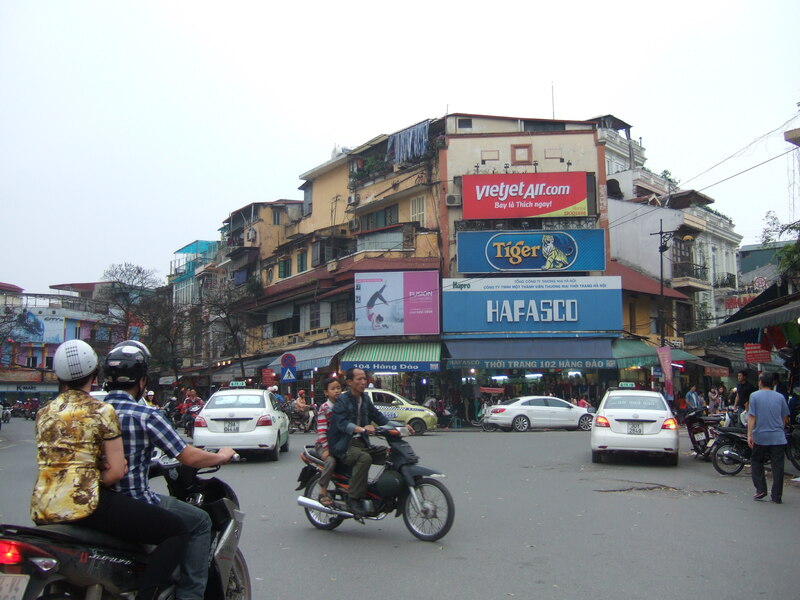 We assumed this signaled a couple hour’s wait before we arrived in Hanoi, as this was the sequence of events that transpired as we approached Lao Cai (from Hanoi) a couple of days earlier. 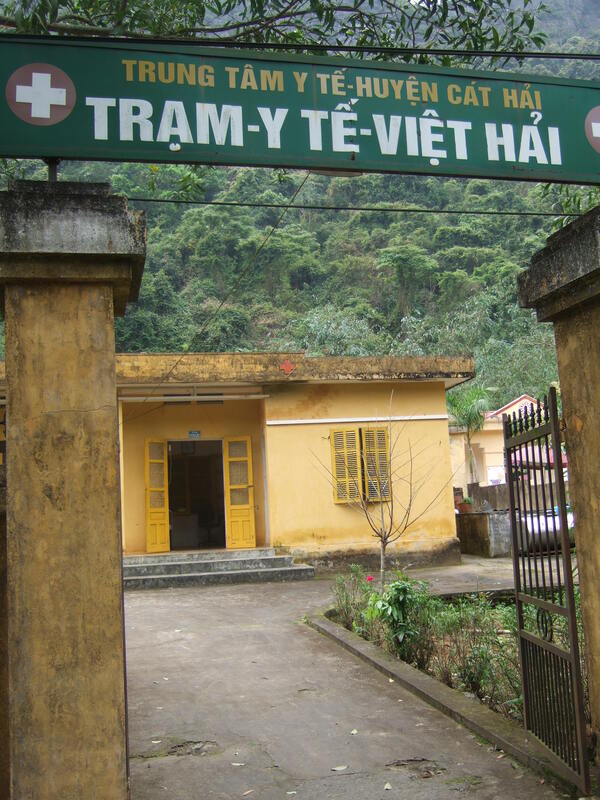 A short time later, however, a train employee rapped on our door and announced we were in Hanoi. I scurried to the restroom, and Bishara, still not believing we would disembark anytime soon, ordered milk coffee from the genial young train woman who, hours ago, cheerfully revealed she could make us noodles, coffee, and tea at any time during our overnight journey if we wished. 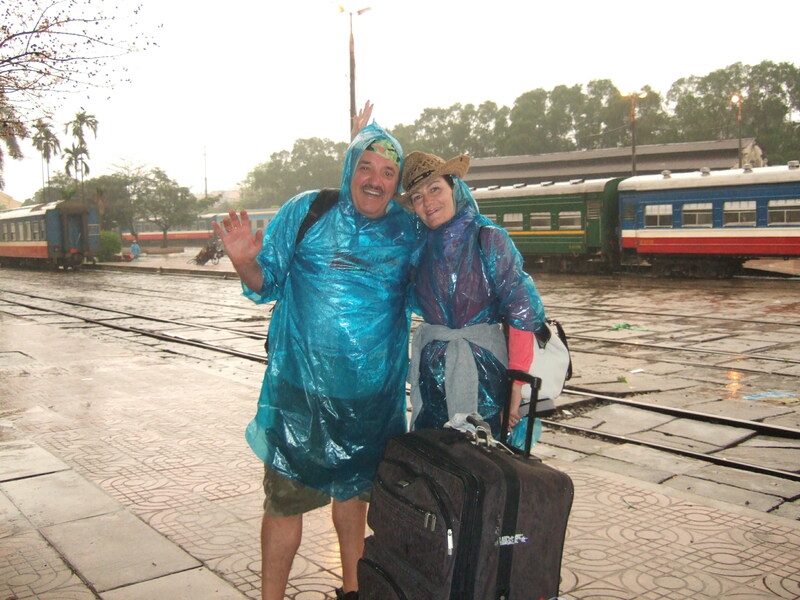 Shortly after returning from the washroom, to our collective surprise and relief, the porter from the Hanoi Elegance Ruby Hotel scrambled into our train cabin with blue plastic ponchos stuffed under his arms. 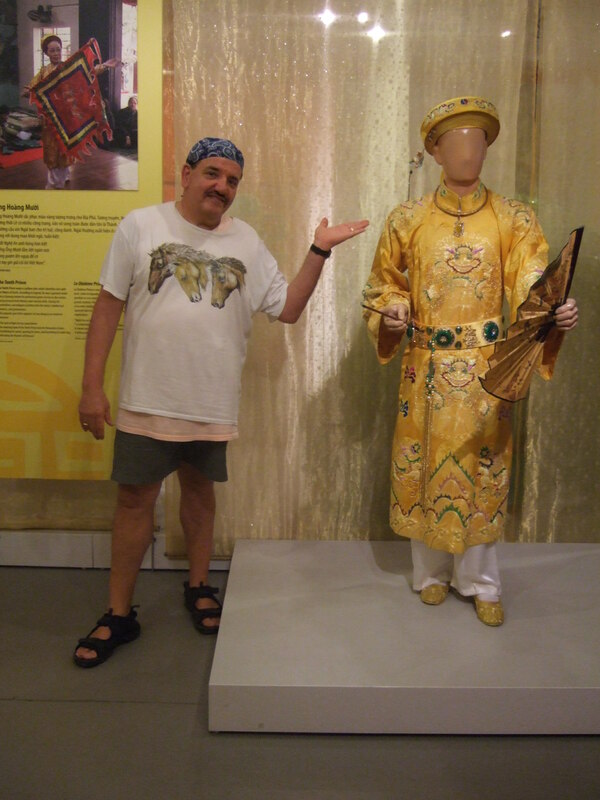 In short order, the young man politely welcomed us back to Hanoi, affirmed it was raining outside, and nimbly and attentively placed a poncho over my head, and a few fluid moments later, arranged the second poncho over Bishara’s head. Lurching for our luggage, the benevolent porter let out a wide lucent smile when Bishara asked if he could assist, declaring, “No, it’s fine. 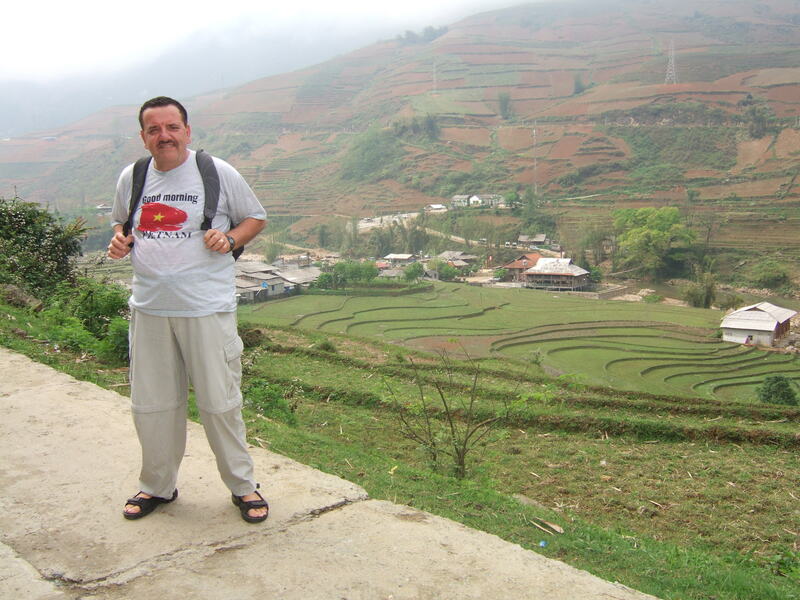 I’m Superman!” – a moniker bound to our congenial porter for the rest of our stay in Hanoi. Within short order, we were all in a waiting taxi, on our way to the Elegance Ruby Hotel, our “home away from home,” once again. 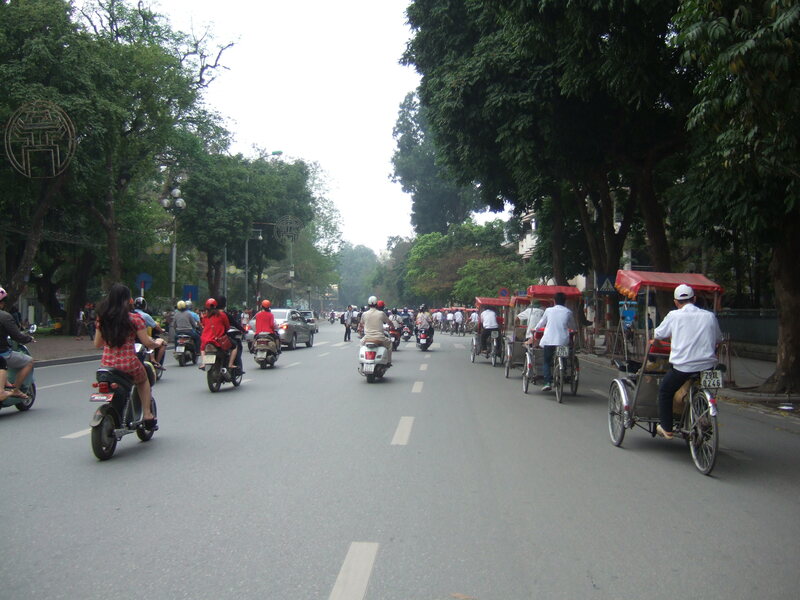 Hanoi was an eerie urban desert in the early morning, with nary a scooter or car in sight. 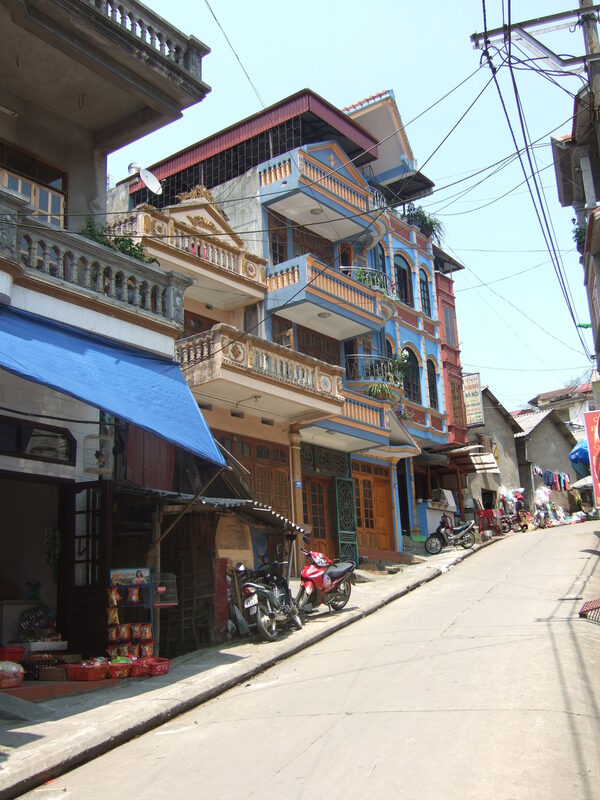 As we crossed through the metropolis, the cityscape made way for the narrow, tree-lined streets of the Old Quarter. 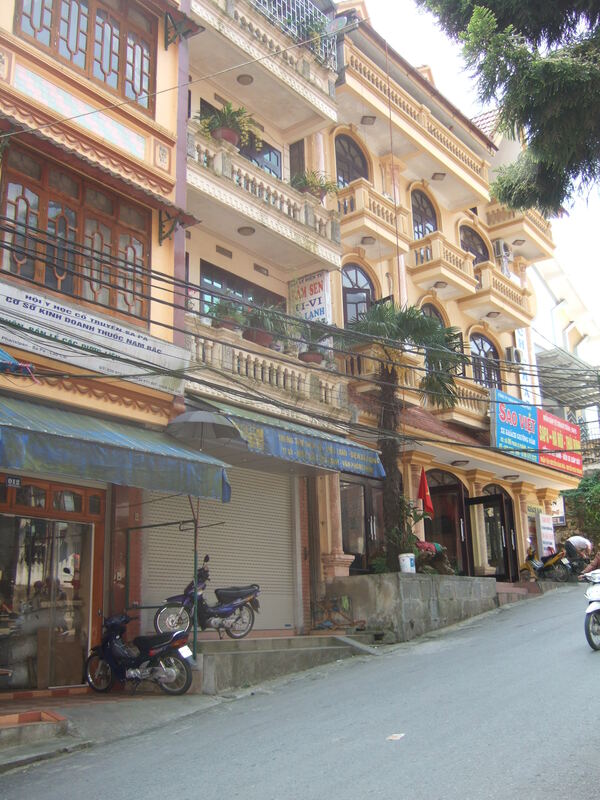 Arriving at the side street perpendicular to the mottled alleyway of the Elegance Ruby Hotel, our young porter vaulted from the taxi, seized our luggage from the trunk, and bounded down the alley for the boutique hotel. 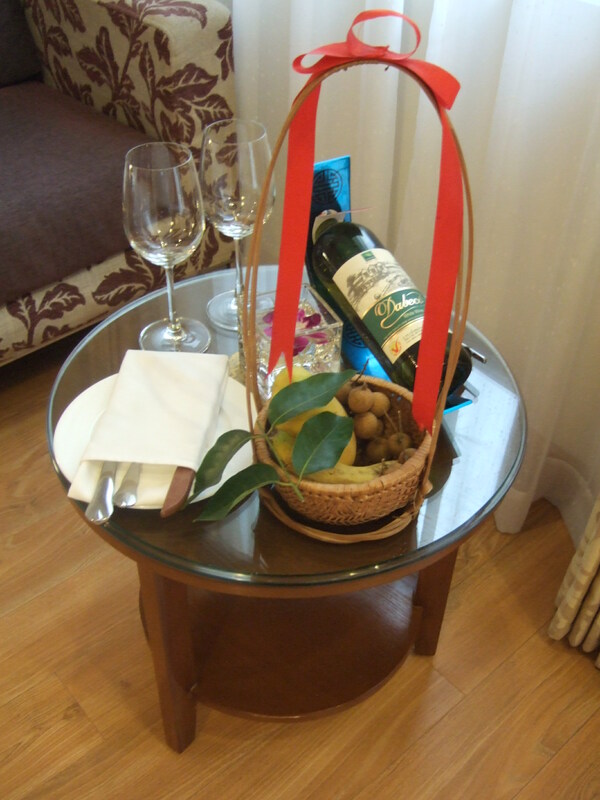 Staff lavishly welcomed us with broad grins, inquiries about our time in Sapa, and an offer of an upgrade at their proximate “sister hotel,” the Hanoi Elegance Diamond Hotel, adjacent to Hoàn Kiếm Lake. While waiting to be transported from the Elegance Ruby Hotel to the Elegance Diamond Hotel we were afforded fresh plump towels and shower facilities to freshen up after our overnight train ride. 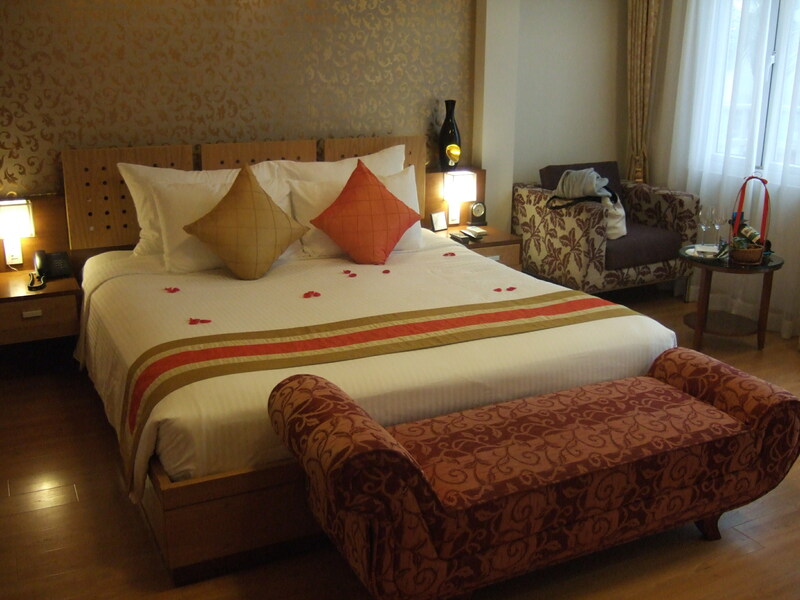 We ultimately decided, however, given the choice between a luxury room at the plush Elegance Diamond Hotel and an adequate sized room at the Elegance Ruby Hotel, we preferred the personalized consideration of the smaller boutique hotel. The Elegance Ruby Hotel staff was clearly appreciative. 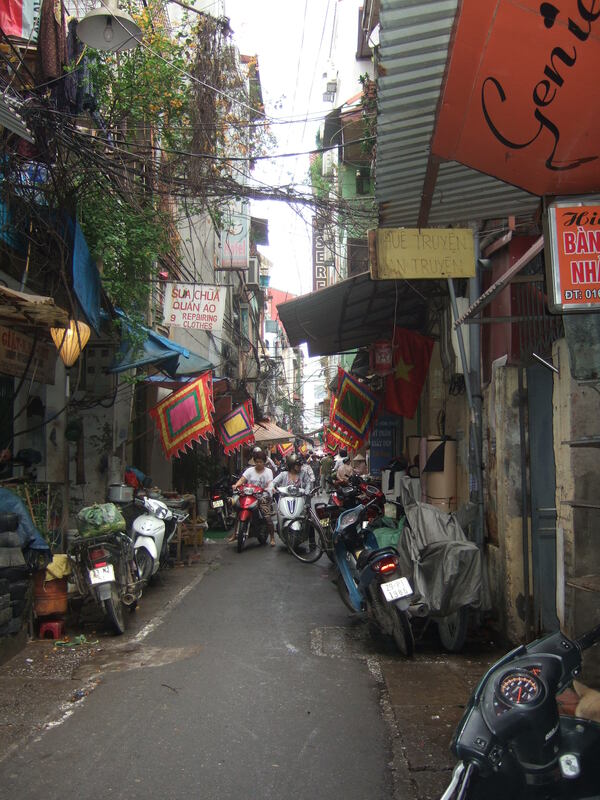 Mottled alleyway of Hanoi Elegance Ruby Hotel. After our protracted and fitful train ride we were primed for our traditional Elegance Ruby Hotel breakfast feast of two omelets with ham, mushroom, onion, and cheese; two pancakes with pineapple, banana, honey, and lemon; French toast with syrup; and beef noodle soup. And our meal was not complete without our Vietnamese milk coffee and fresh carrot juice. 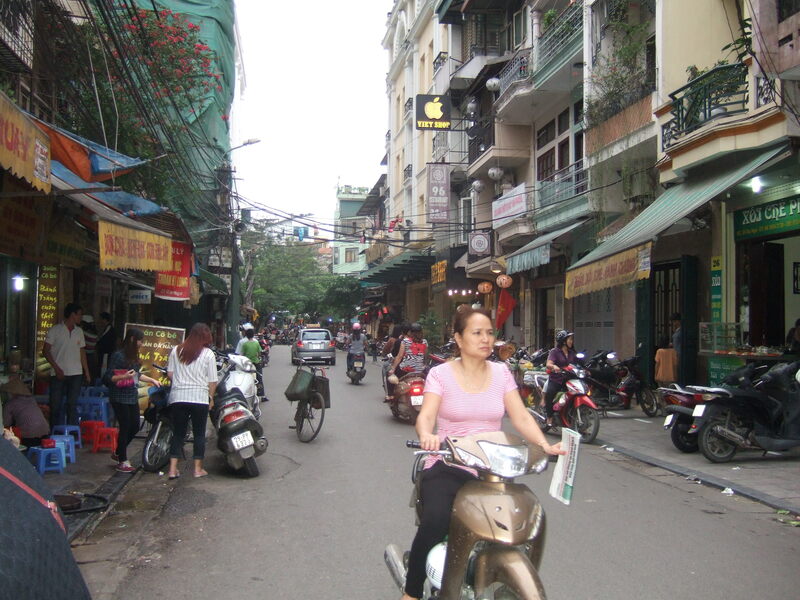 Satiated and energized, we ventured onto the frantic and appealing streets of Hanoi’s Old Quarter. Sauntering through the historic city we maneuvered past shops and markets brimming with people, souvenirs, crafts, clothing, shoes, herbs, fruit and vegetable stands, raw meat, an improbable fusion of smells, and tiny cafes with plastic chairs arranged haphazardly on the adjoining pavement. While dodging motor scooters filling the streets and sidewalks, as well as pedestrians, pole vendors, bicyclists, and shopkeepers, crisp memories flooded back of our first two recent sojourns to Hanoi; the first our inaugural visit at the outset of our trip to the capital city, and the second sandwiched in between our excursions to Halong Bay and Sapa. 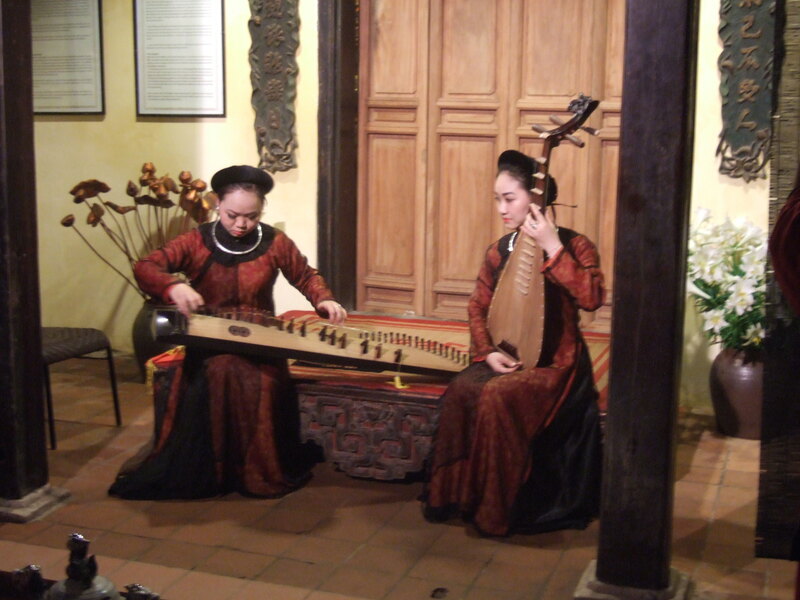 Never know what you’re going to find in Hanoi’s Old Quarter. 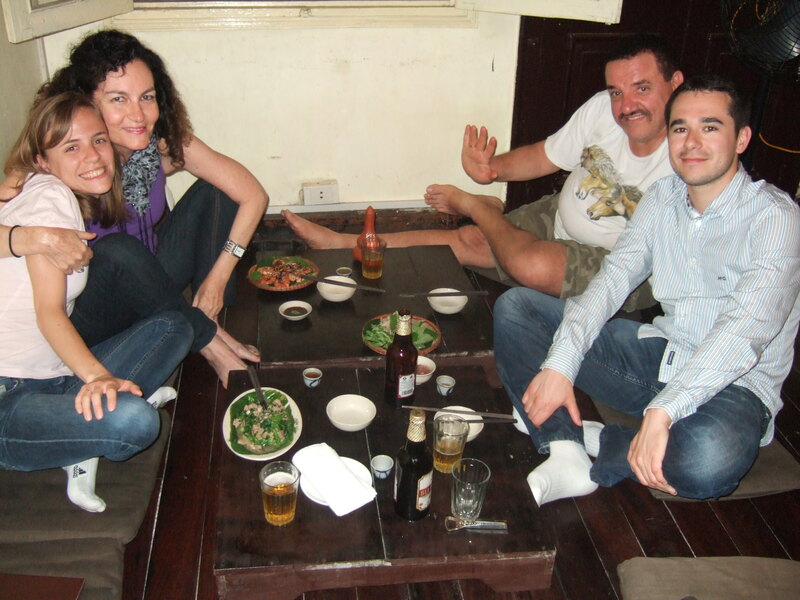 Our favorite “hole in the wall” Hanoi restaurant. 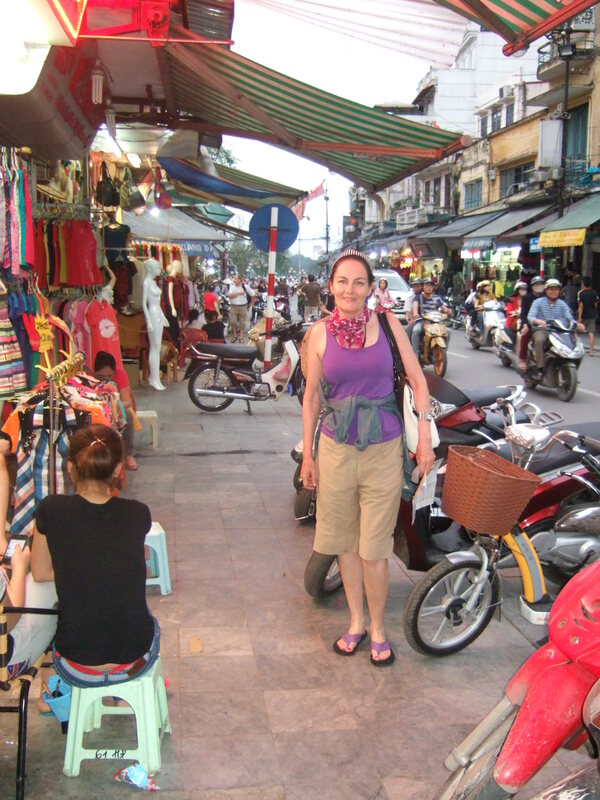 Our initial visit to Hanoi, only days before, had Bishara clenching my hand and plucking me from the path of scooters and mini-trucks careening alongside us on the slender bustling roads. 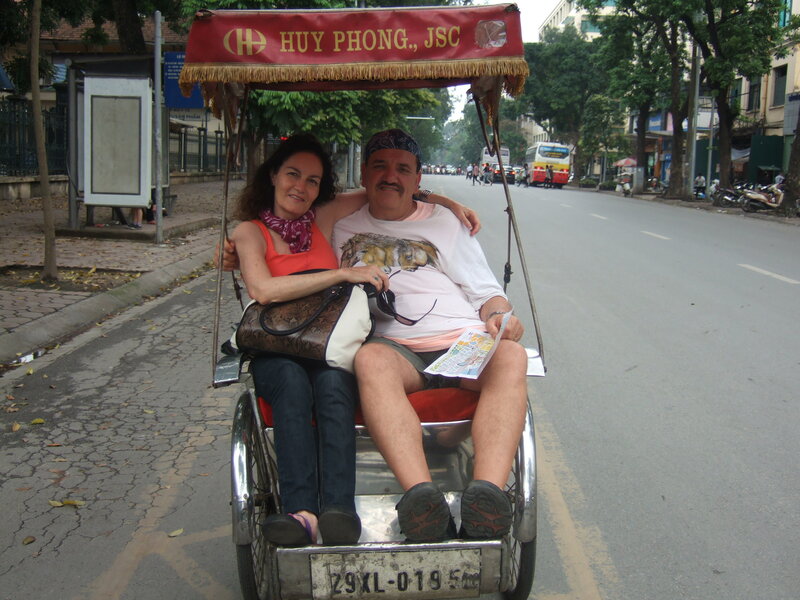 By our second and third Hanoi trips, however, Bishara seemed to gradually discern Vietnamese drivers’ impeccable sense of timing and clearance with his grip on my hand diminishing. 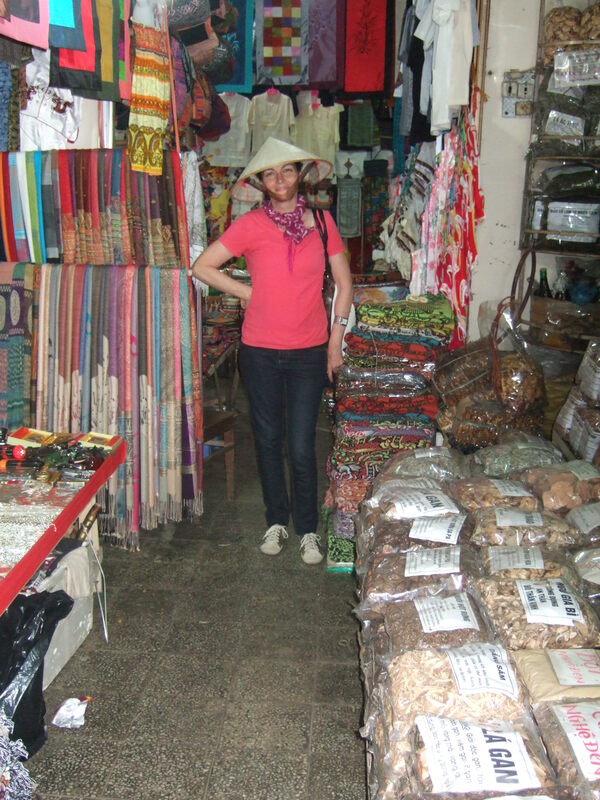 The newfound confidence gained by our middle trip to Hanoi found us seeking out a hair salon where we both had our hair done and accepting Hanoi beer and flavorful oversized sweet potatoes from our hair stylist who had her assistant run out and purchase the goodies from a street vendor. 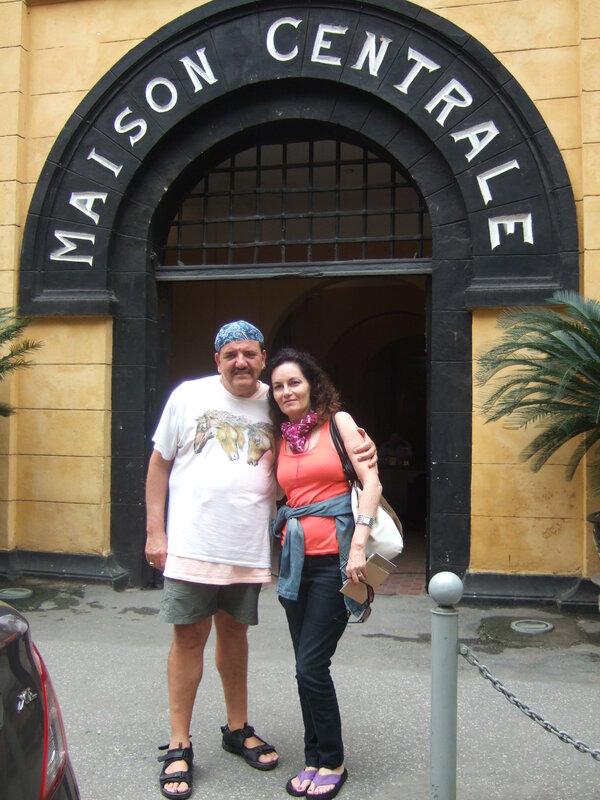 We also had the fortuity of encountering other affable globetrotters with whom we shared travel stories, as well as a meal in the fanciful French Quarter. Dinner in “French Quarter” with newfound friends. Exploration of Hanoi’s Old Quarter widened the following day with visits to the Temple of the Jade Mountain (Ngoc Temple) containing multiple arrays of edible and vibrant floral Buddhist offerings, and trips to the History Museum, Hanoi prison (Maison Centrale), and Women’s Museum all via the colorful and unorthodox, yet popular, three-wheeled cyclo powered by a wrinkled Vietnamese man providing commentary on significant sights. 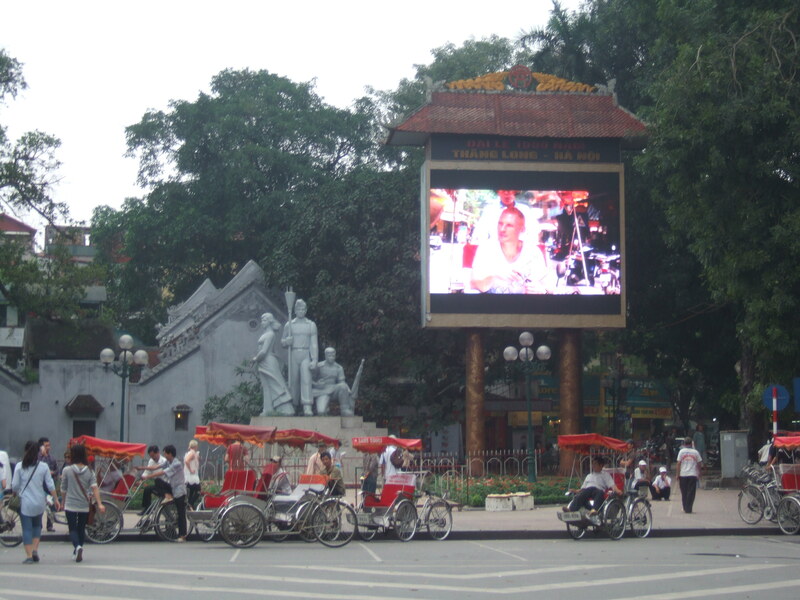 Travel by cyclo, part bicycle and part extended sideways seat for passengers, an experience in and of itself, afforded us an up close and personal view of traffic pandemonium and the constant near misses of vehicles, scooters, bicycles, and pedestrians, as well as an expanded view of life in the Old Quarter. 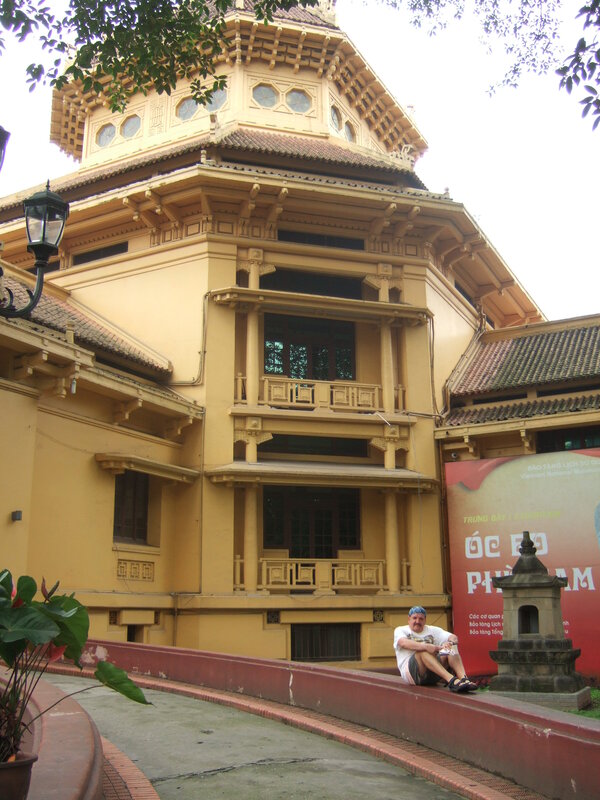 When leaving the Women’s Musuem in the late afternoon, we spied our cyclo driver with a middle-aged Vietnamese man puffing on a bamboo water pipe, and, moments later, handing the pipe over to our driver who stuffed the apparatus in a side pocket of the cyclo. 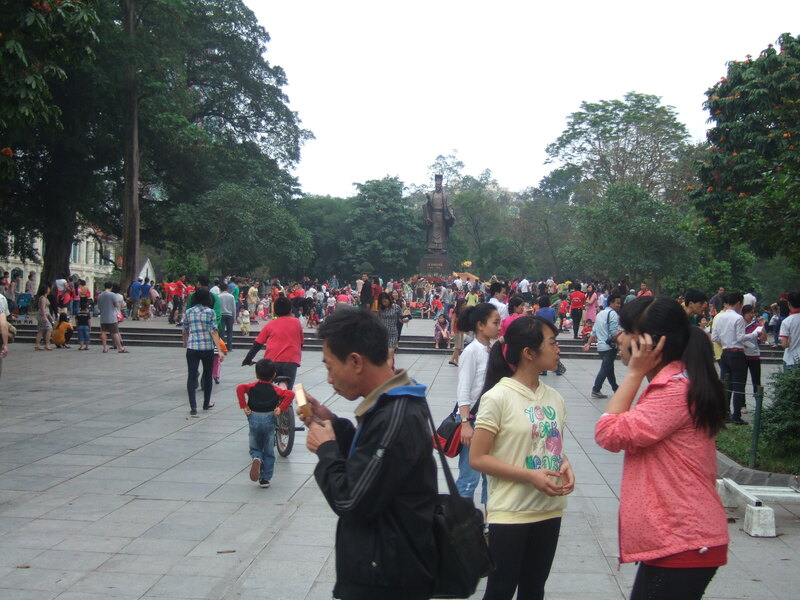 Evidently, the smoking of water pipes is a rather significant element of Hanoi social life for some, as our cyclo ride allowed us several sightings of men enjoying the effects of water-based tobacco outside of shops and residences. One in fact, with pipe uplifted, attempted to wave us over to his sidewalk vantage point, presumably to join him in the pleasurable pursuit of water pipe smoking. Although having indulged in “hubbly bubbly” countless times while living in the Arab Gulf, we erred on the side of caution and declined. 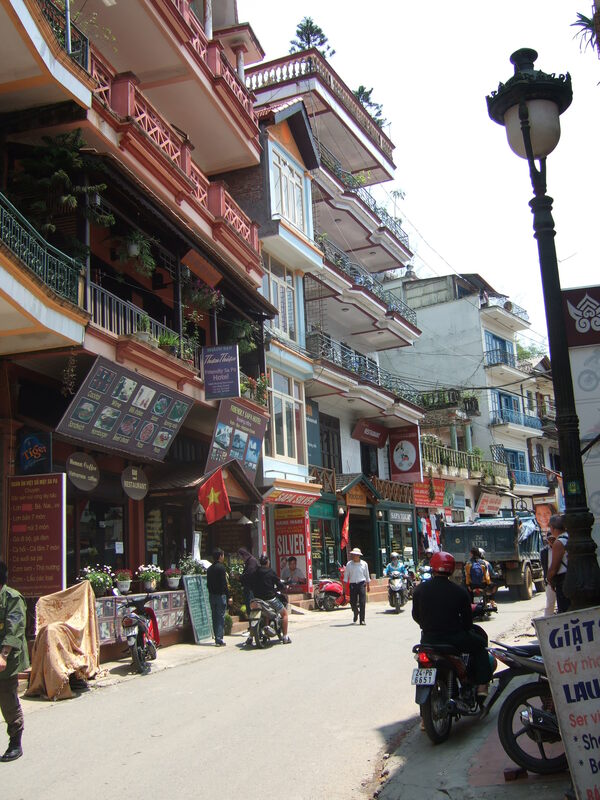 By our final full day in Hanoi, we felt like seasoned guests of this enigmatic city, and comfortably criss-crossed the Old Quarter on foot, taking in massages at a traditional Vietnamese spa; Bishara enjoyed an aromatherapy massage and I opted for a warm stone massage. Relaxing beyond expectations, we both went limp with any vestiges of tension and strains drifting away. 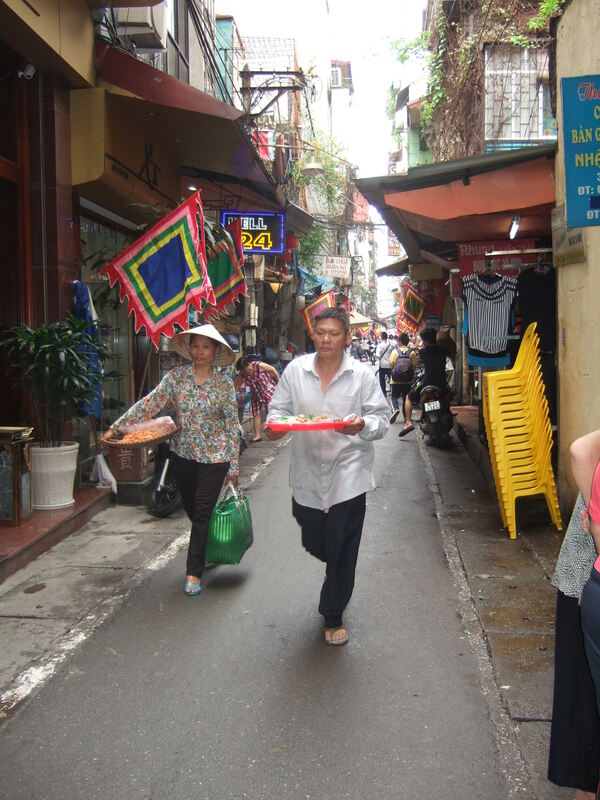 We left the spa floating, and incognizant of the bustling crowds around us, as we wandered through the humming markets and roadside shops where vendors approached us and we succumbed several times buying t-shirts for Bishara and embroidered paintings depicting Vietnamese life for me. 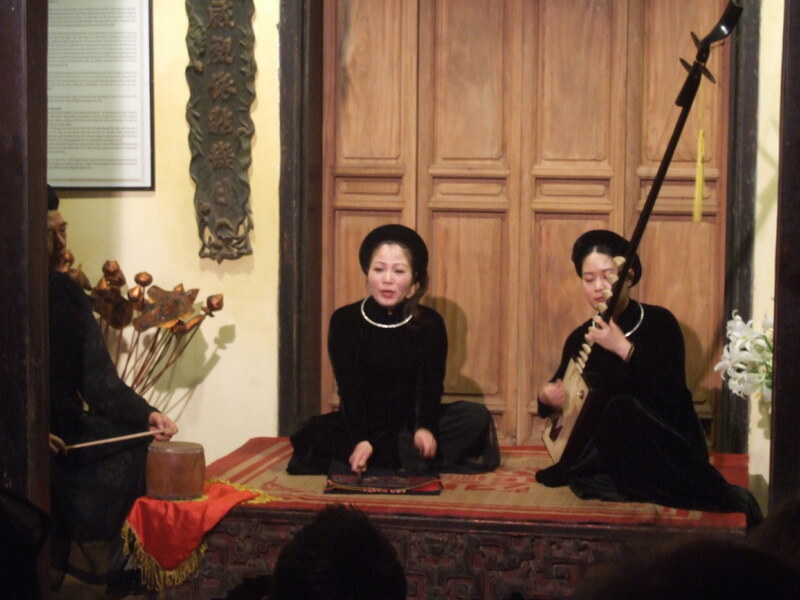 Our last night in Hanoi was filled with traditional music and singing; an enchanting evening. Feeling refreshed and relaxed after our massages. Enjoying an evening of folkloric Catru music. 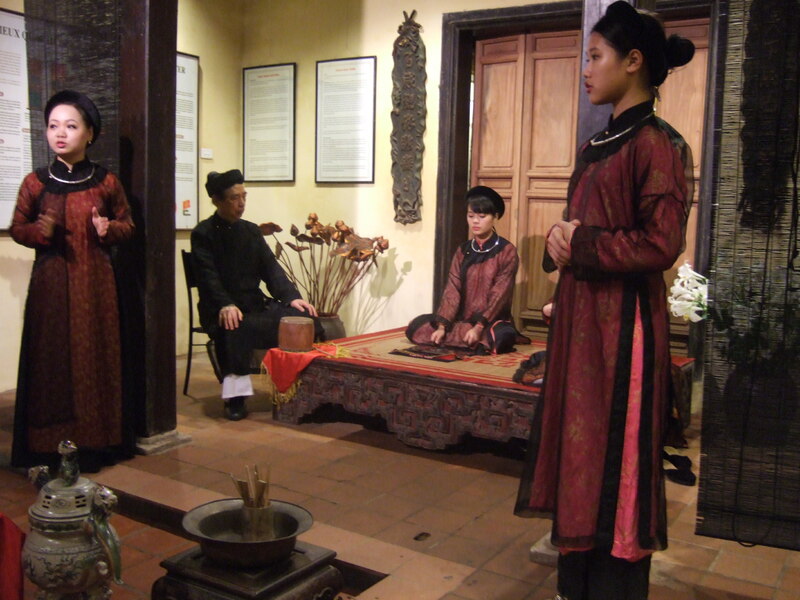 In the hours before making our way to the Hanoi airport on our last day in Vietnam, the Elegance Ruby Hotel staff encouraged us to make the time to visit the Ethnology Museum, as it was apparent we had treasured the time spent among the Hmong people of the Sapa region. 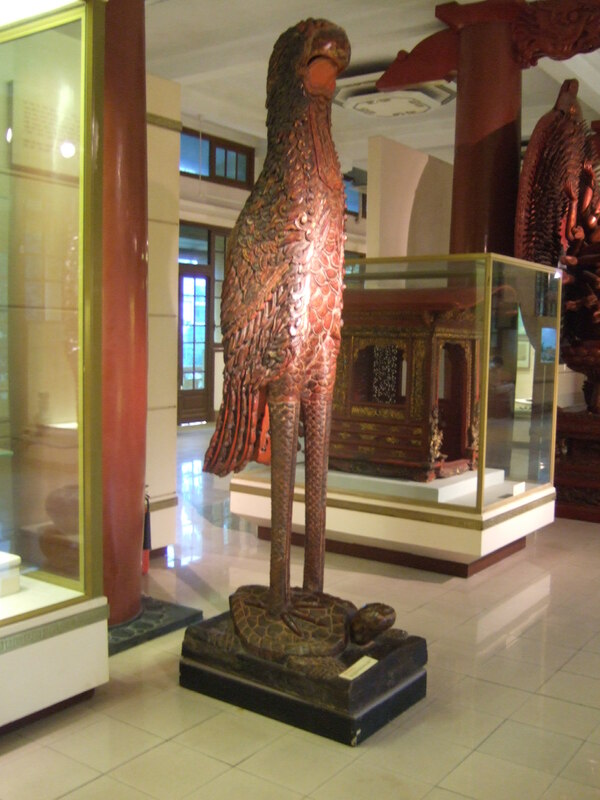 Although we had to rush our packing and showers, and arrange for a fast-moving cab ride, we were pleased we took the time to see the Museum, as it was fascinating and enlightening to view artifacts, crafts, and scenes focusing on the lifestyle and traditions of the various Vietnamese ethnic groups. 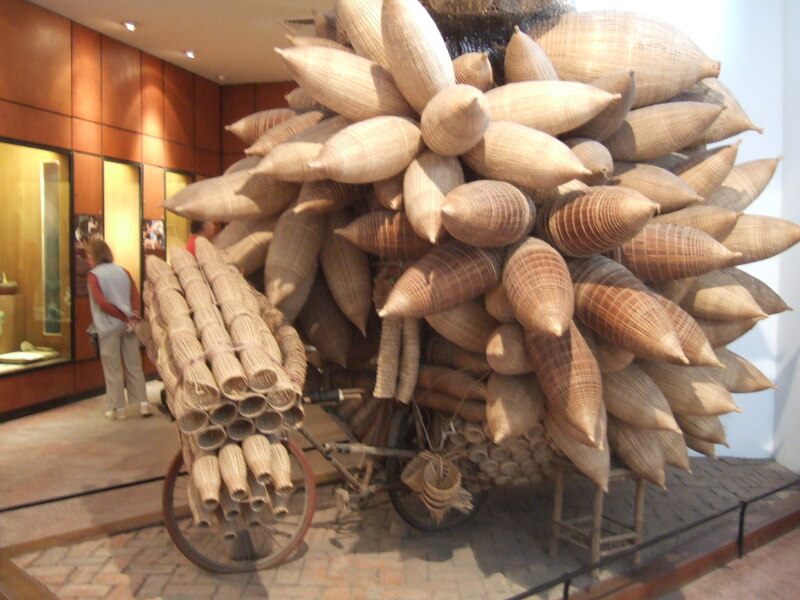 See the bicycle under all those baskets? Before we knew it, we were bidding farewell to the exceptional staff of the Elegance Ruby Hotel and in a taxi for the airport. 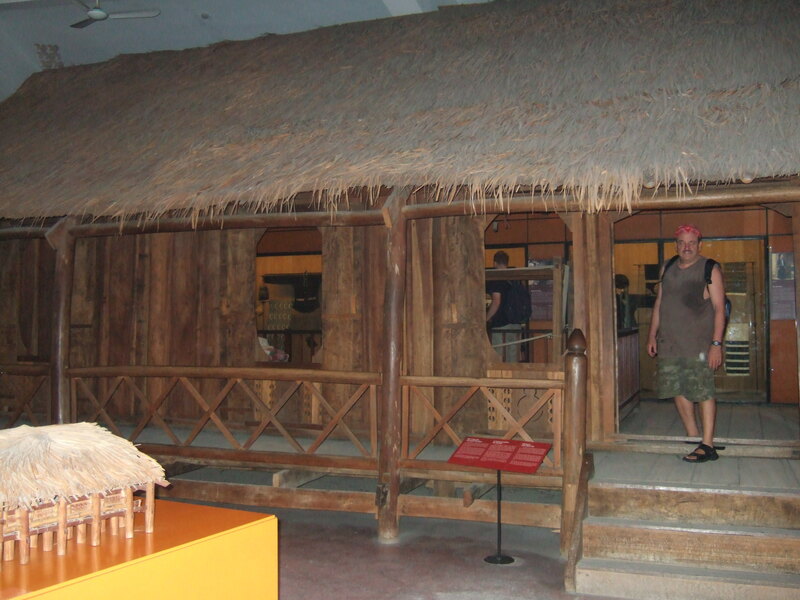 Our first night home in Doha, I had a continuous and vivid dream that I was in Vietnam living in a hut on the side of the road! . 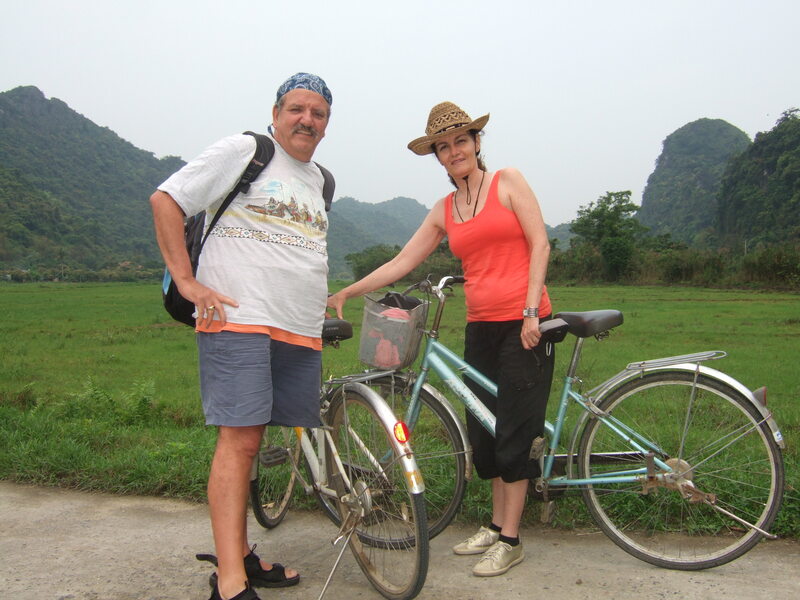 . . Vietnam certainly seemed to touch our souls; we look forward to returning to this irresistible land. 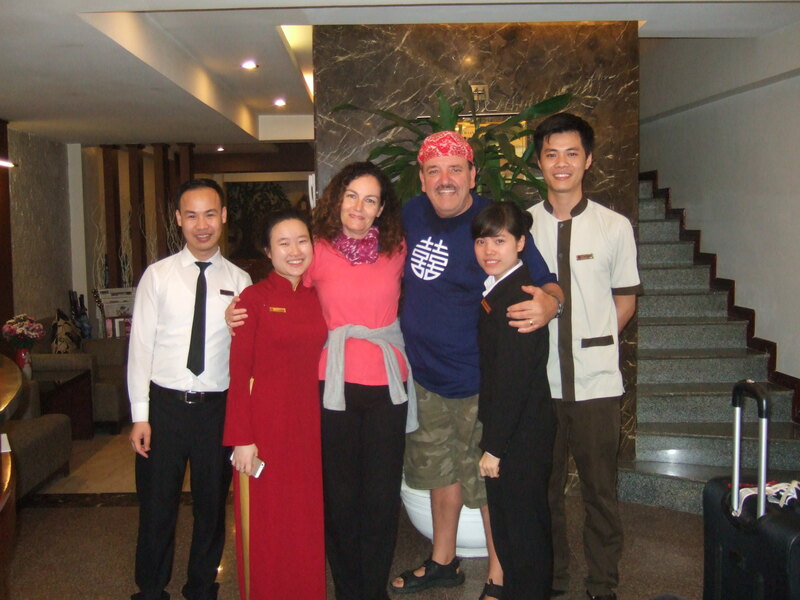 Saying “goodbye” to wonderful staff of Hanoi Elegance Ruby Hotel. 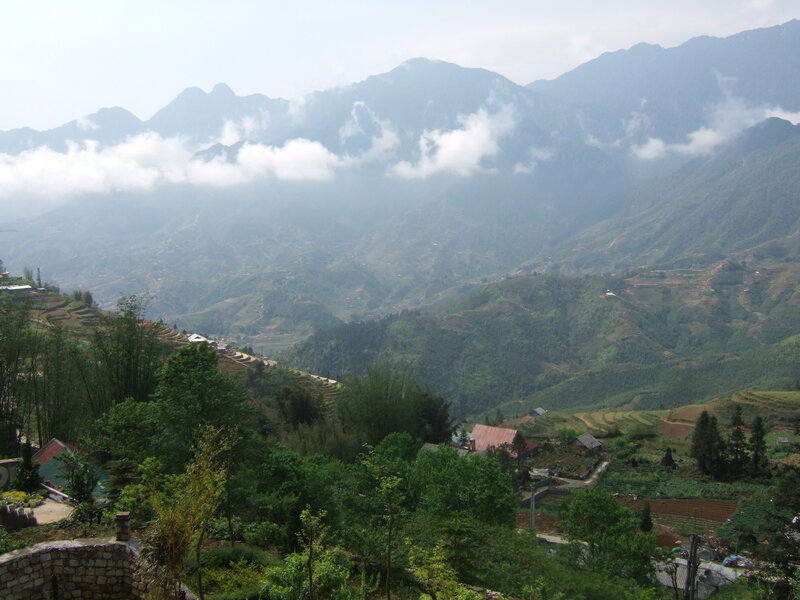 We had lumbered up Dragon’s Jaw, a prominent peak in Sapa boasting magnificent views and glorious gardens, just the day before, and were now looking forward to visiting the small neighboring Hmong mountain village of Ta Van. 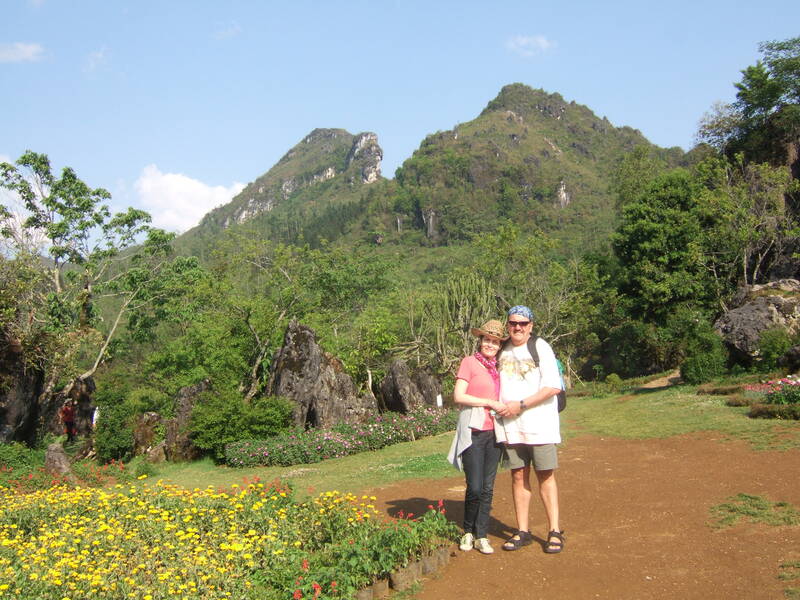 Although good weather, sunshine and mid-60 degree temperatures, cradled us throughout our climb of Dragon’s Jaw, the morning of our outing to Ta Van was different. Heavy rain had fallen for much of the night before, and morning fog and drizzle threatened to thwart our excursion to the tiny village in northwestern Vietnam. 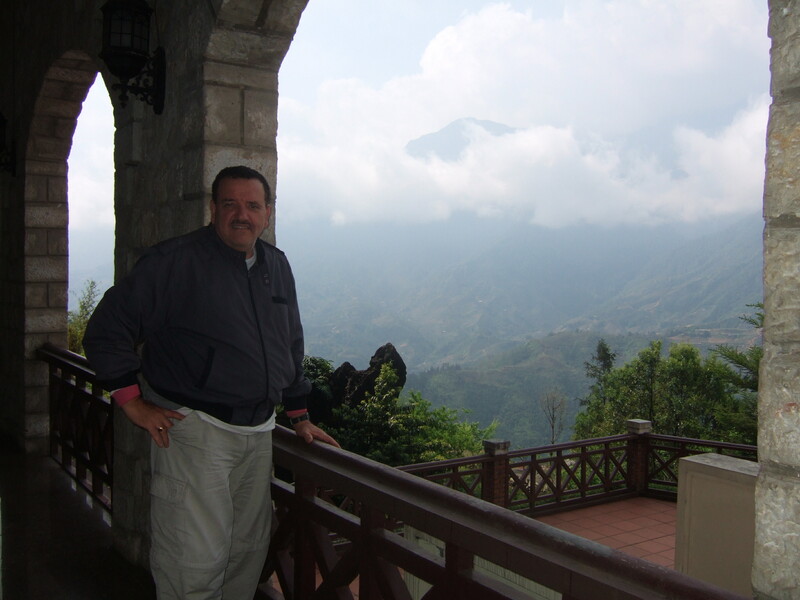 Thankfully, following a breakfast buffet of cheeses, cold cuts, “made to order” omelets, carrot juice and Vietnamese milk coffee, accompanied by splendid views of the Hoang Lien Son mountain range, the weather broke perceptibly and became simply cloudy. 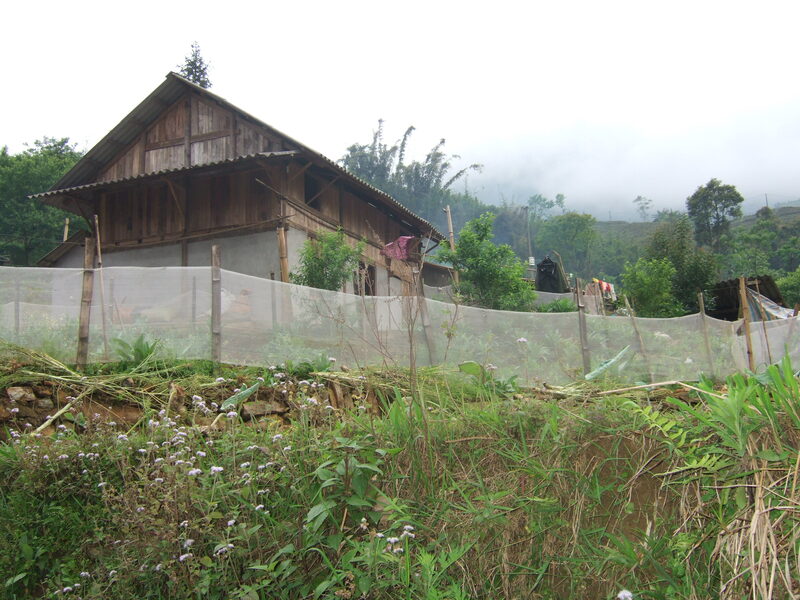 By late morning, we forged a calculated risk that showers would abstain during our jaunt through Ta Van, and booked a car to drive us the 10 kilometers from Sapa to this popular village. Our driver, serious in demeanor with scant English, arrived in the early afternoon and brusquely signaled for us to slide into the van. We pitched along the mountain passes affording us more beautiful glimpses of the “Tonkinese Alps.” These alluring images were in stark contrast to the children with soiled clothing and unkempt hair traipsing along the roadways, hands outstretched, as we passed, imploring us to stop, presumably for spare change. 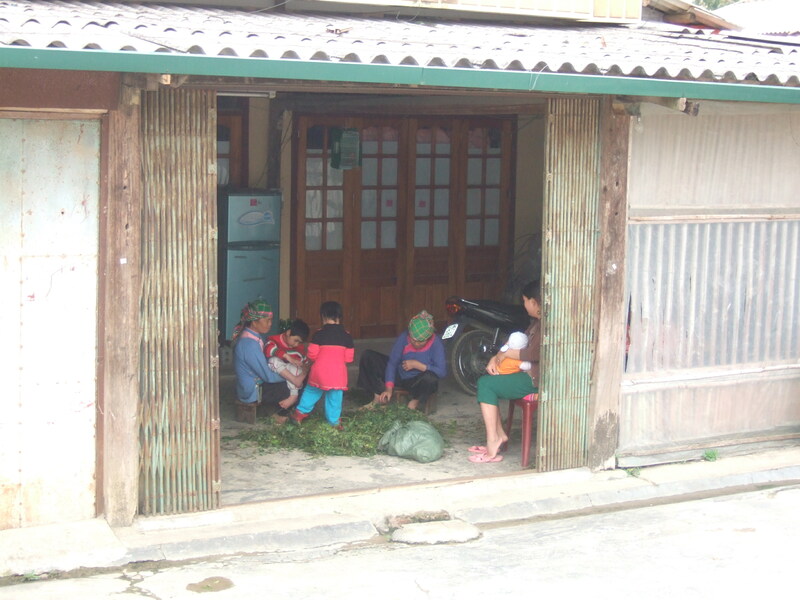 We paused just outside Sapa to take photos at a viewing station, and were quickly mobbed by five young children who, rather forcefully, motioned for us to buy trinkets from them. 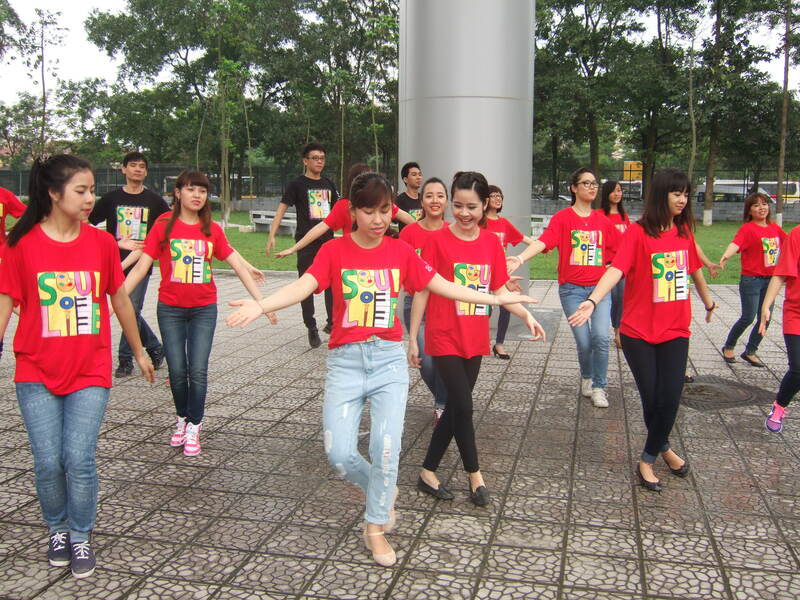 Taken aback, and feeling conflicted over the challenging lives these youngsters must lead versus perpetuating this type of demeaning soliciting activity, we dolefully decided to move on. 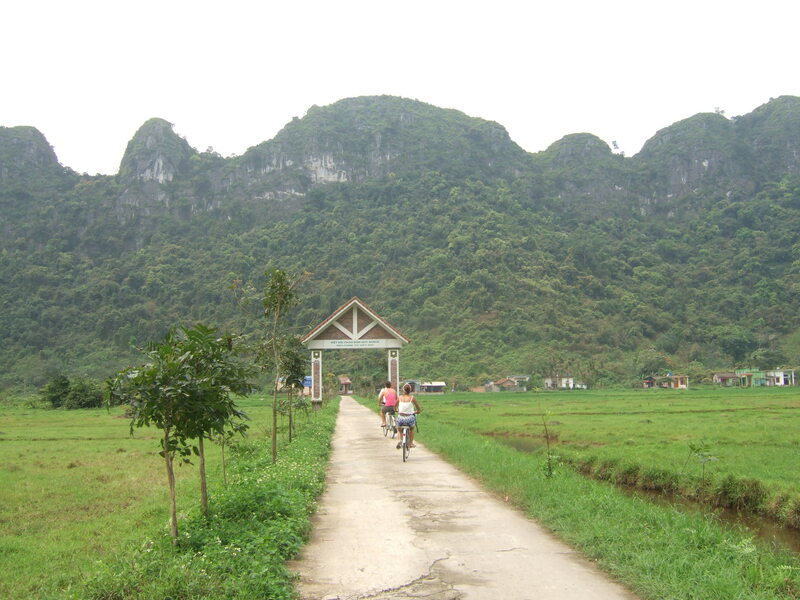 Before reaching the village, we stopped at a booth on the side of the road where we paid a 15,000 Vietnamese Dong (70 cent) entrance fee. 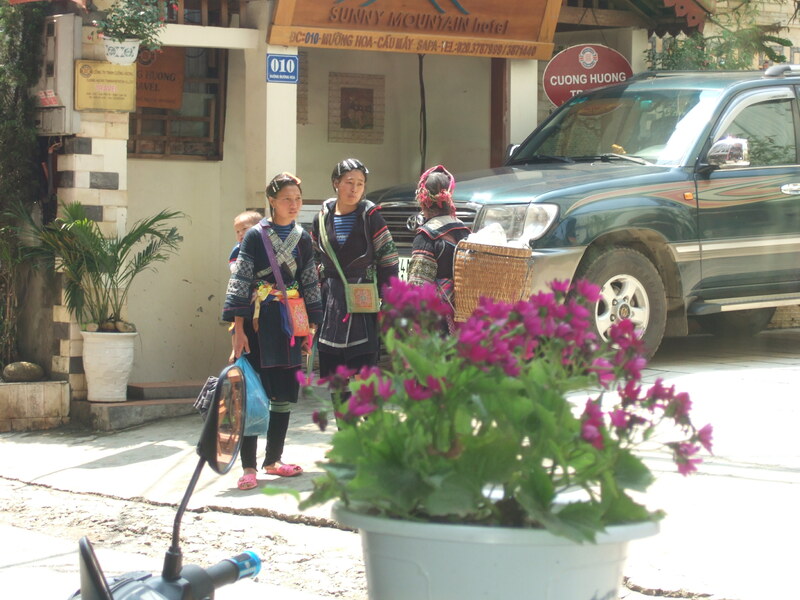 Arriving at the visitor parking lot designated for Ta Van visitors, we disembarked from the van, expectations high. 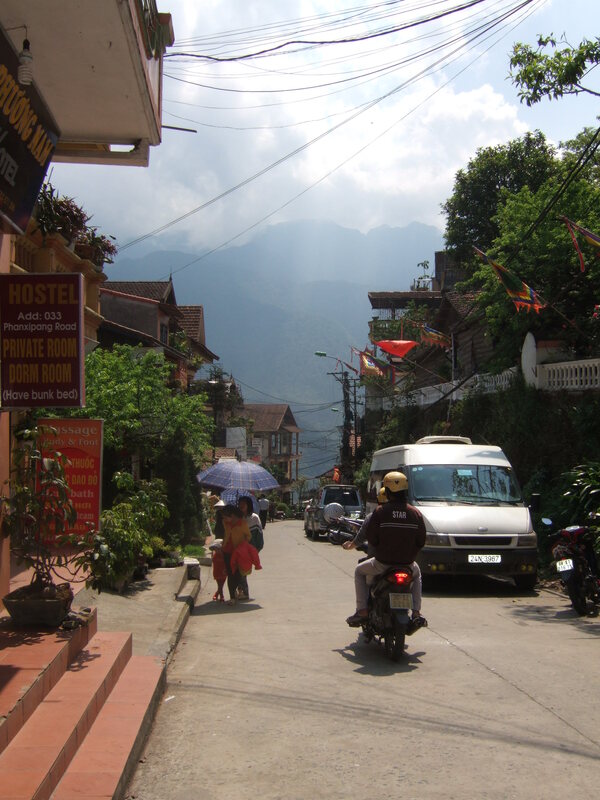 When arranging for a driver to take us to Ta Van, the hotel receptionist inquired if we required a guide to accompany us. 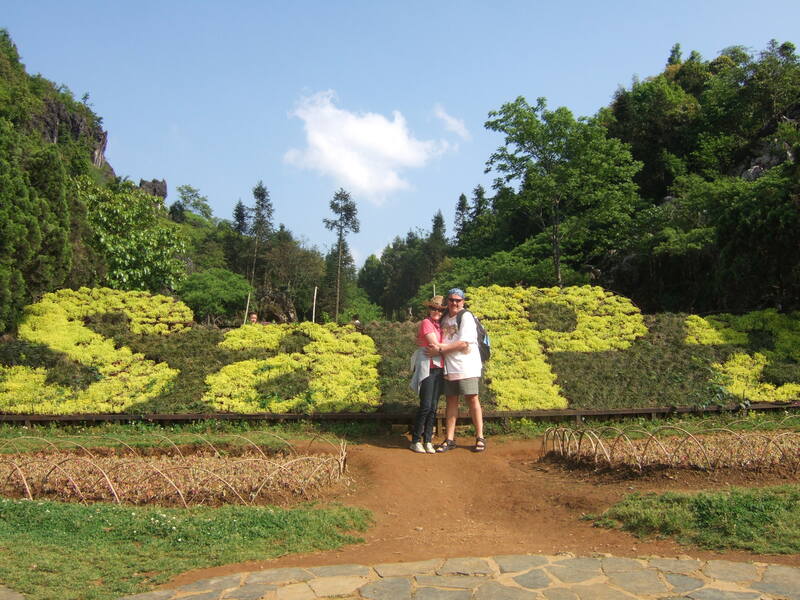 We responded with being partial to going it alone, as we did not want to be confined solely to the guide’s itinerary. 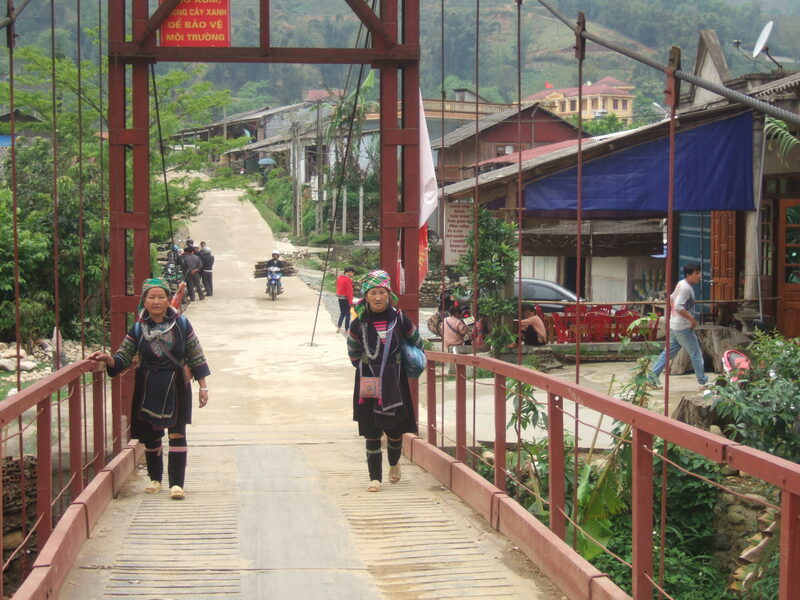 Crossing a steel plank bridge tinted with maroon hues, we were met by ethnic Hmong women leaving the village on foot for destinations unknown. 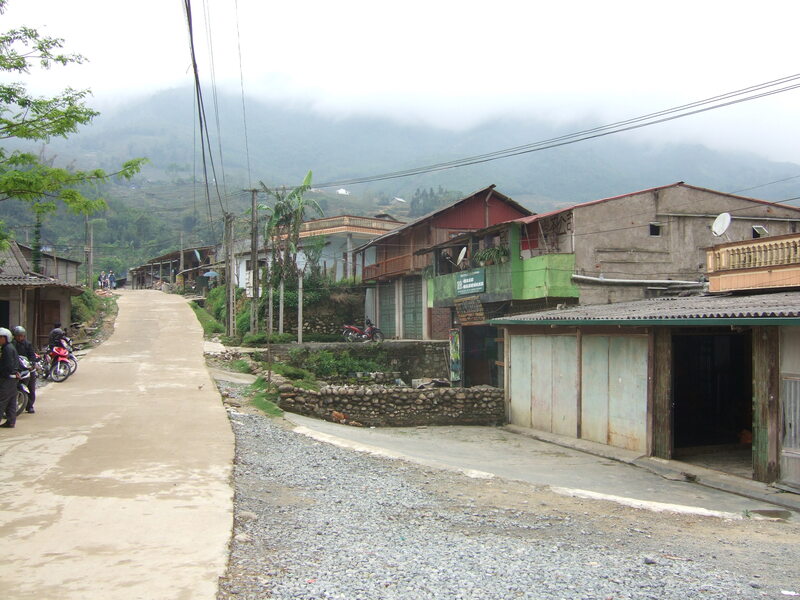 The village’s main thoroughfare was spattered with residences, and what looked to be family shops, including household and food markets, and motor scooter repair garages. 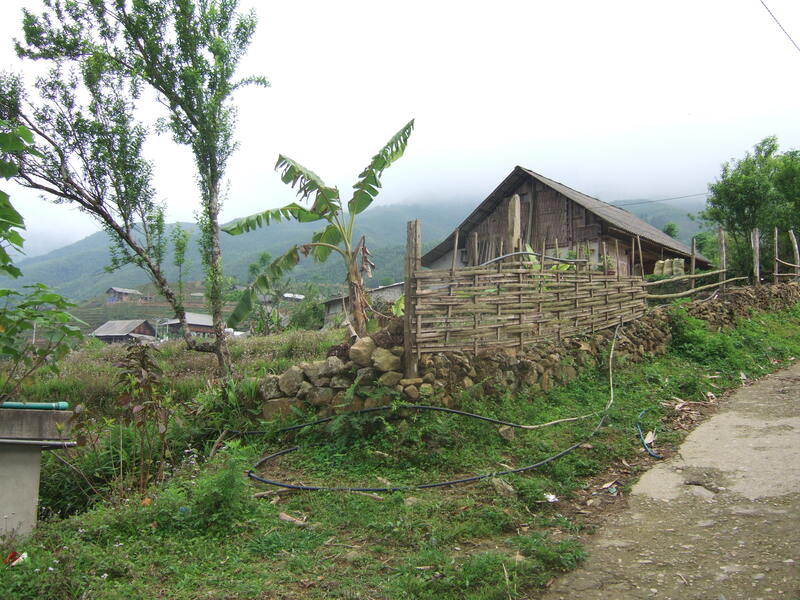 Once in the village, we spotted other tourists, similarly intrigued, roving the primary road and bordering hills of this compelling community. 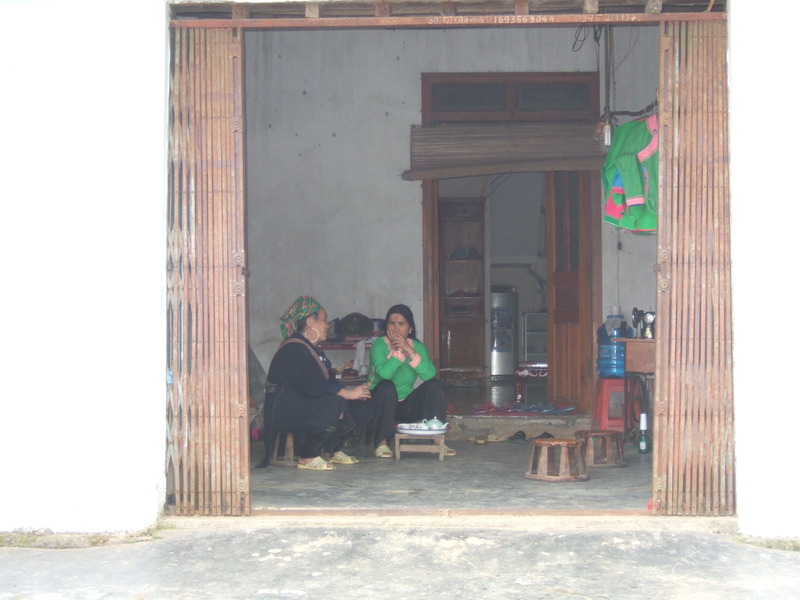 Although not wanting to intrude, I felt impelled to take pictures of families in their homes, through large open air entryways; kinfolk engrossed in routine daily activities, with only a passing interest in our fascination with them. 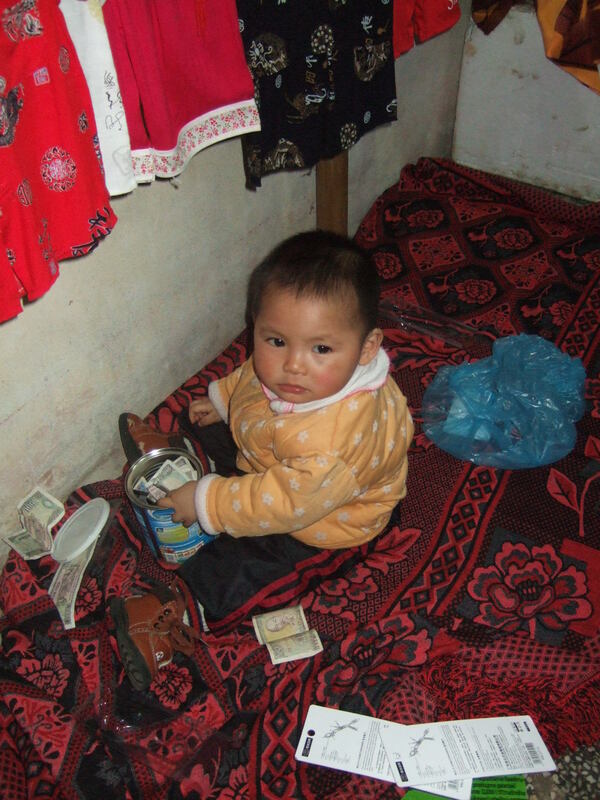 These families likely considered us a necessary nuisance woven into the fabric of their lives and commercial existence. 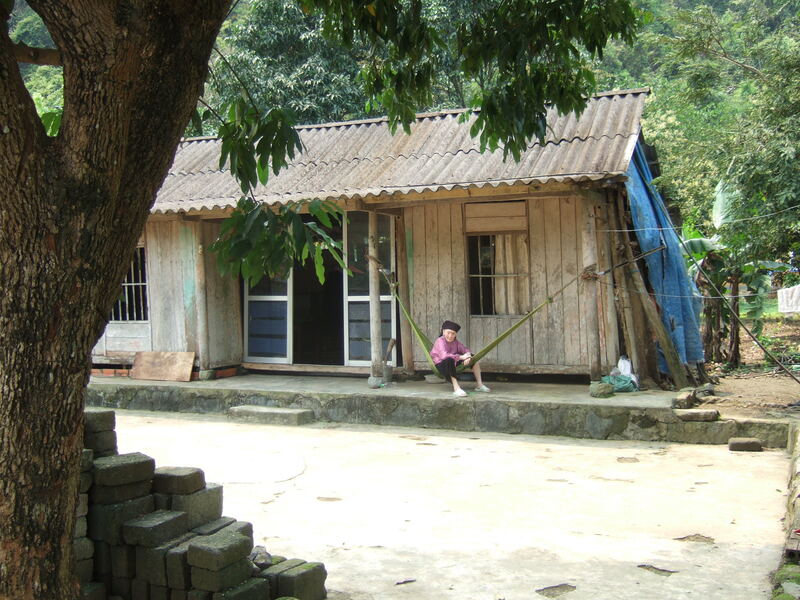 Family life in Ta Van residence. 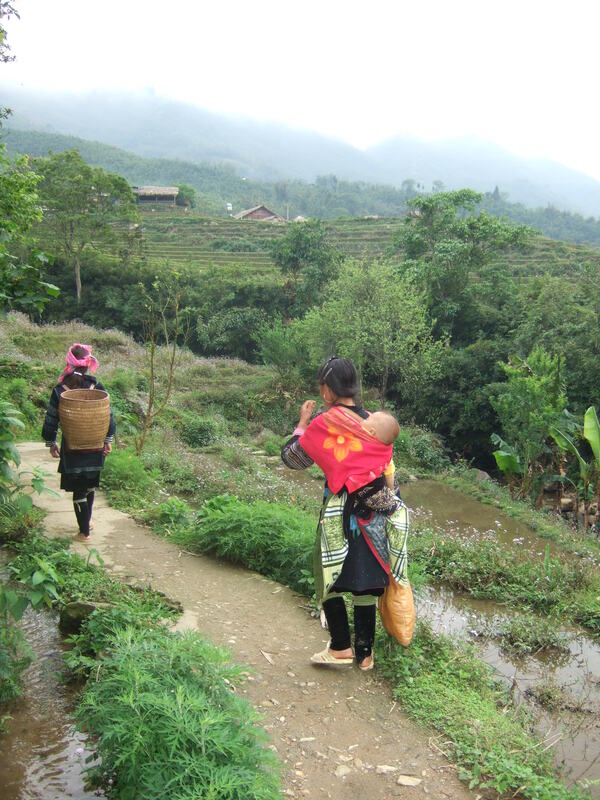 Making our way along muddy hillside paths, we were enraptured by the uncomplicated and unpretentious lives of the Hmong. 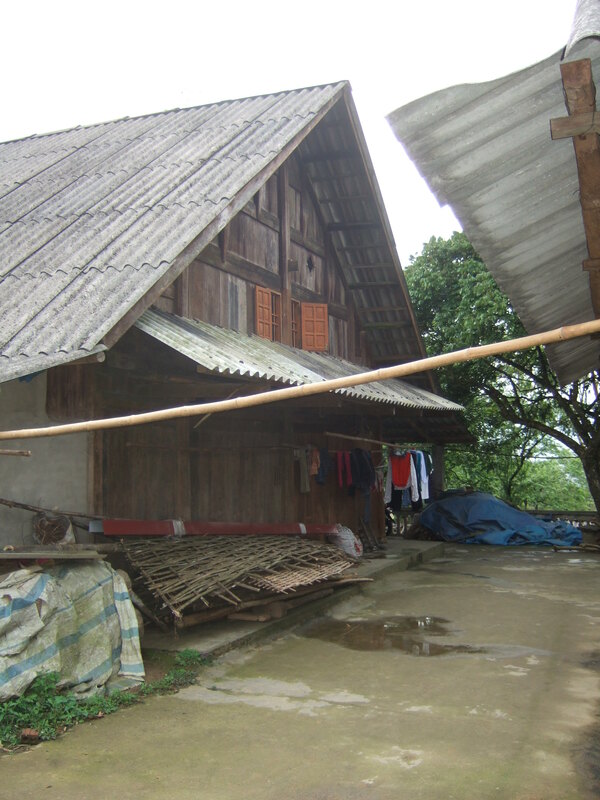 Simple wooden structures with tin rippled roofs, a couple of dogs lazing outside the front door of a residence, countless terraces of flooded rice paddies, women in traditional garb trudging purposefully along pathways or tending to the fields, all amid luxuriant greenery. 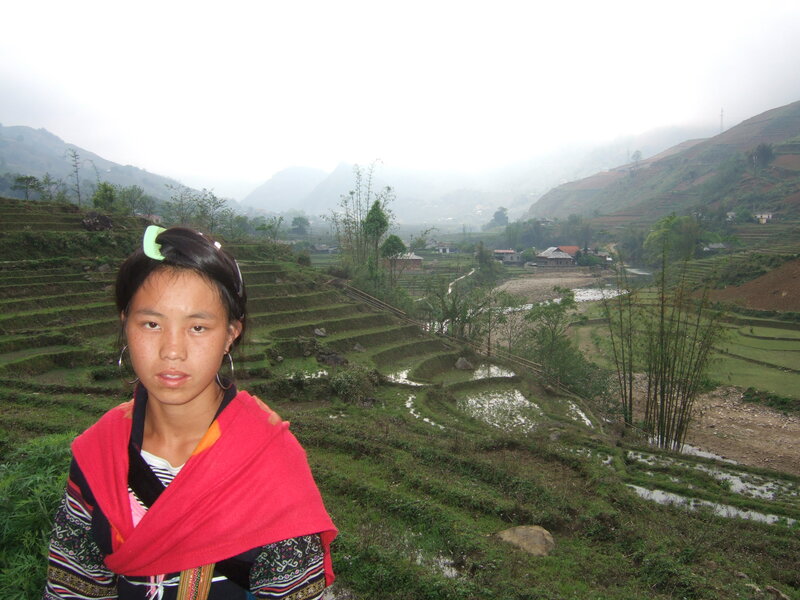 One young Hmong woman who was definitely interested, fell in step with us as we made our slow and deliberate ascent, undoubtedly wanting to launch an exchange. 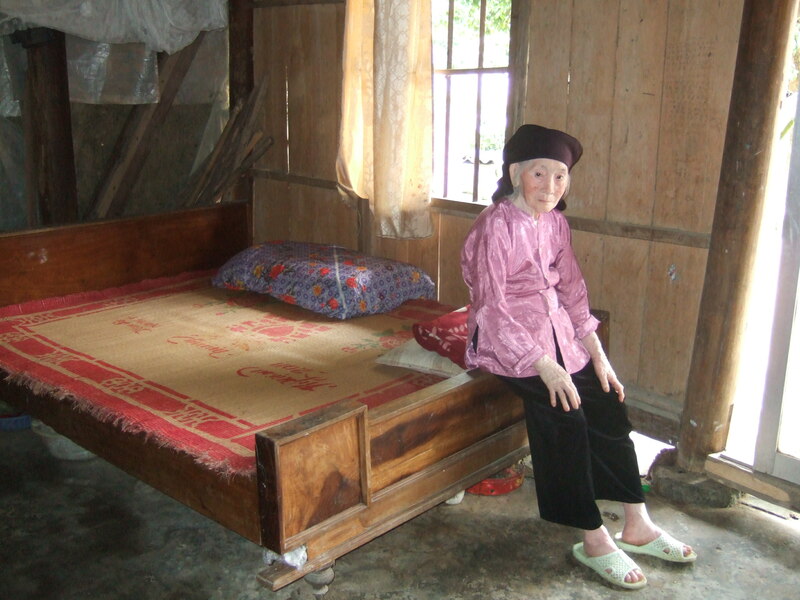 Concerned over another soliciting onslaught, I was dismissive of the potential intruder, while Bishara, reverting to our personal camouflaged language, conveyed that he thought we should engage this young woman, as she might help us maneuver this remote territory and point out interesting aspects of the Hmong lifestyle. Swayed by the argument that the potential learning opportunities from a willing local outweighed the hazards of further solicitations, I acquiesced. 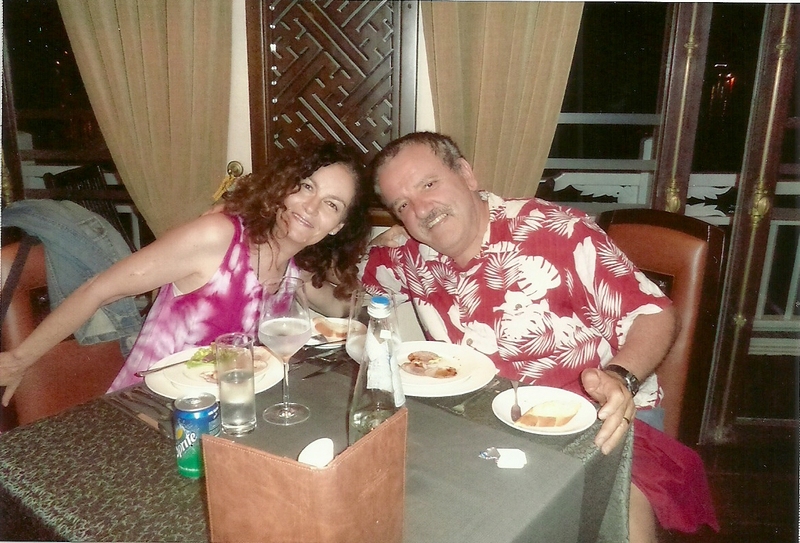 “Hello, my name is Bishara, and this is my wife, Michele. What is your name?” A quizzical look and an unintelligible response. Again, a bit more slowly and assertive this time, “What .. is .. your .. name?” A blank expression. 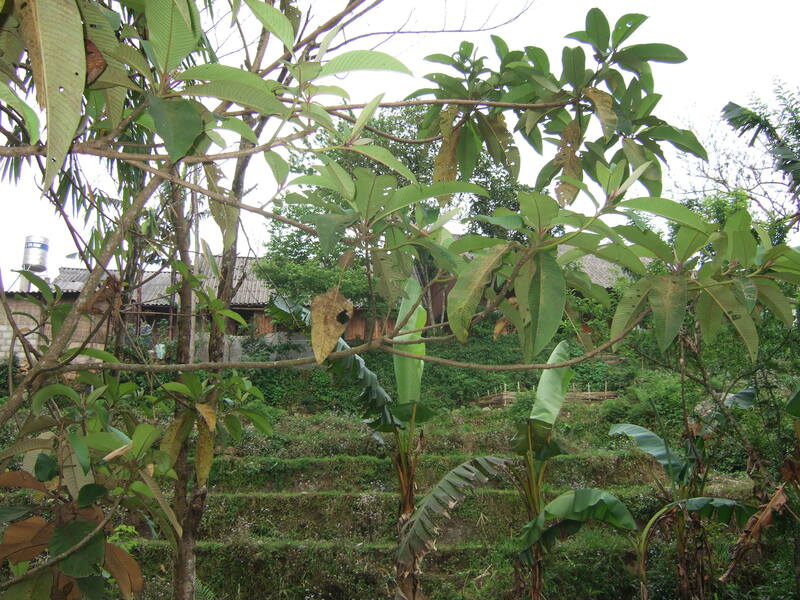 “Ta Van is beautiful,” Bishara persevered. 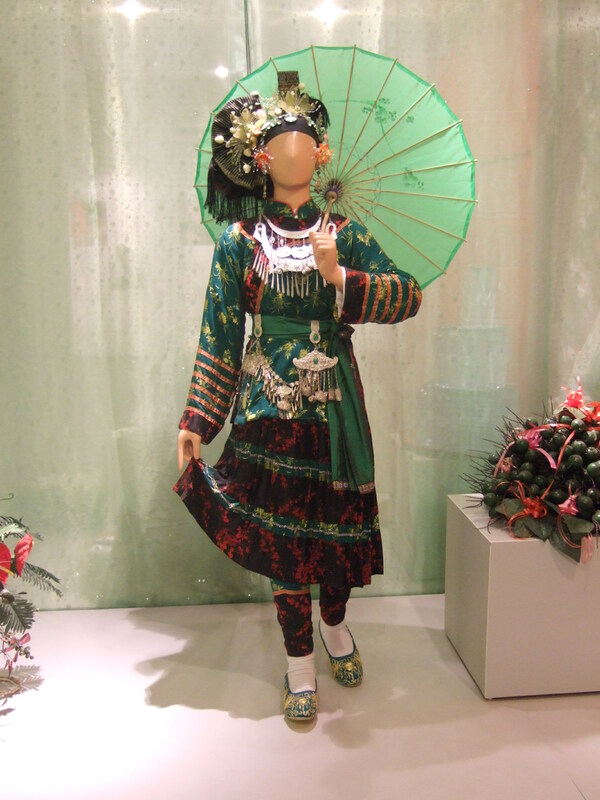 A twinkle of recognition and grin spread across the young woman’s face. 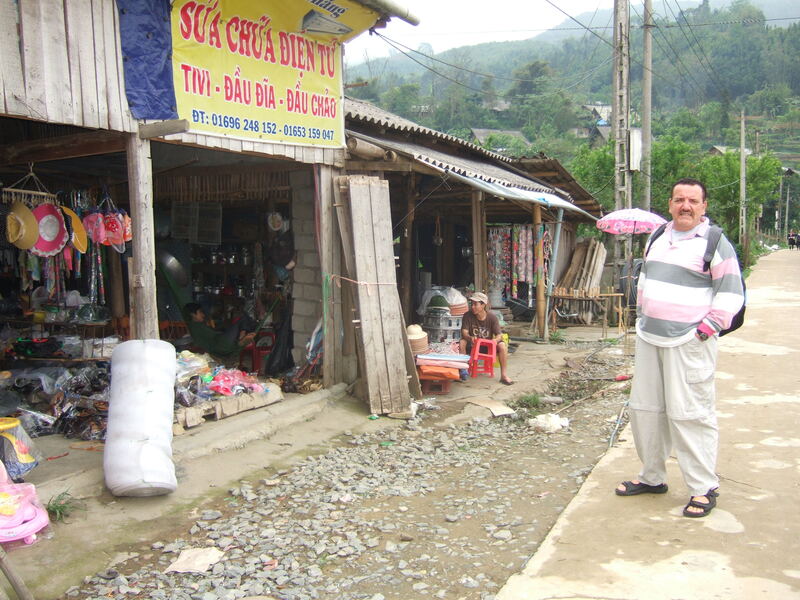 Apparently, hand gestures and elementary English would have to suffice for our time with this amiable villager. 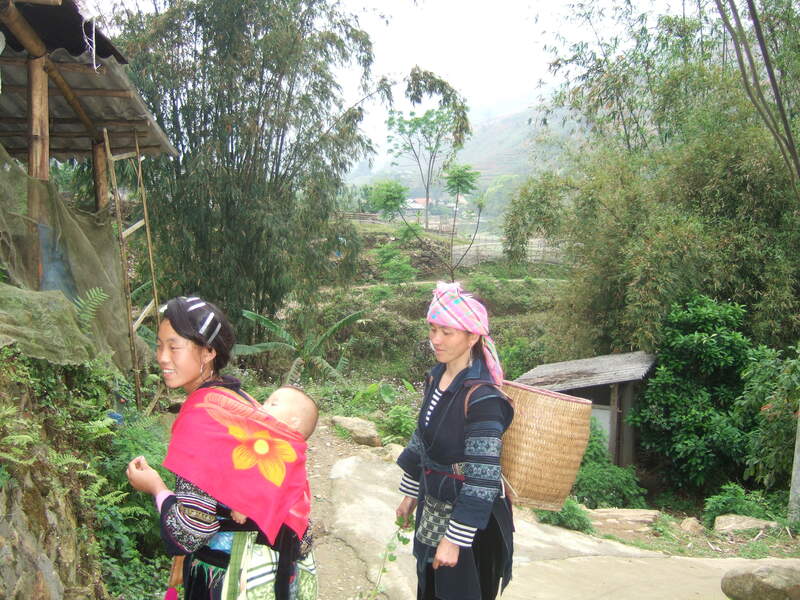 Continuing to amble along a patchwork of dirt paths and paved walkways, our companion in tow, we soon encountered a younger Hmong woman, a baby bundled on her back in a colorful pink scarf. The two young women traded niceties, and barely skipping a beat, were soon both in lockstep with us. 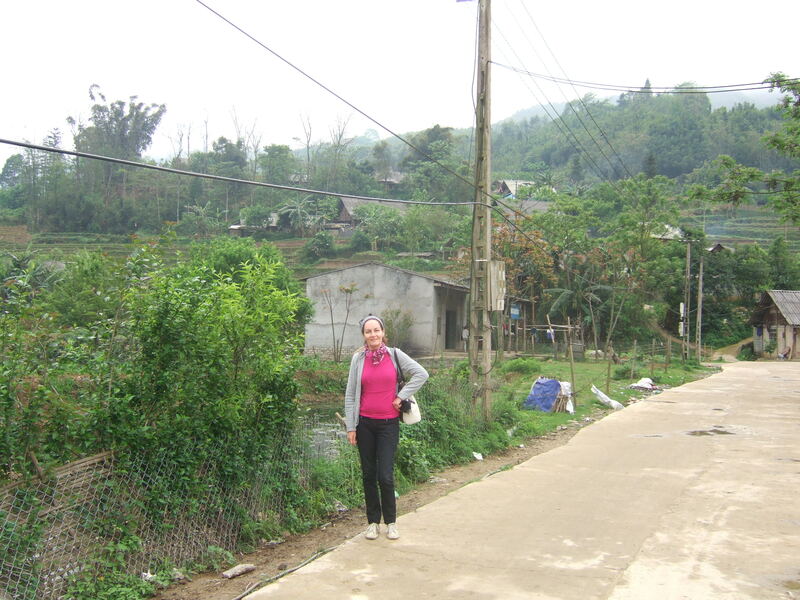 We continued to relish the lush environs and tranquil community along the hillsides, and, at one point, confronted a rushing creek that both women handily skipped over using custom footwork and conspicuous stones. Bishara and I held back, innately fearing a broken ankle or leg in the middle of an inaccessible and undeveloped area with only meager medical services, at best, to rely upon. 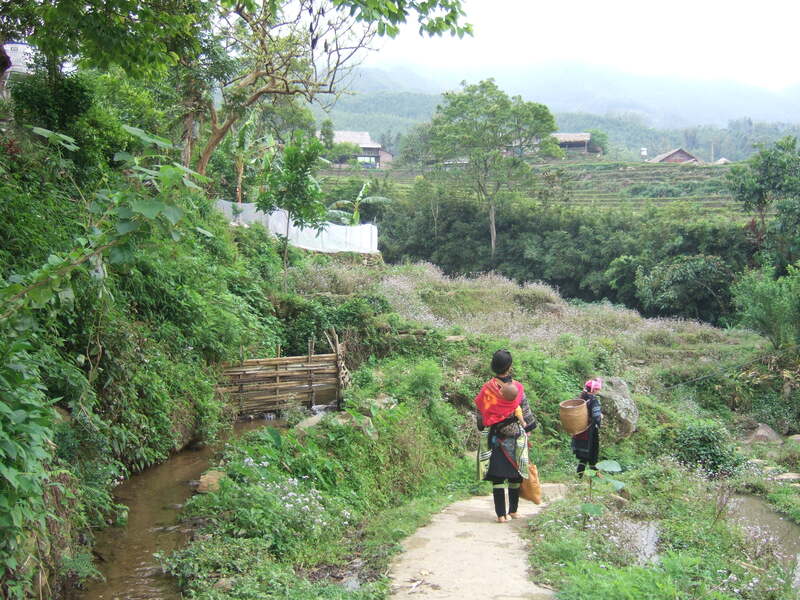 The older of the two villagers crossed back over the creek, and without hesitation, seized my hand, and pointing out the best rocks to use to ensure a safe crossing, boldly and effortlessly led me across the water. Bishara, still on the other side of the creek, appeared rather anxious, as he battles an inherent fear of water. The younger of the two women, with the baby onboard, seeming to sense Bishara’s distress, nimbly re-crossed the stream and graciously extended her hand to Bishara. 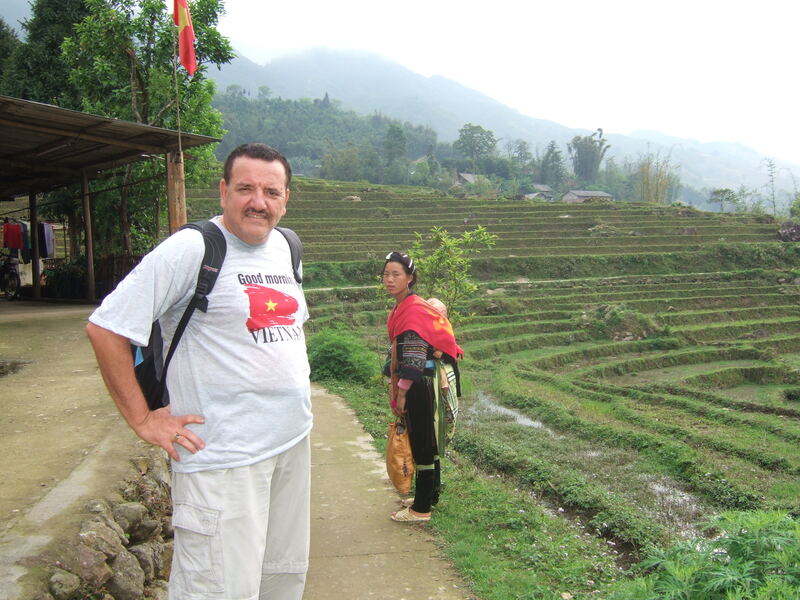 A few hesitant, yet well-placed steps later, and Bishara was across the creek. 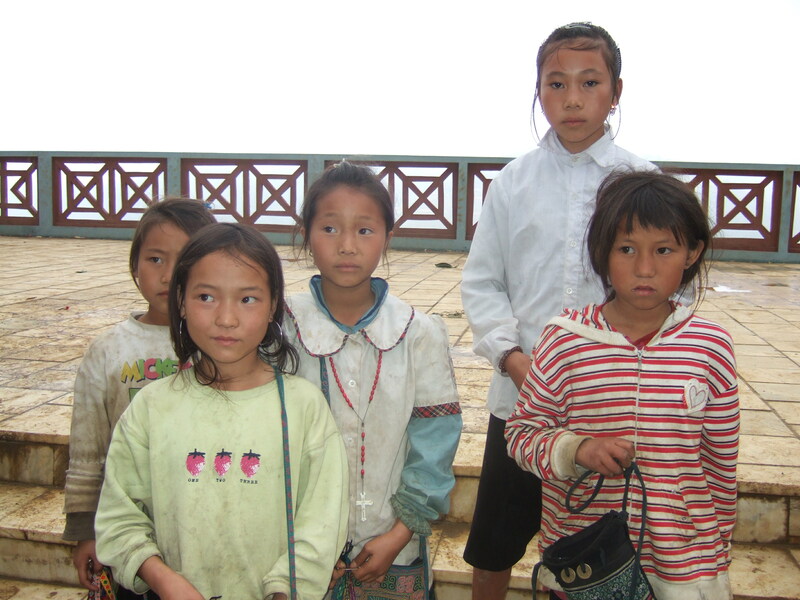 Younger members of Hmong community (Ta Van). After some time, our bladders began enduring the effects of our savory breakfast milk coffees, and flavorful natural juices. Bishara did his best to impart to the young women the notion of needing a restroom, and when his hand signals floundered, resorted to a more direct, and comical, intimation, which was effective. 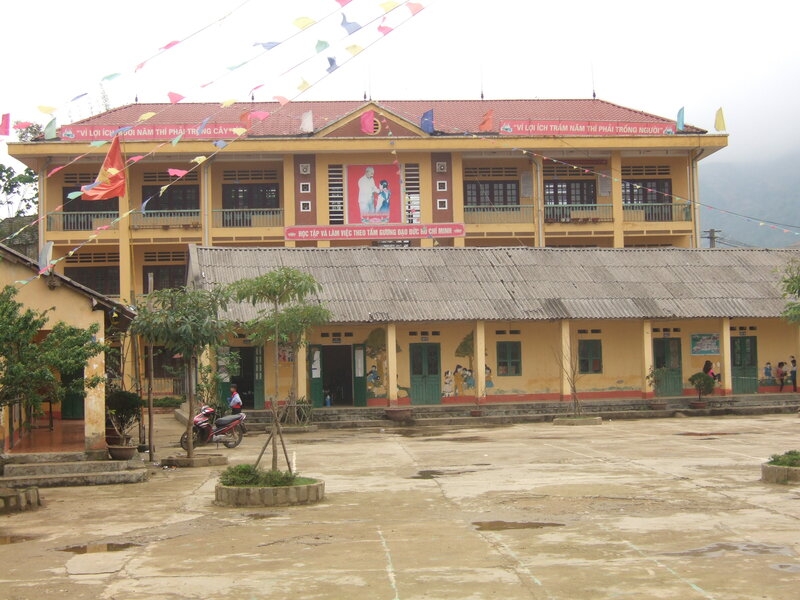 The villagers led us, expeditiously, back to the town center, and guided us to the school grounds where young children bandied a ball about under a prominent banner with Ho Chi Minh’s image. 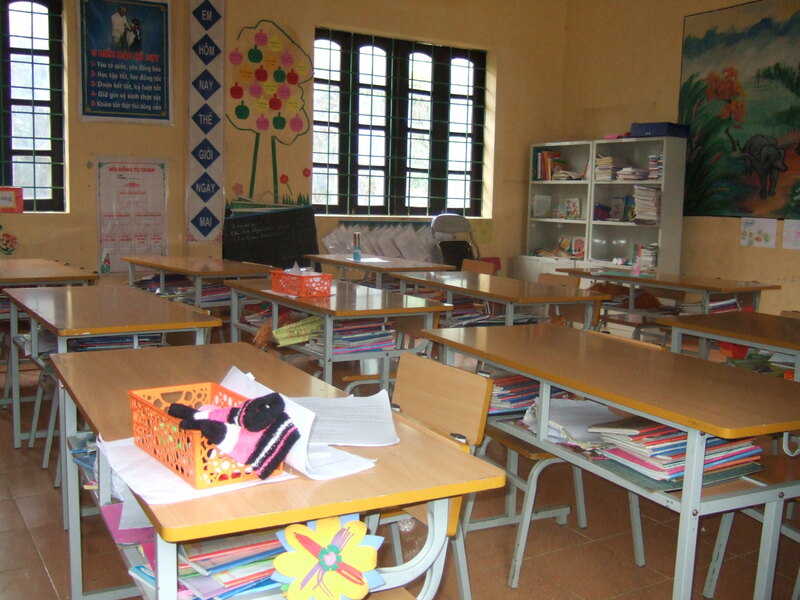 A toilet was discovered, yet despite our two young friends’ best efforts to cajole a school administrator into unlocking the bathroom door, the bureaucrat was unyielding. 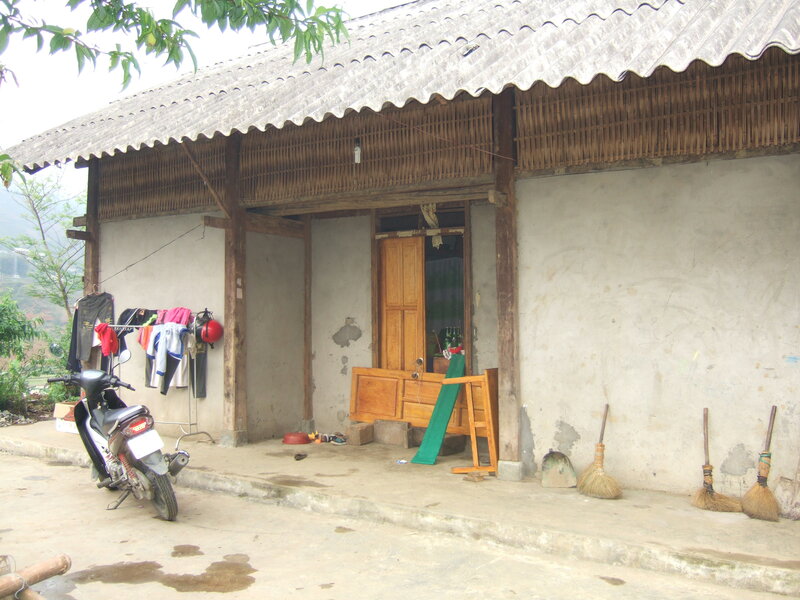 As we departed the school premises, in possible atonement for the perceived restroom lapse, or perhaps simply out of an abundance of hospitality, the older of the two villagers implied that she would like Bishara and me to accompany her home and stay the night with her family. 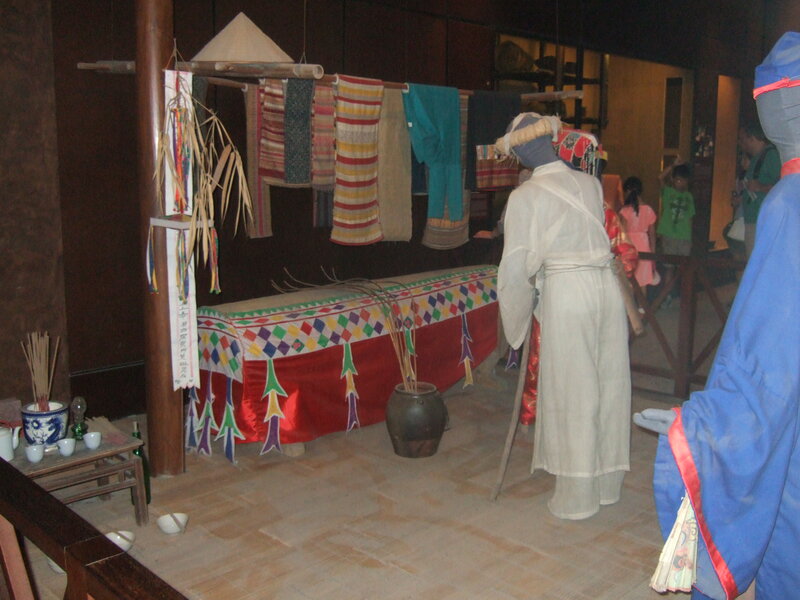 Based on hand pantomimes, as well as a blend of indigenous language and trickles of English, we discerned that this young woman’s dwelling was in the loftiest reaches of the surrounding hills. Considering that our driver was already waiting for us, as we had unintentionally extended our sojourn in Ta Van beyond our scheduled time, and my underlying apprehension over embarking on an overnight stay with people we did not really know out in the middle of nowhere, we declined the considerate invitation. 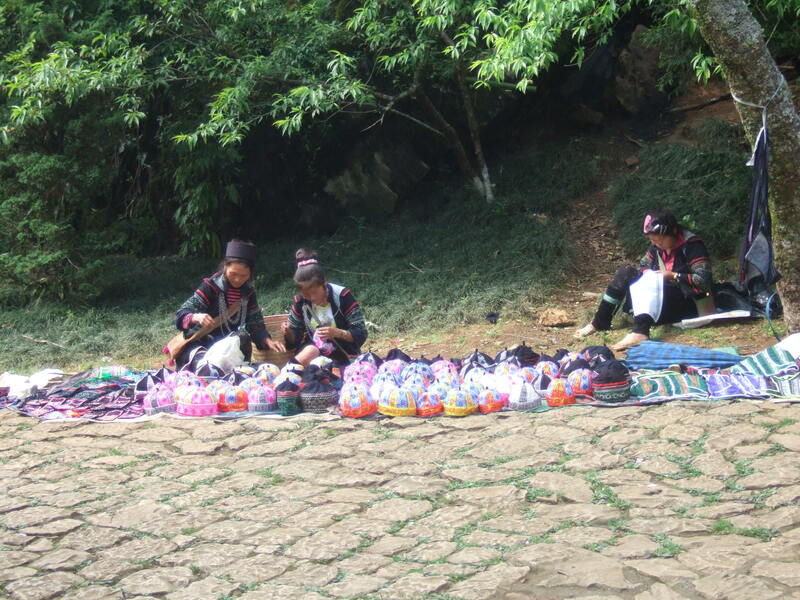 Of course, the imperative solicitation of souvenirs, including beautifully hand embroidered cloth wallets, coin purses, and mini-shoulder bags with braided shoulder loops eventuated as we approached the bridge to exit the village. 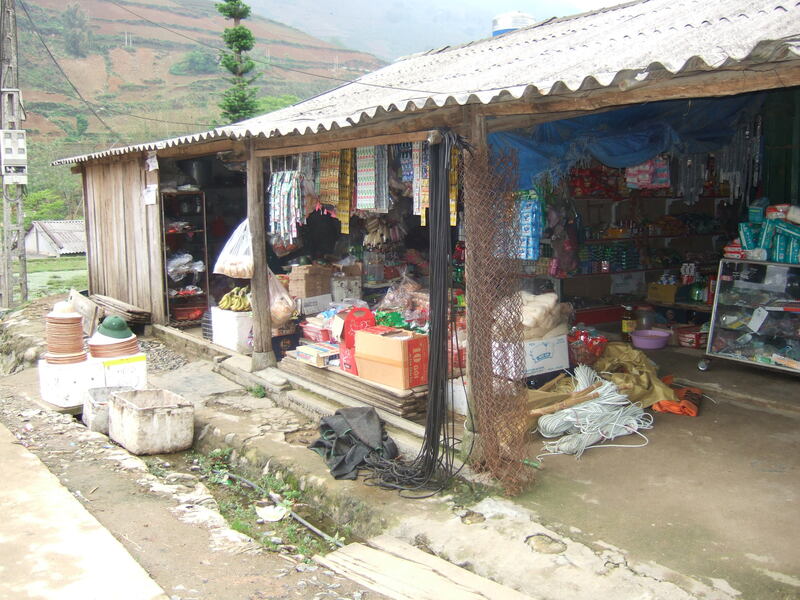 Although normally reluctant to purchase street souvenirs, I was gratified to see expectant eyes turn thankful as I bought a multicolored wallet and coin purse from these kindhearted villagers. On the other side of the bridge, our driver’s arms flailed back and forth attempting to gain our attention. 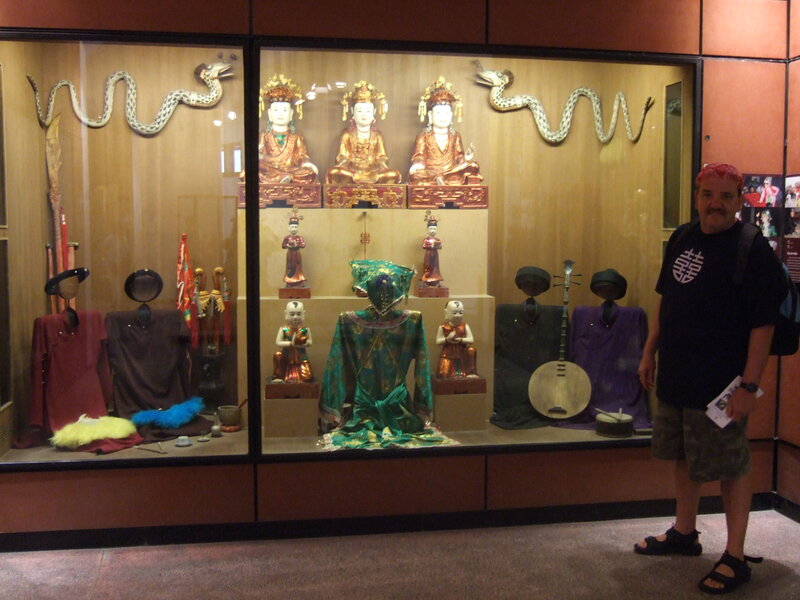 Dispensing appreciative hugs to the women, and asserting our wish to return someday, we scampered to our van. Our driver, obviously irked, uttered something incoherent and pointed to his watch as he drove off. 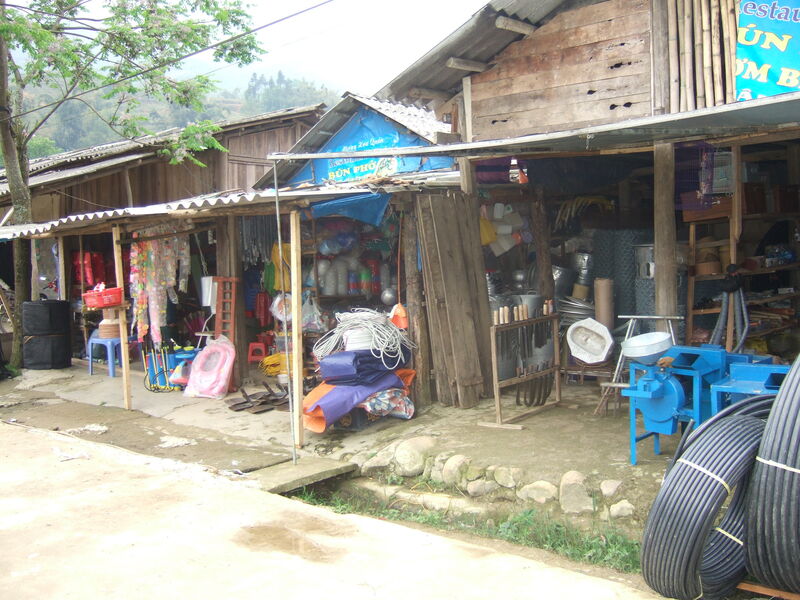 The informal tour schedule outlined by the hotel receptionist earlier in the day had assured a viewing of a second village, Lao Chai, which is where we assumed we were headed. Fifteen minutes into our ride, however, our driver abruptly stopped on the left side of the road without explanation. 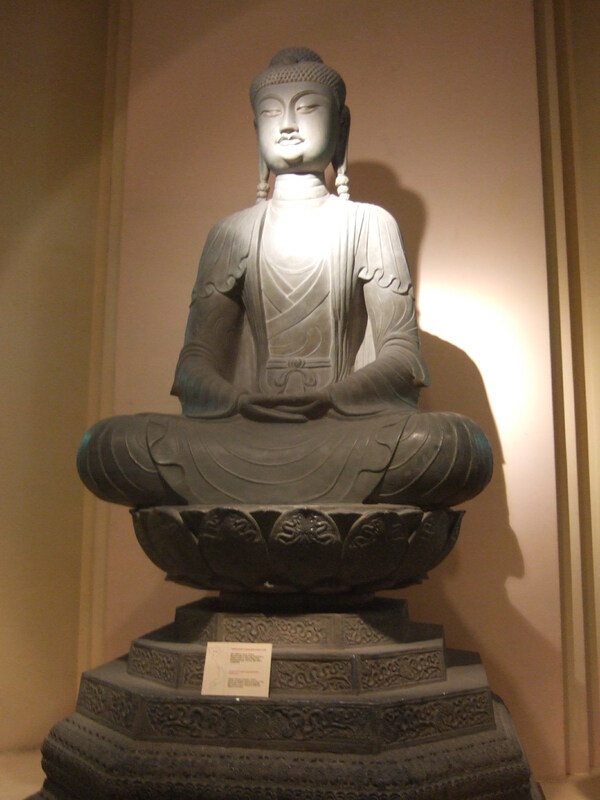 When we inquired why we were stopping, the driver erupted in a burst of staccato Vietnamese. 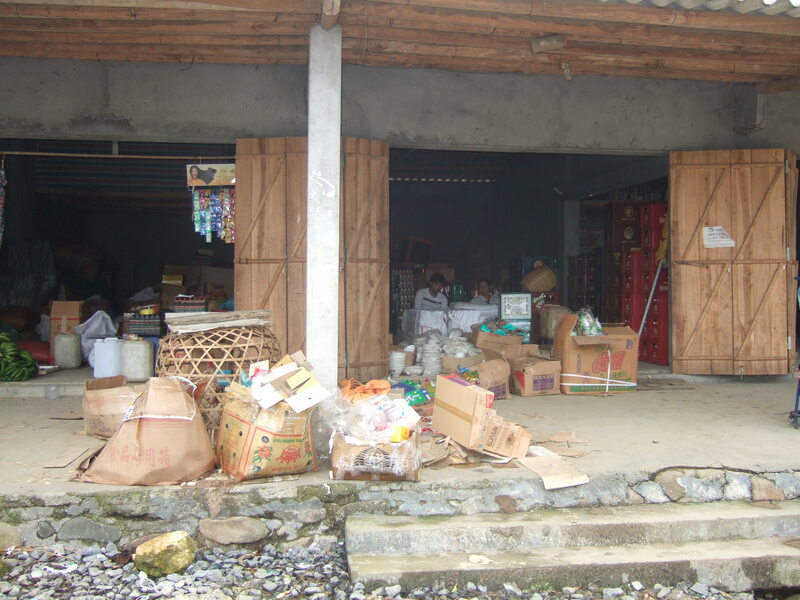 His level of irritation grew with our lack of understanding, until a young Vietnamese couple walked by our van and our driver opened the van’s sliding door. More incomprehensible Vietnamese between the three until the young man outside the van peeked his head around the door jamb, and in faltering, though well enunciated, English sheepishly disclosed to us that the town in the valley below was Lao Chai, but it would take at least an hour and a half to walk down an arduous pathway and possibly up to two hours, or more, to hike back up the steep incline. 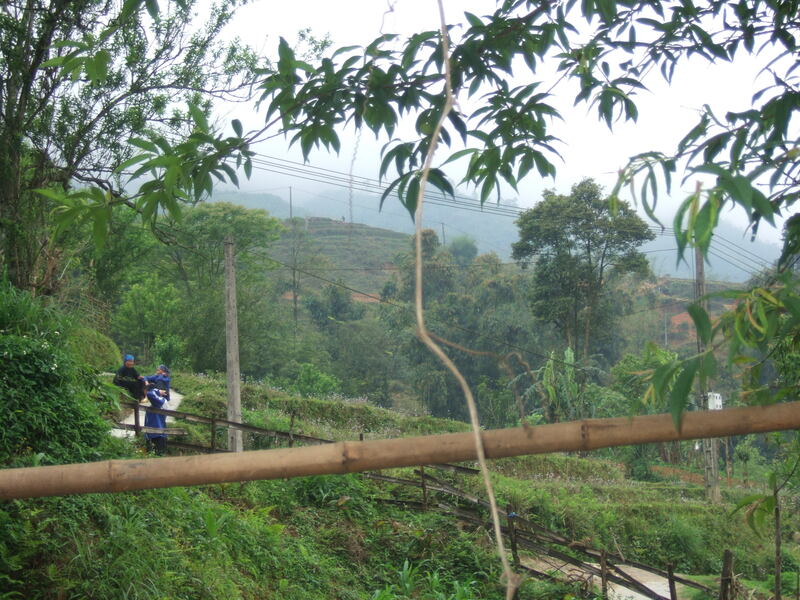 The driver had stopped so we could survey the village from the road, but needed to return to Sapa for another client, continued the young man. Smiling, when we shook our heads in recognition, the young man spoke to our driver, whose stern countenance softened ever so much. The driver, clearly relieved, sped off for Sapa. 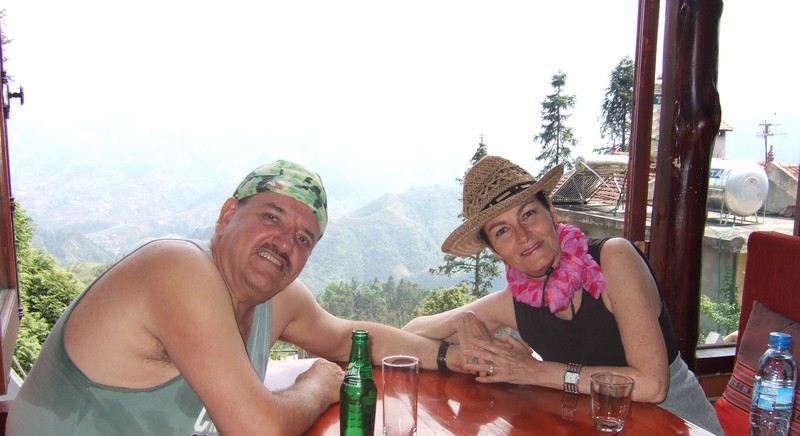 Our day closed with an exotic meal at Sapa’s Hill Station restaurant, including smoked buffalo, banana flower salad, carrot cake for dessert, and an exquisite view of the mountain landscape. 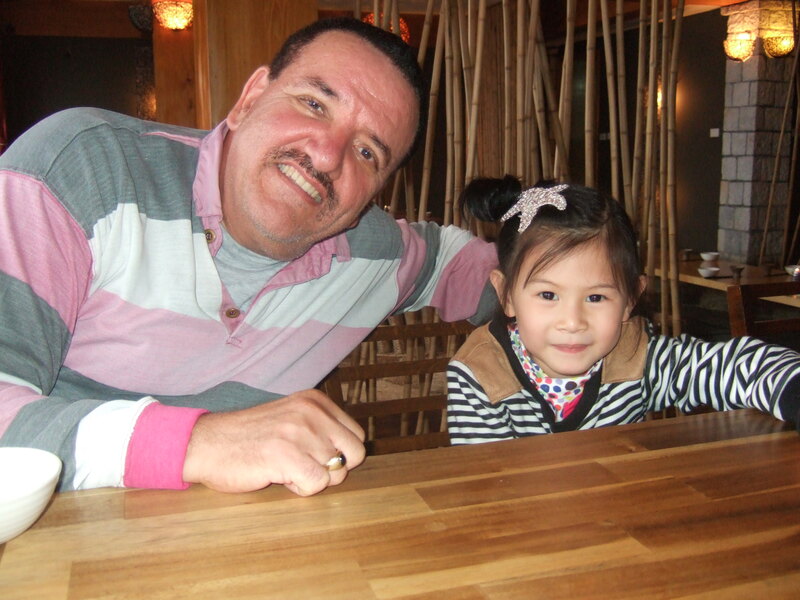 Bishara made a friend at the Hill Station restaurant. 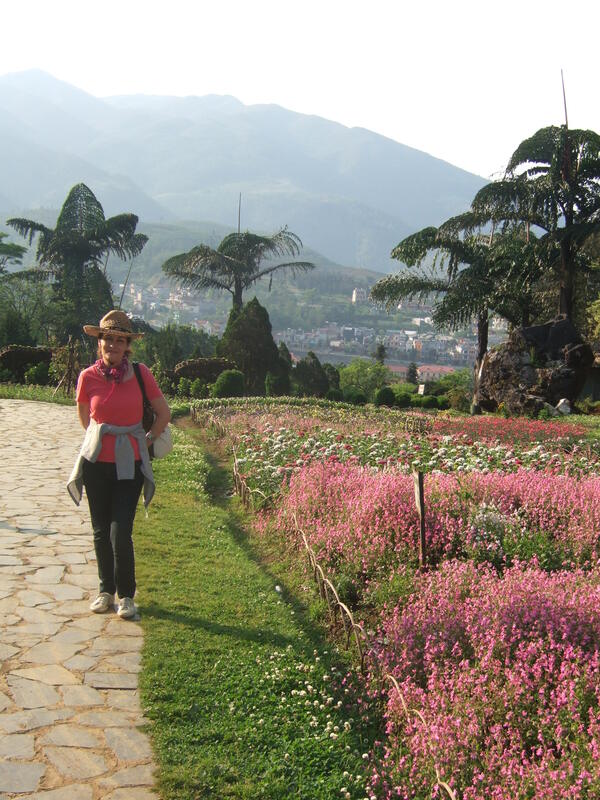 We would leave for Hanoi the following day on the overnight train from Lao Cai, and delighted in the prospect of revisiting the bustling and beguiling capital. 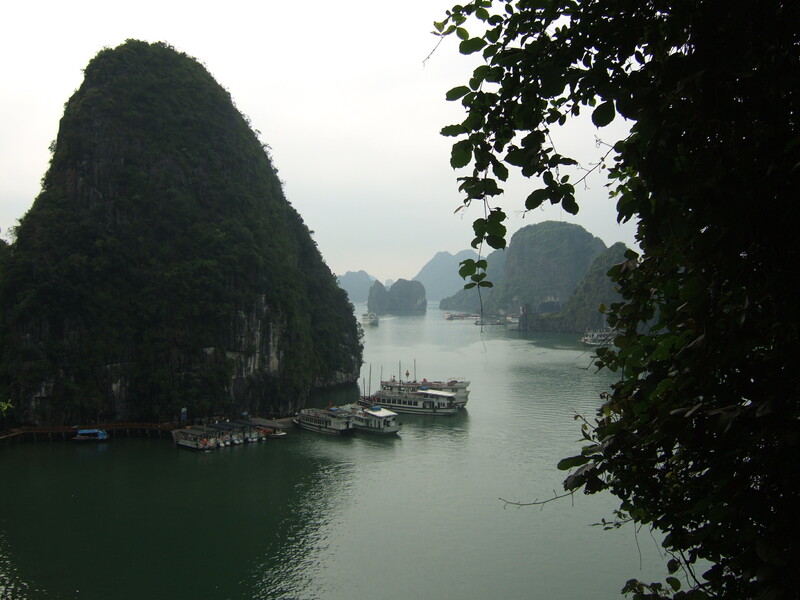 We had been in Vietnam for four days, and had already spent a rousing evening in Hanoi, and three days on an activity-charged cruise on captivating Halong Bay. 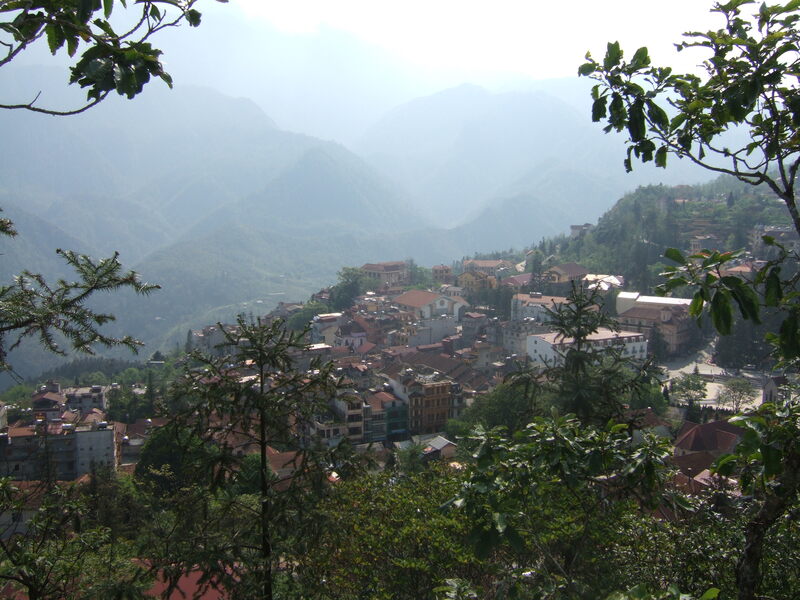 Our next venture was an overnight train ride from Hanoi to Sapa, a mountain town in northwestern Vietnam, home to a variety of (exotic and colorfully dressed) ethnic groups originating largely from southern China, Thailand, and Laos. 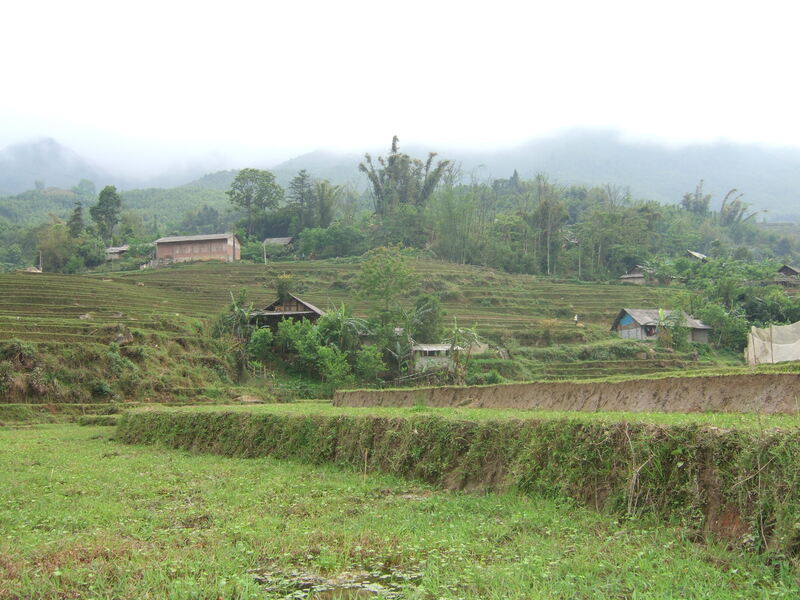 My hope had been to schedule a daytime train to Sapa, however, the train timetables revealed nighttime train travel only. 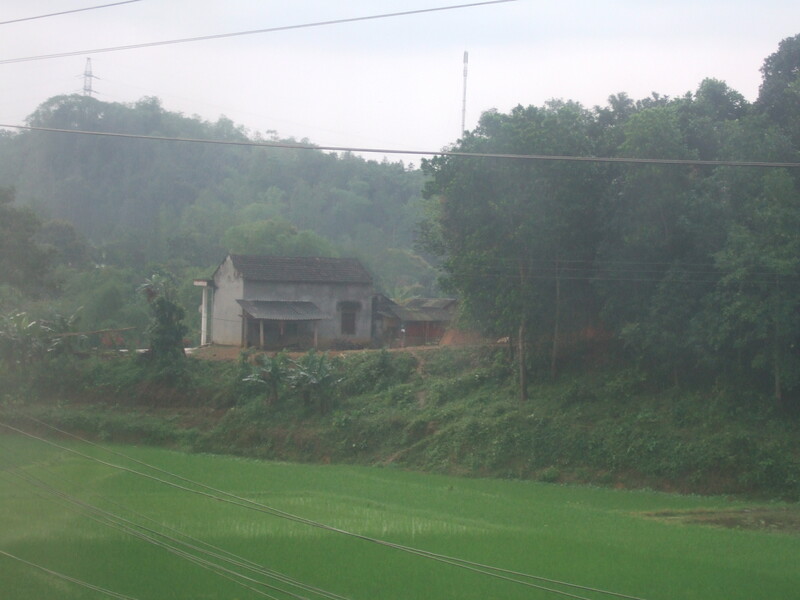 We were a bit wary, as we had not heard any firsthand feedback about this train ride. Would the train be safe, noisy, busting at the seams with people; sleep-worthy? Online research informed us it might be best to book an entire cabin, as otherwise we could be bunking with an entire family in a rather confined space. Communication with staff from the Elegance Ruby Hotel, our “home base” while in Hanoi, indicated that the Sapalay Express train, the train line we ultimately chose, was several tiers above the “Oriental Express” in terms of comfort and service, and only one tier below the highest rated train. 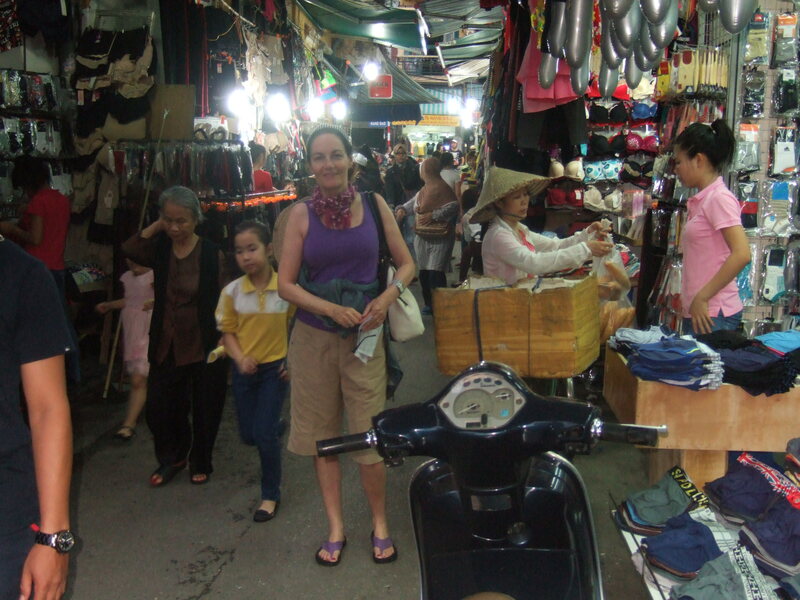 This helped to assuage our concerns, and we booked our train travel to follow a day’s rest in Hanoi after our Halong Bay cruise. 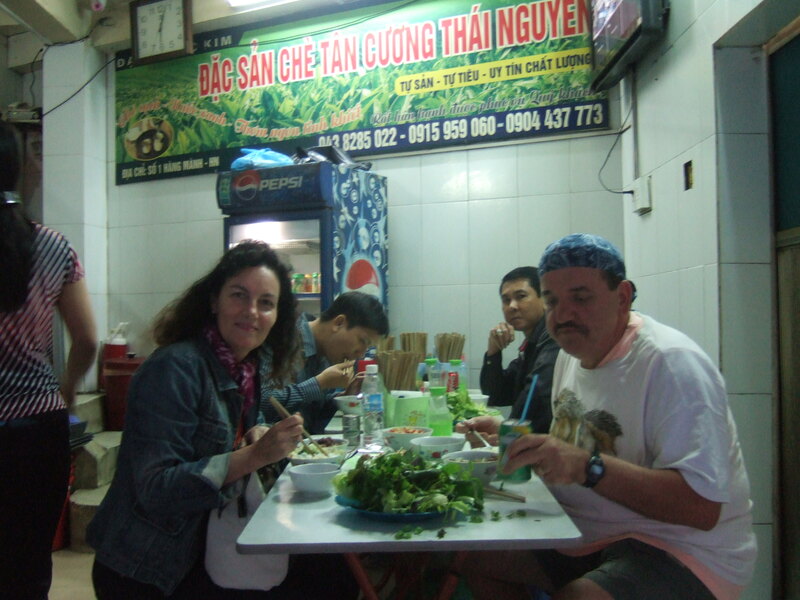 After an evening meal of Bún chả; broth with bean sprouts, green salad leaves, noodles, and pork bits at what was becoming a favorite “hole in the wall” restaurant near our hotel, Bishara and I left for the Hanoi train station at 8:45 PM. A hotel porter was good enough to accompany us to the station. Virtually no one spoke English except for a smattering of western tourists; consequently, it was a relief to have our porter confirm our tickets amidst the throngs of people positioning for a spot in line or scurrying to find their train line and coach number. 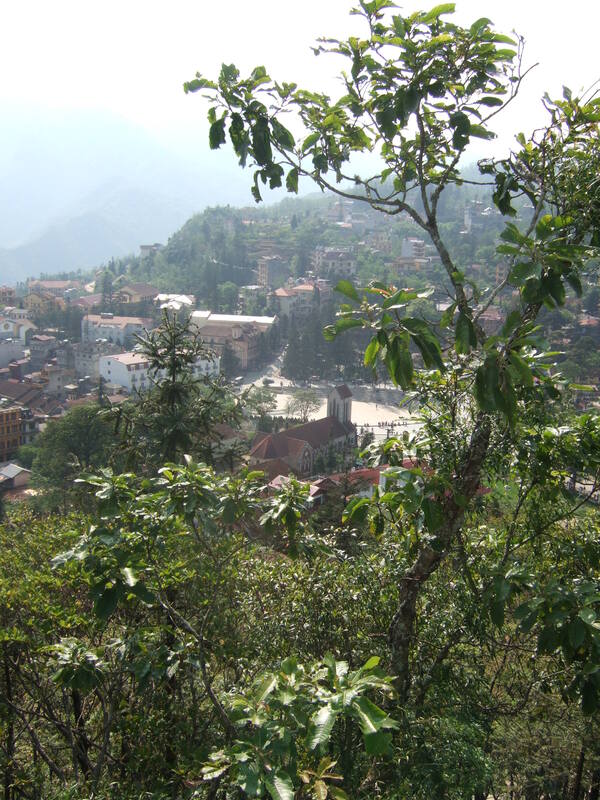 Our porter, baggage in hand, earnestly and expeditiously maneuvered through the hordes, located our coach, motioned for us to climb up, and then coolly hoisted our bags onto the train. 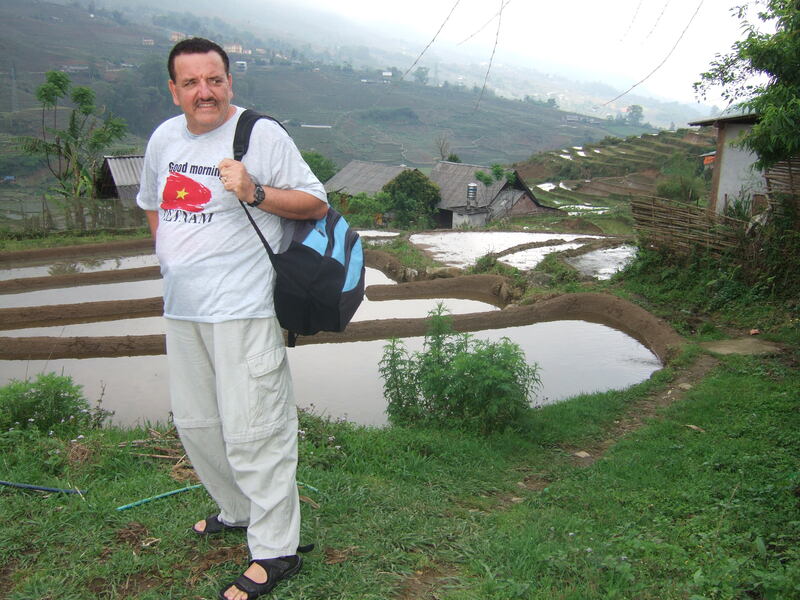 Sensing Bishara’s concern, our porter promised, in purposeful yet limited English, that someone would be at the train station to assist upon our return to Hanoi from Sapa. Securely on the train in our private cabin, I felt able to focus on the excitement of our imminent train trip. Our cabin was small with two sets of bunk-style beds, and although the furniture was somewhat dated and worn, the mattress, pillows and fluffy comforter were all surprisingly comfortable and cozy. 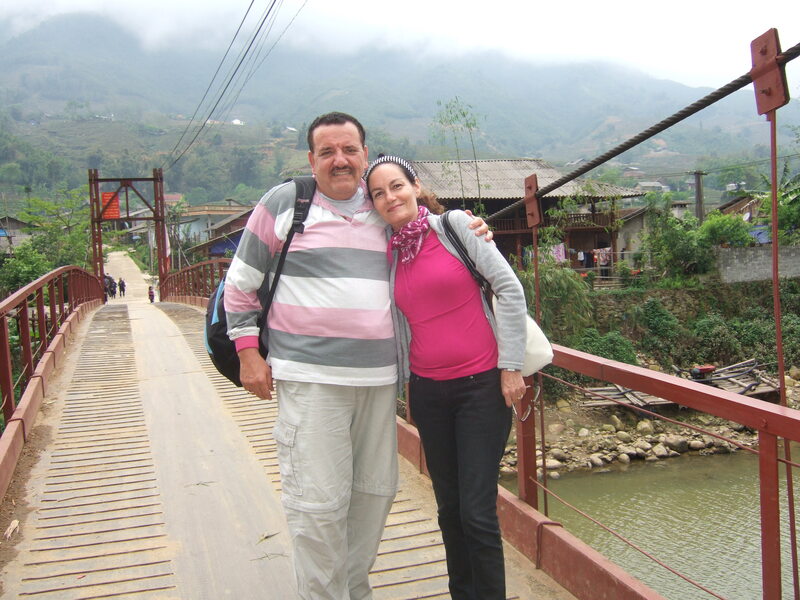 Although Bishara and I had prepared to be up for a while planning our time in Sapa, and possibly reading while ingesting this novel train experience, our active day culminated in us both drifting into desultory sleep following a 9:50 PM departure time. Despite jolting at every grind, stop and start throughout the night, I enjoyed a whimsical awareness during our uncommon ten-hour train excursion. Morning light peeking through the curtained window of our cabin lifted us out of our semi-conscious reverie at around 5:00 in the morning. 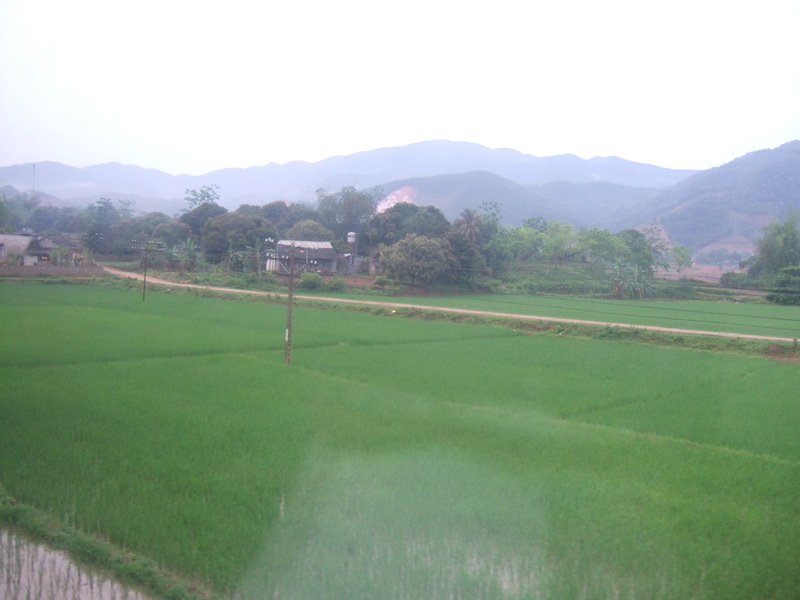 Pulling the curtain aside, I was beguiled by the lush greenery of the expansive rice paddies framed by undulating hills and farm homes. 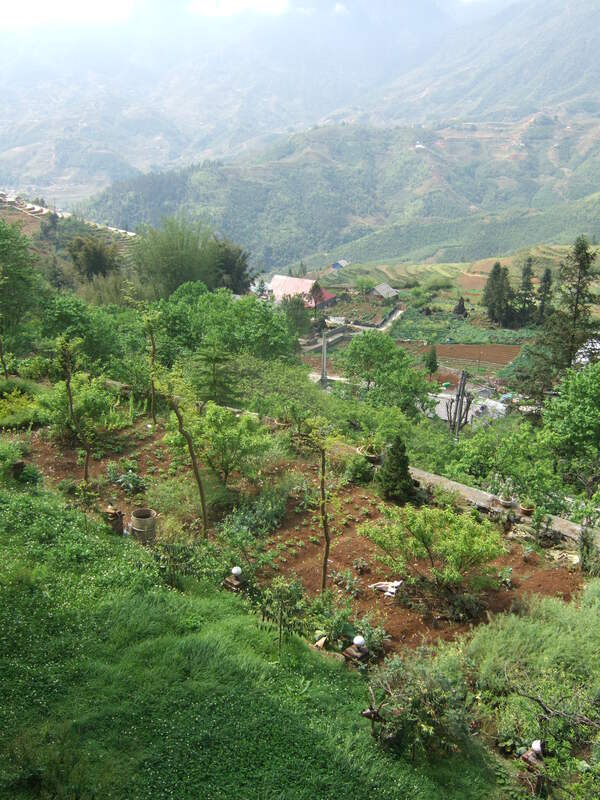 We were nearing Lao Cai, our destination. 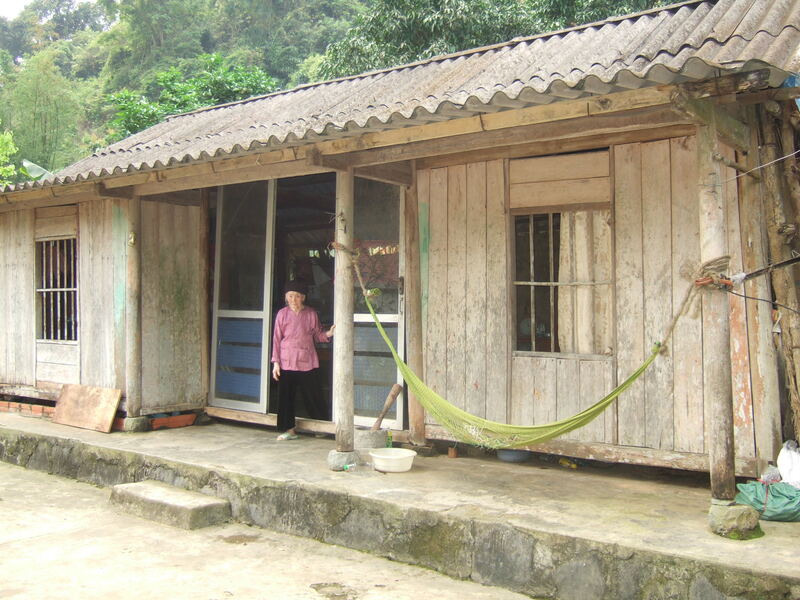 A young man knocked on our cabin door with offers of Vietnamese milk coffee. 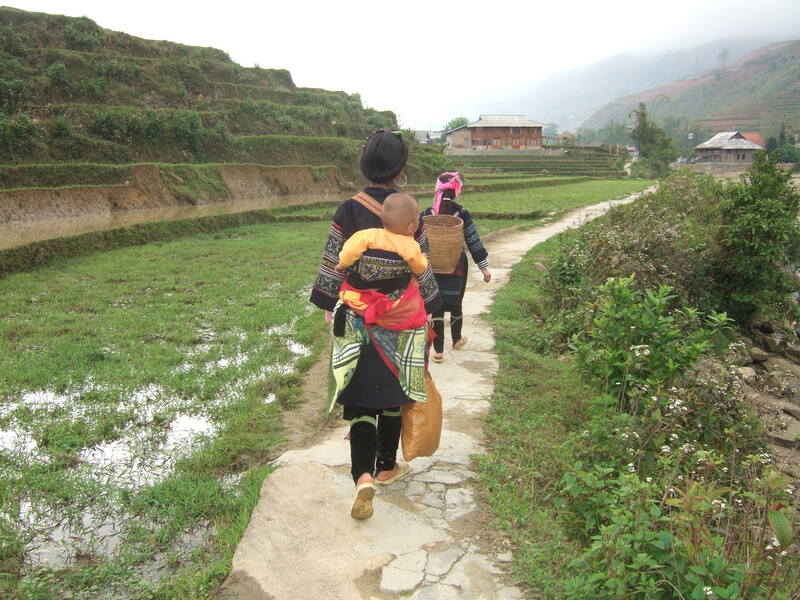 We arrived at Lao Cai train station at 8:30 AM, and shuffled through the narrow train corridor with Bishara lugging the heavier suitcases and me trailing behind. Swarms of people, once again, met us as we stepped off the train; train passengers fusing with those waiting to meet them. Amongst the masses, we spotted a man holding a sign that read “Bishara.” Feeling relieved, we scurried over; the young man gave us a cursory nod, snatched our bags, and led us to his awaiting van. 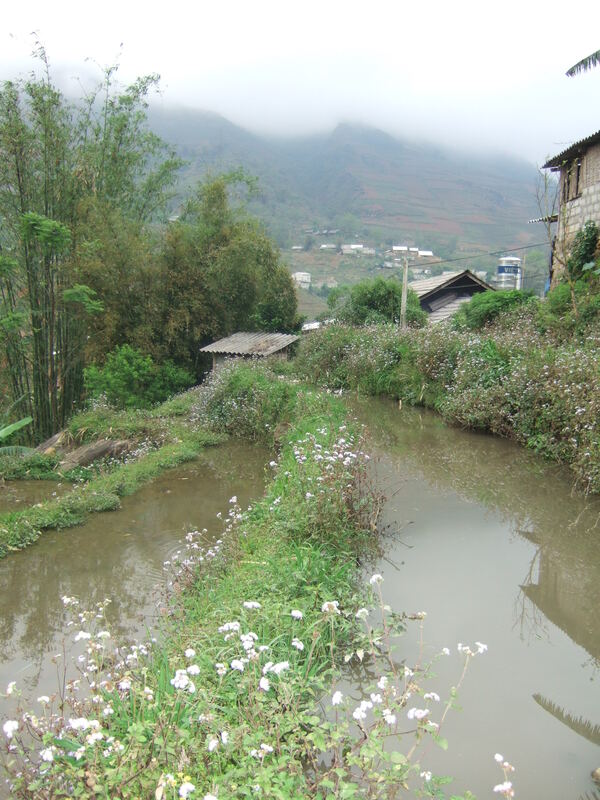 We all piled in, and were soon on our hour-long ride from Lao Cai to Sapa. 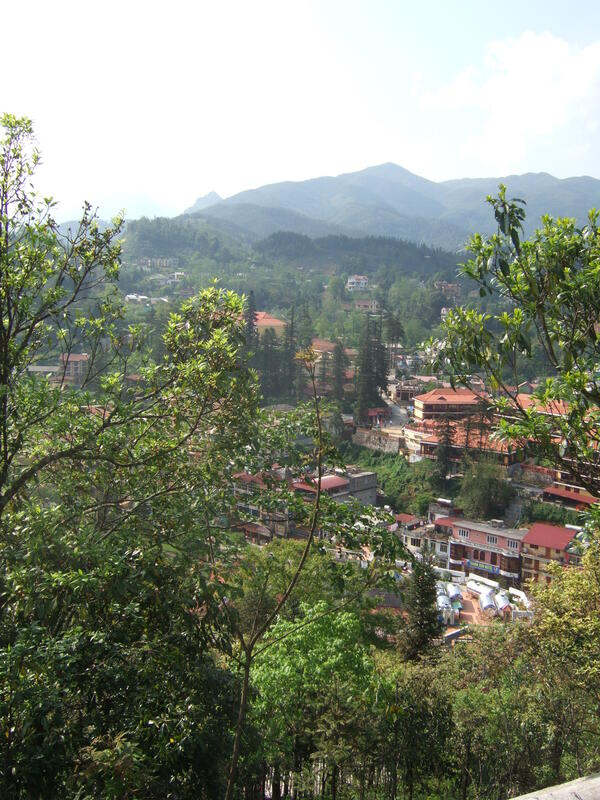 As we departed the train station, the cityscape of traditional long, narrow and deep buildings slowly transformed to luxuriant vegetation hugging the surrounding bluffs. 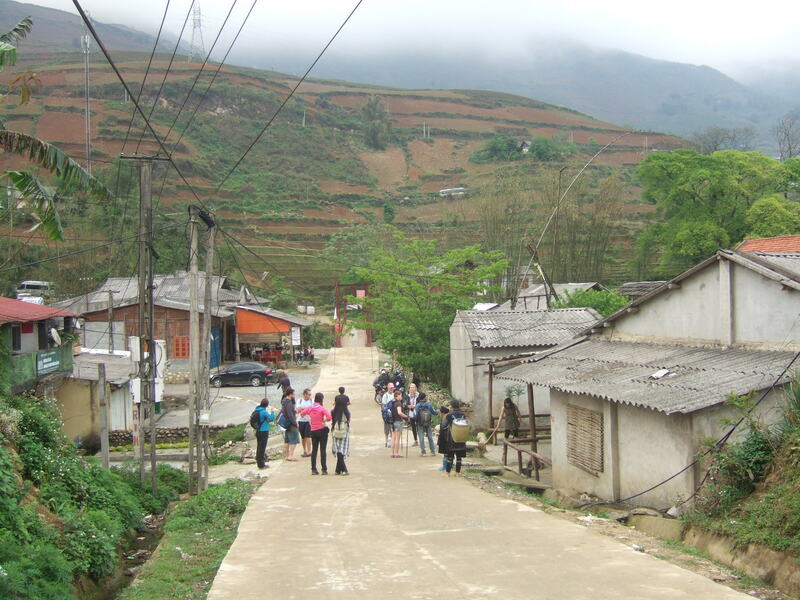 With each hairpin curve the mountain views expanded and village life became discernible. 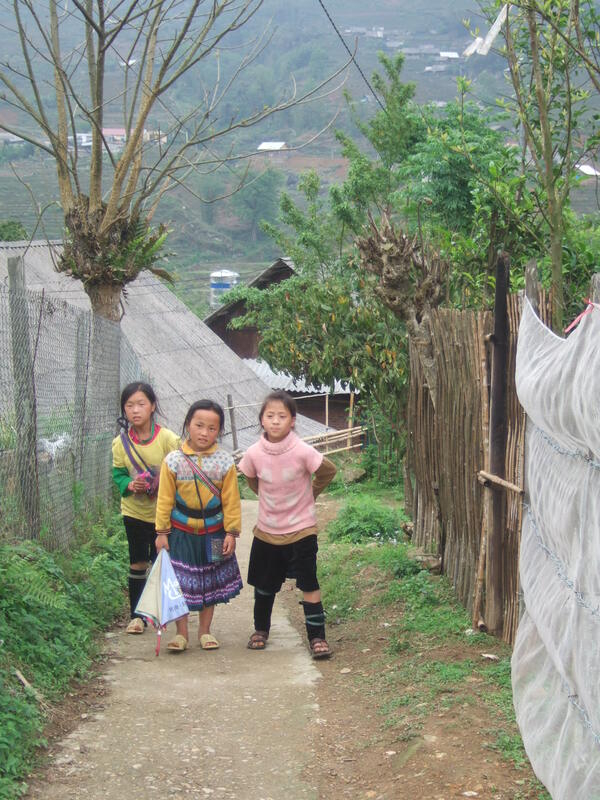 Lone ethnic Hmong women dressed in black with colorful trimmings and cloth shin guards emerged on the side of the road hauling plastic bags to undetermined destinations. 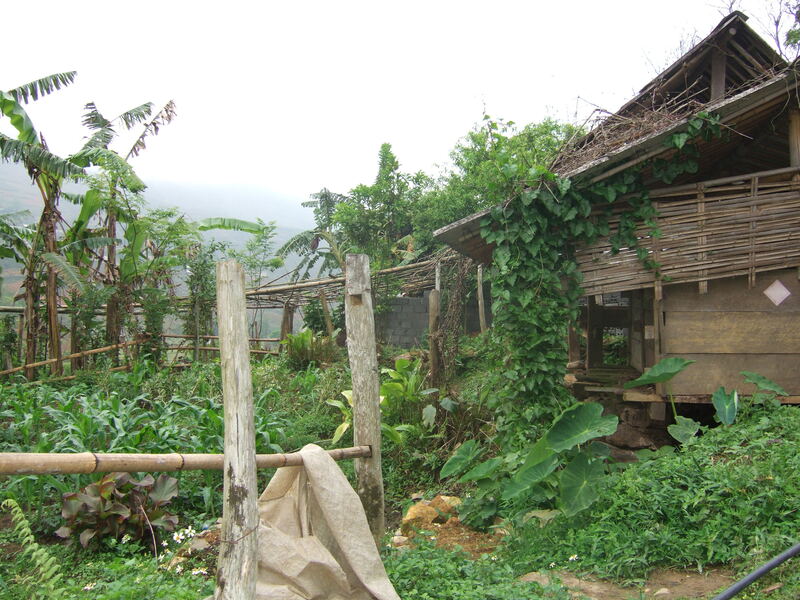 Further on, glimpses of battered wooden structures with tin corrugated roofs, homes of the Hmong, appeared on mountainsides and along towering ridges. Although weary and punchy after a sleepless night, we decided to push on and probe this intriguing town. We began with a breakfast of special order omelets with tomatoes and onion and milk coffee at a charming restaurant across the street from our hotel. Although our preference is to indulge in local fare, we felt compelled to order our “go to” heavy duty omelets to help sustain us through the day. 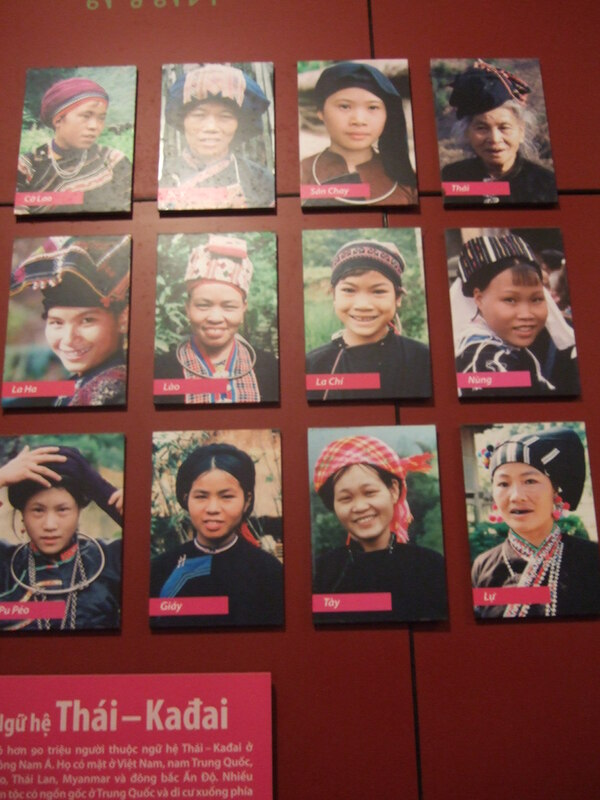 Hmong women spotted during breakfast. 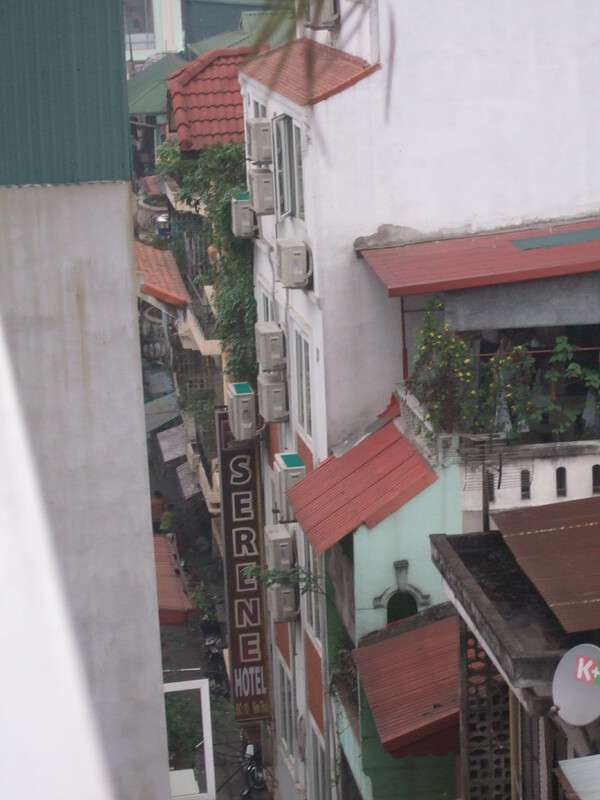 Breakfast was followed by a stroll through town; breezing by boutique hotels with multi-tiered balconies adorned with flower pots, cozy cafes, massage parlors, food marts, and the ever-present towering, slender residences. 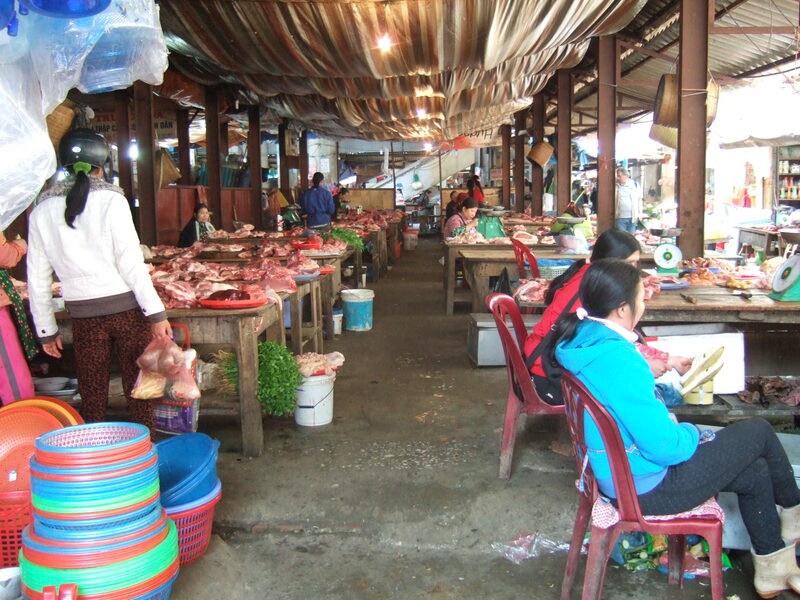 We finally bumped into the Sapa Market with vendors selling raw meat, fruits and vegetables, a variety of savory nuts and herbs, kaleidoscopic textiles/clothing, while aromatic grilled Vietnamese street food filled the air; a virtual assault on the senses. 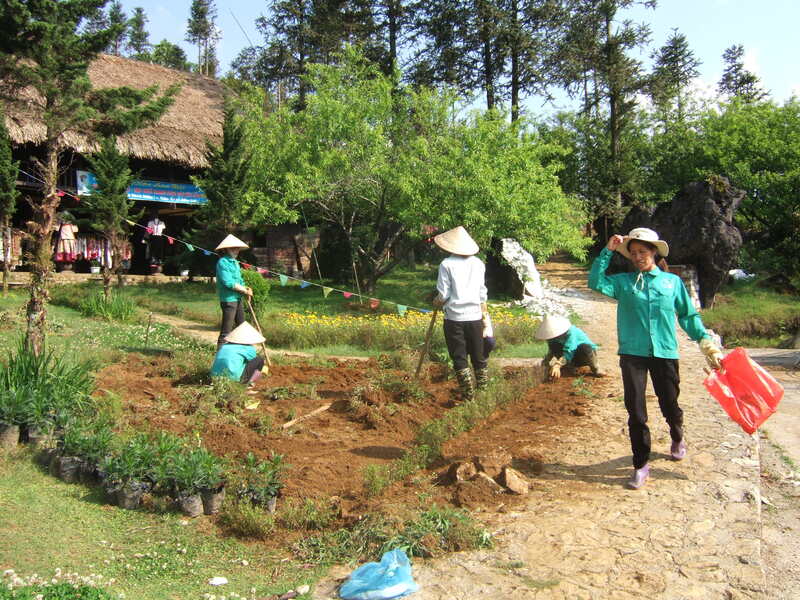 Staff at the Bamboo Sapa Hotel had provided us with a map of the town and neighboring area when we first arrived, and recommended we visit the Ham Rong (Dragon’s Jaw) Mountain Park, a 15 minute walk from the hotel. 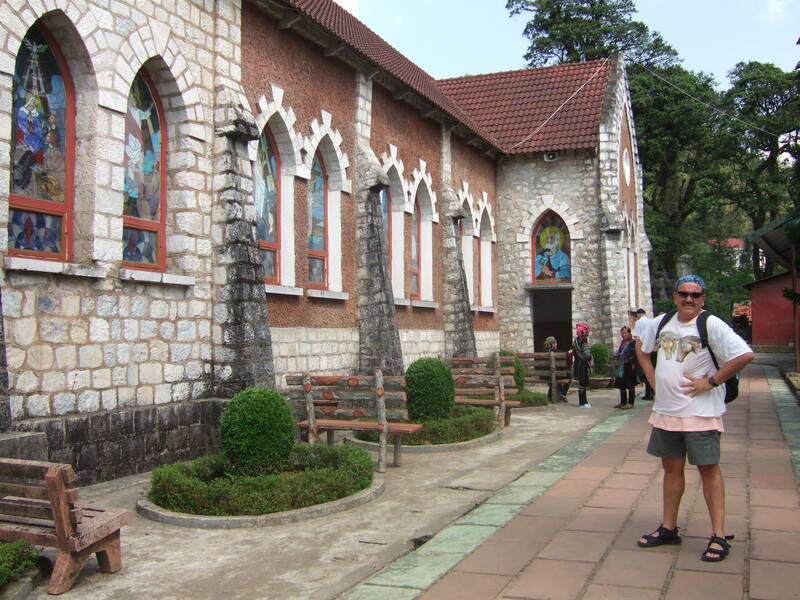 After leaving the Sapa Market and stopping for a brief tour of the stone (or Holy Rosary) church near the mountain park, we began a considerable climb up Dragon’s Jaw; hundreds of stone steps and a cobblestone pathway. 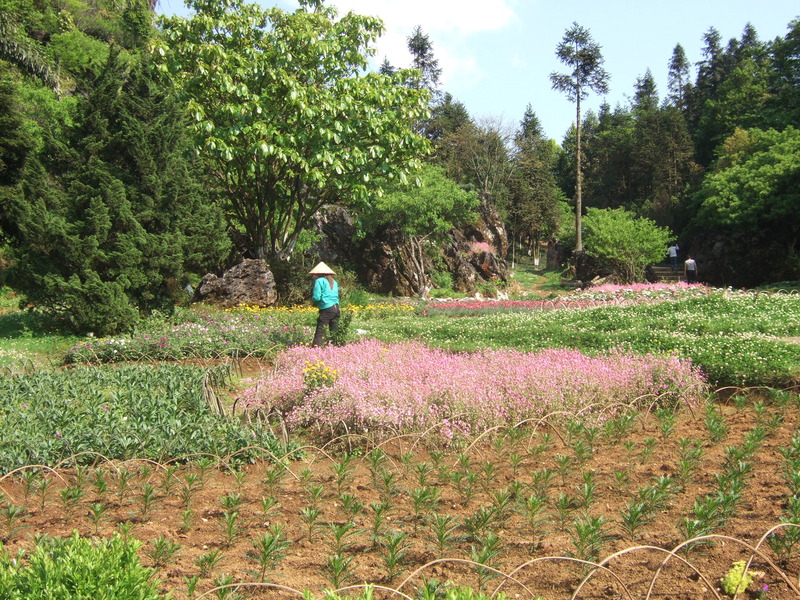 The expedition included the Fanispan View, a broad display of Sapa huddled within the mountain peaks, dazzling flower gardens, and the summit with more glorious views. Start of climb up Dragon’s Jaw. 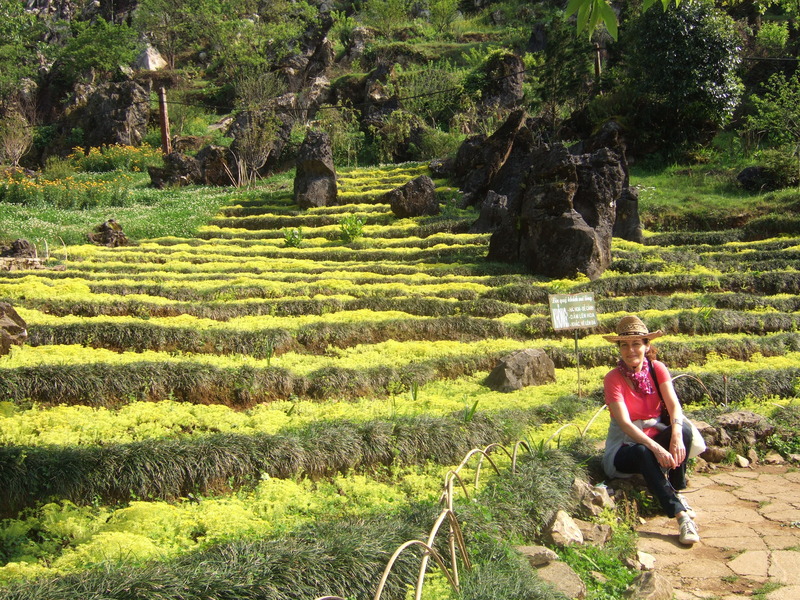 One of many flower gardens on trek up Dragon’s Jaw. Near the summit of Dragon’s Jaw. 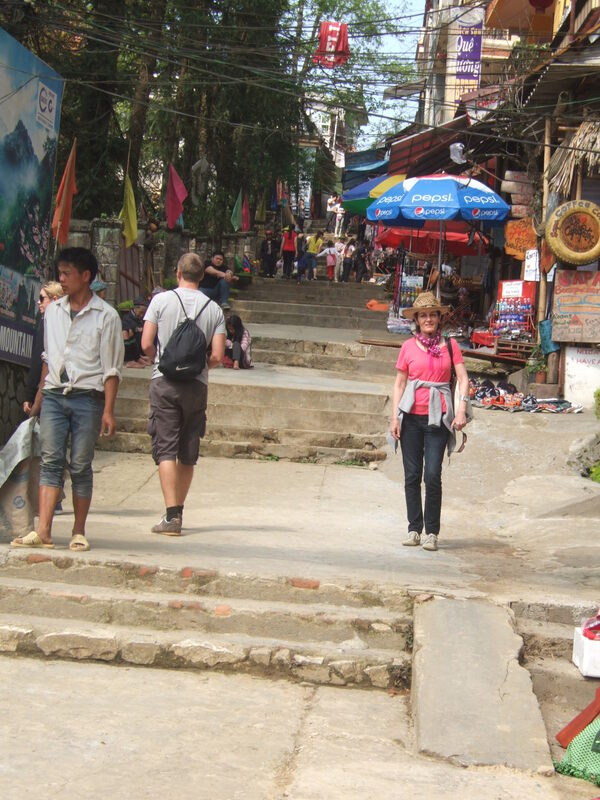 The walk down the mountain was only slightly less painful than the trek up. To soothe our aching muscles, we opted for classic Vietnamese foot, arm, upper back massages at one of the many massage parlors in town. 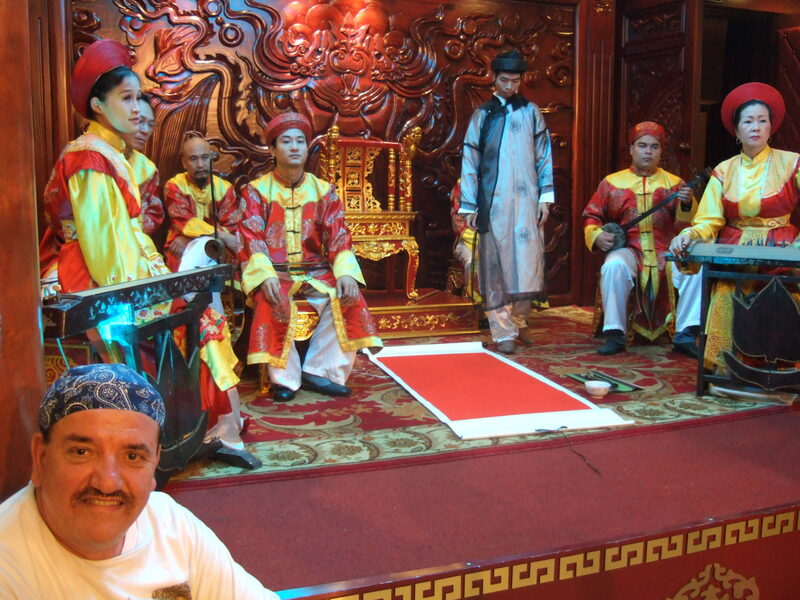 The massages left us placid and languid, and at only $8 per hour, were an incredible value. 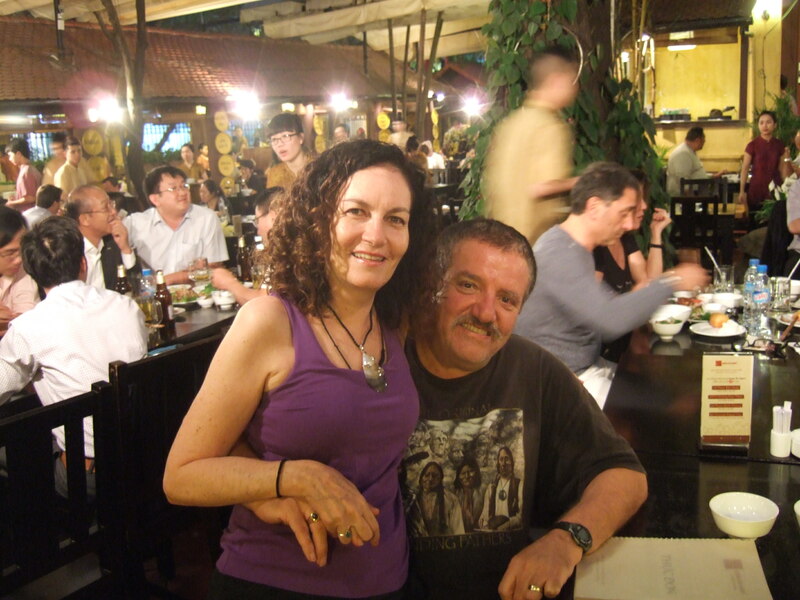 Glancing at our watches, we realized it was suppertime and not wishing to diminish our serene states of mind, we chose to dine at Viet Bamboo, a restaurant close by on the side of a hill, even though it meant climbing more steps. Our sore knees and tired bodies were rewarded with cordial service and some delectable starters, including pumpkin soup in coconut milk and potato soup with Vietnamese herbs, followed by chicken curry and fried rice with shrimp and pineapple. 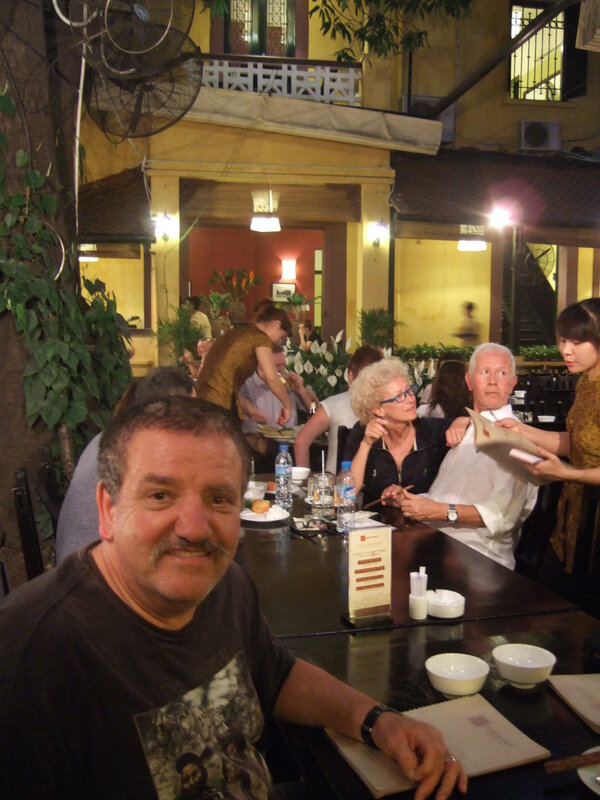 We topped off our meals with Hanoi beer, ginger tea, and exquisite fried banana cake with honey. Making our way back to our room, we stopped in a café across the street from our hotel where “Play that Funky Music, White Boy,” one of my disco favorites, was blaring. 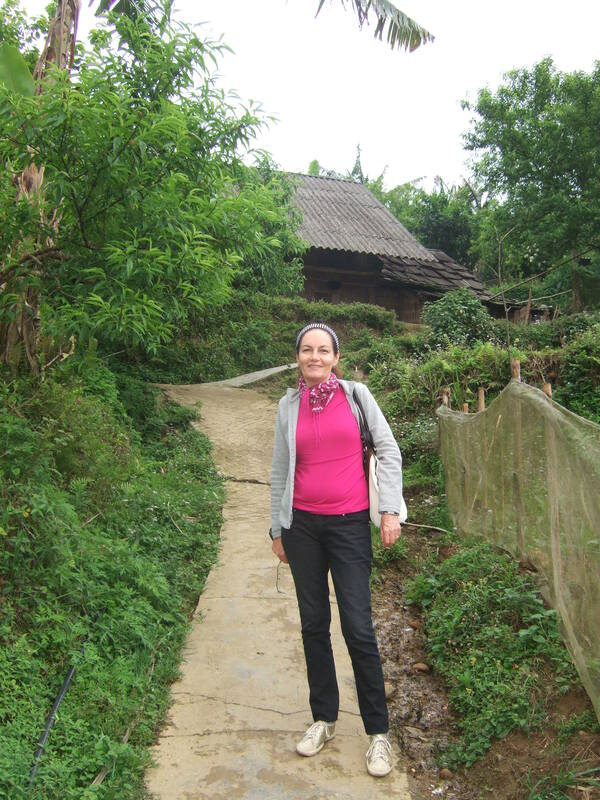 Although tempted to dance the night away, we thought it best to get a good night’s sleep, as we wanted to fully enjoy our visit to a tiny nearby Vietnamese village the next day. . . . We couldn’t wait! 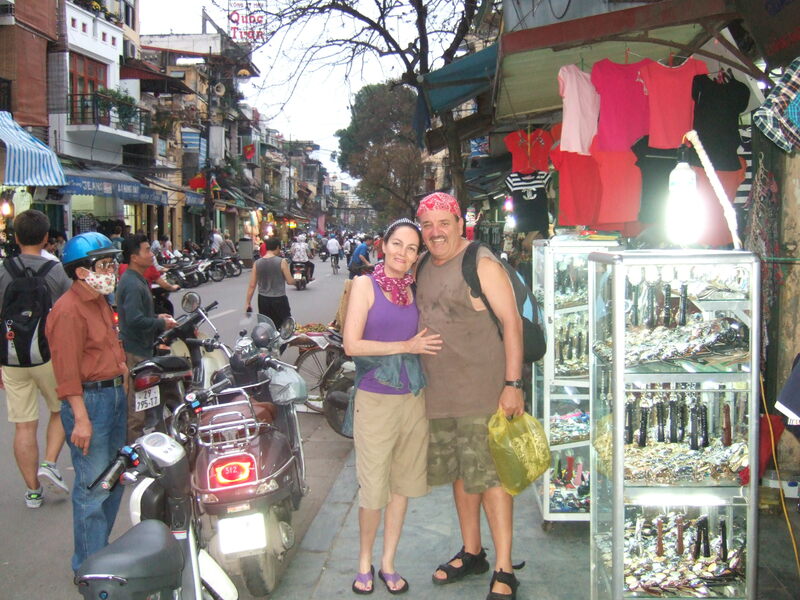 We had spent a delightful late afternoon and evening in Hanoi’s Old Quarter, and were eagerly anticipating our three day/two night cruise on Halong Bay, a UNESCO World Heritage Site. 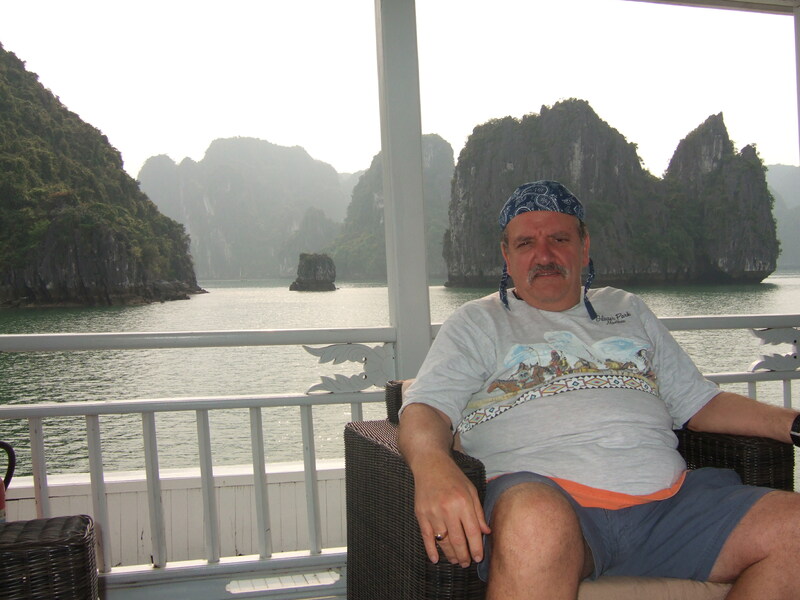 Our Canadian expatriate friends related that their cruise on the bay had been the highlight of their time in Vietnam, and remarks and photos on tourist internet sites seemed to reinforce this notion. 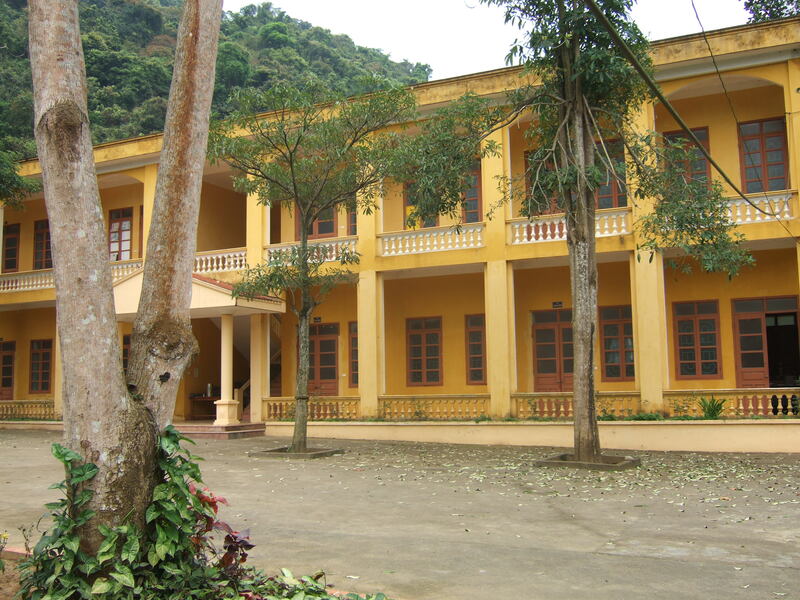 I decided, ultimately, to have the very capable staff of the Hanoi Elegance Ruby Hotel, our “home base” while in Vietnam, assist us in making arrangements for our Halong Bay cruise, as well as our overnight train travel to the mountain town of Sapa. 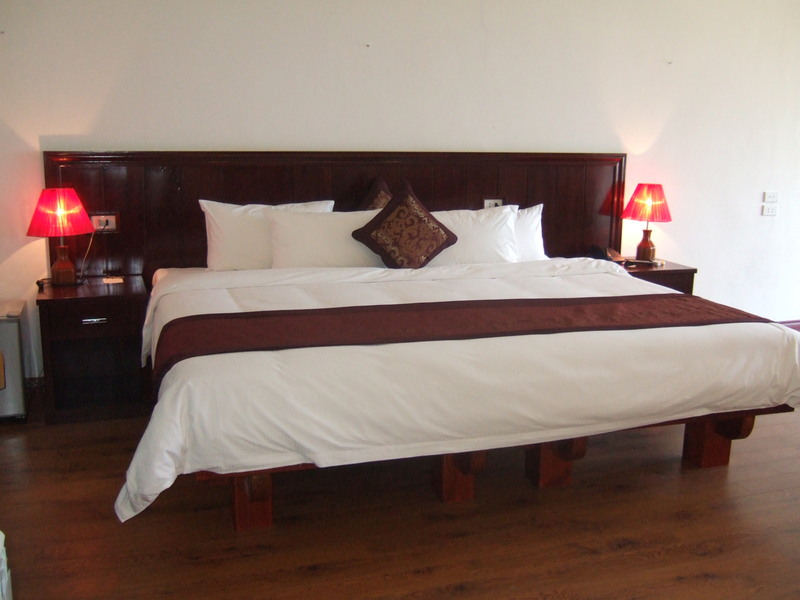 This arrangement helped to provide a higher level of transparency to our planning, as the hotel tied in the ancillaries like hiring a private car to take us to, and from, our boarding locations, and such. We had been in Hanoi a mere 14 hours; time enough, though, for an evening out in the bustling yet charming city, an exquisite meal featuring bánh xèo (Vietnamese fried pancakes), and a delectable breakfast of western omelets, carrot juice and traditional noodle soup following an early morning wake-up call (5:15 AM). A porter and two receptionists scrambled to ensure our luggage was transported expeditiously from the alleyway of our hotel to the waiting car on an adjoining side street, all the while attempting to halt traffic for us as we dodged scooters, pole vendors, and pedestrians. 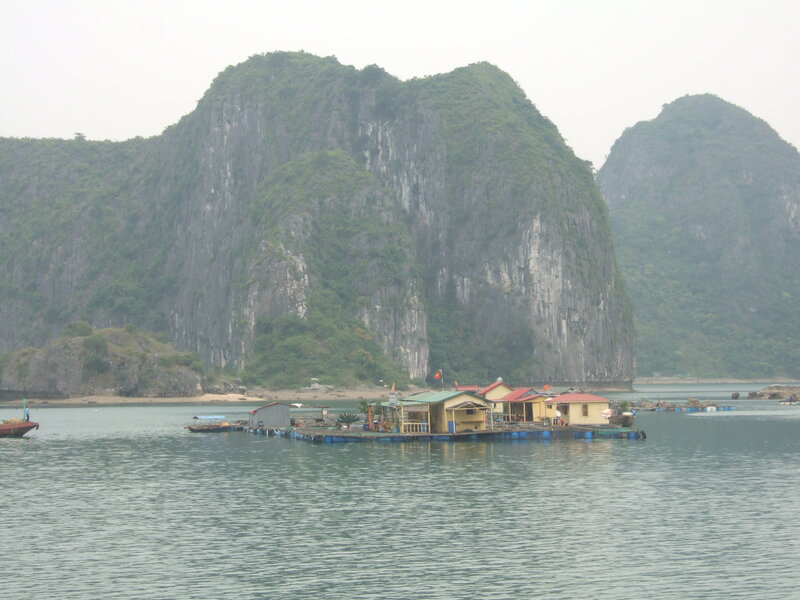 The receptionists attentively opened the passenger doors for us, wished us a wonderful cruise, and off we went on a three and a half hour car ride to the very popular Halong Bay, 146 km (91 miles) due east of Hanoi. 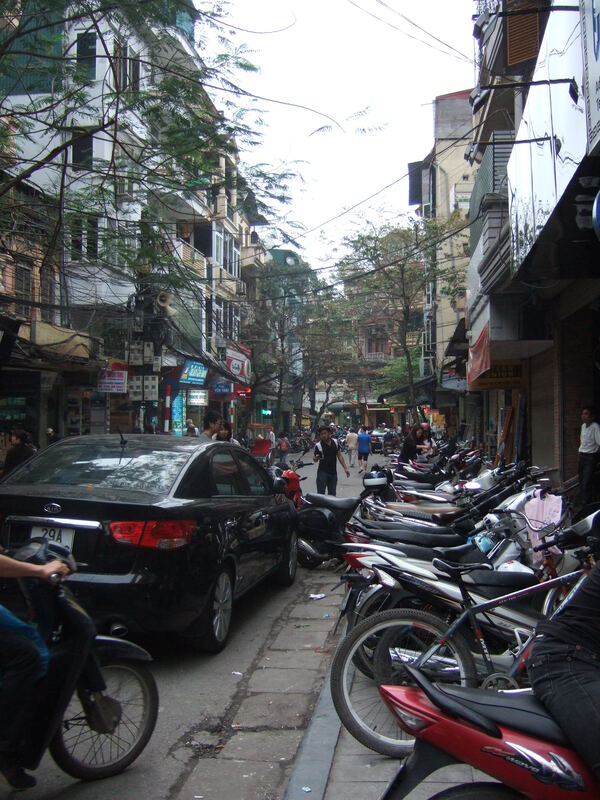 The quaint alleyways of the Old Quarter gradually morphed into the urbanized landscape of Hanoi’s city proper, a short span of highway driving and finally local two-lane roads that linked small towns and villages. 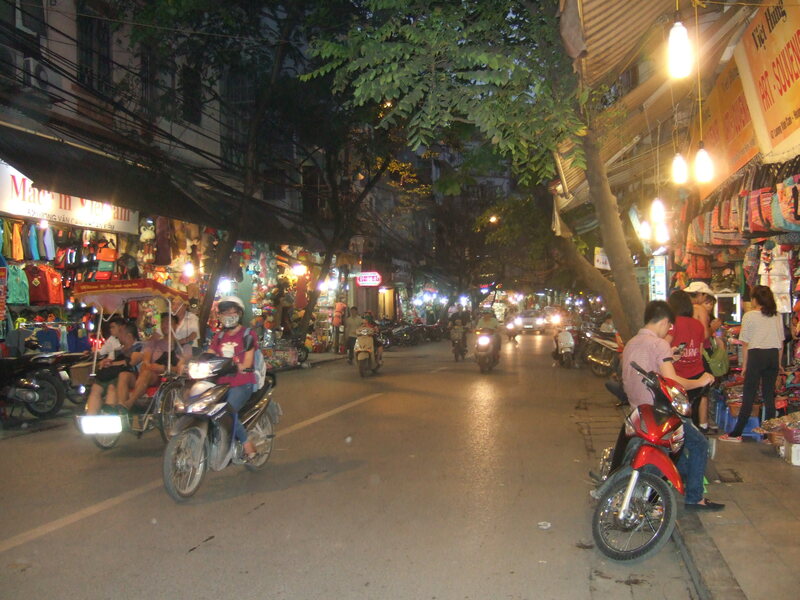 Like the Old Quarter of Hanoi, scooters were ever-present, alongside small trucks and Kia cars, as were the unusually tall slim buildings with multiple balconies and wrought iron railings, often covered with an abundance of colorful flowers. 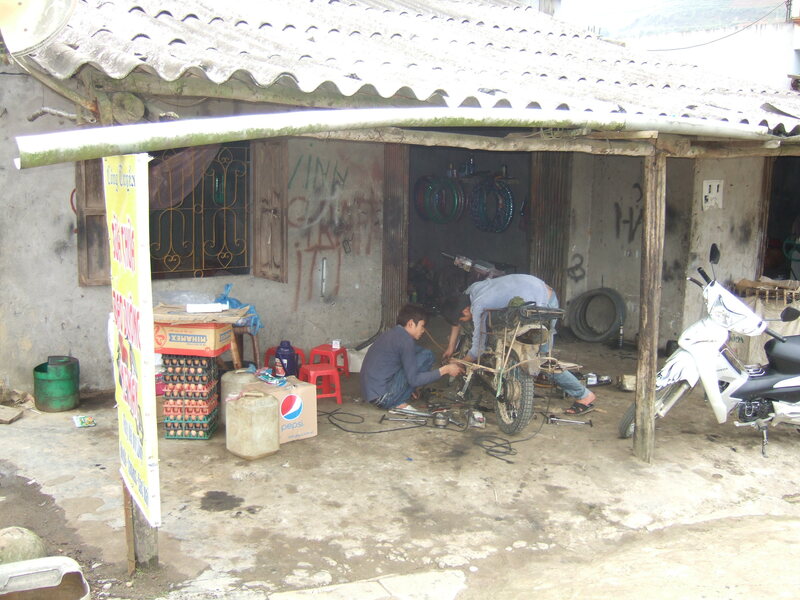 Before reaching Tuan Chau Island on Halong Bay, we stopped for a scheduled bathroom break that integrated a requisite visit to a handicraft shop and a hurried lunch of spring rolls, and pork coupled with noodles. 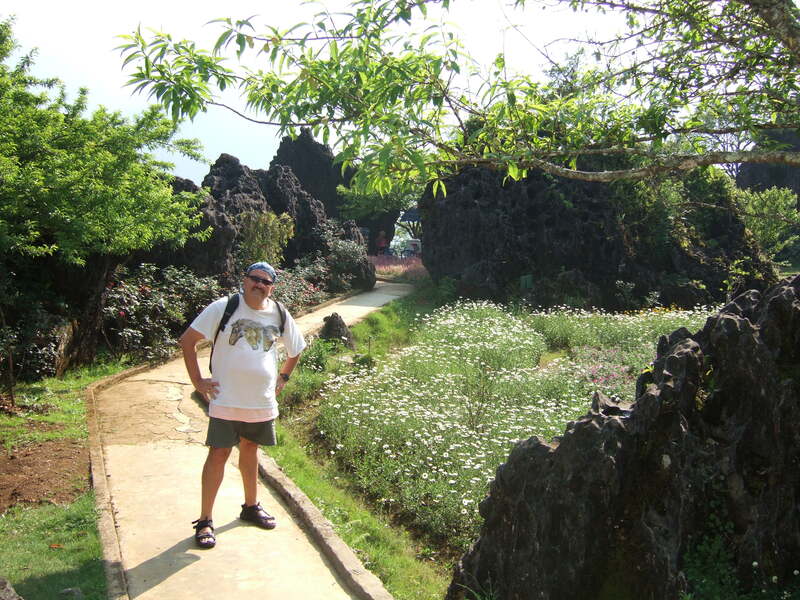 In time, our driver signaled that we needed to leave, so we clambered into the car and within an hour we were at the bay. We were booked on the Paradise cruise lines, and were led to the Paradise café and waiting area, which brandished a mini-buffet, coffee and tea. A short time later, an announcement was made about boarding our cruise ship, and a cruise lines’ representative escorted us all to the boat, where a “welcome briefing” and safety exercise (with life jackets, et al) were underway in the dining room. 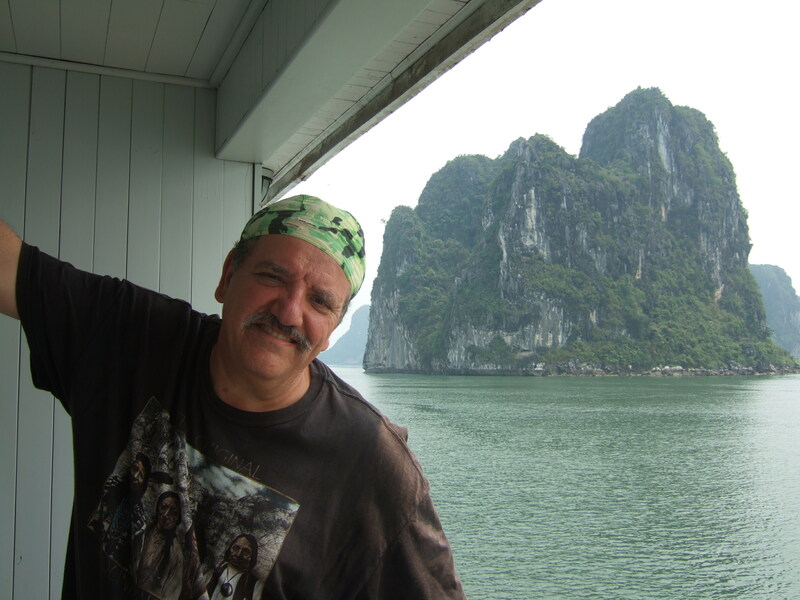 We were provided a key to our cabin, which sported dark hardwood floors, a most comfortable bed with red flower petals scattered about (seemed to be a theme in Vietnam), a modern bathroom, balcony, and a document containing an itinerary of activities. 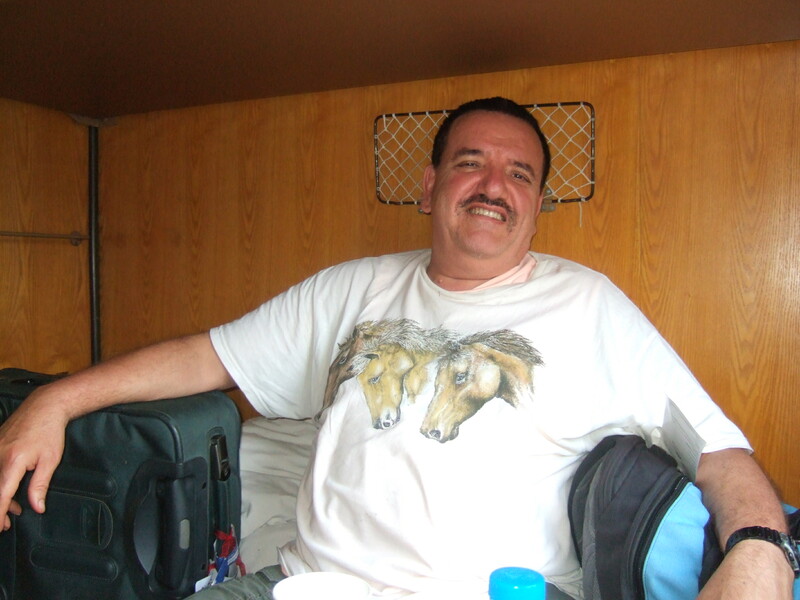 Cabin on Paradise Cruise Lines. 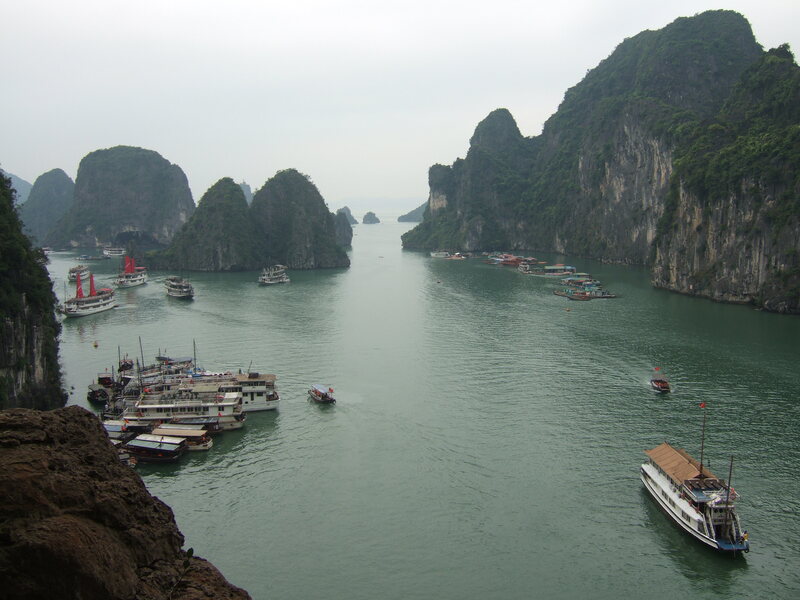 We soon set sail, and savored sea breezes from the balcony, as well as intriguing views of diverse limestone structures covered with lush vegetation and an amalgam of ships of all sizes and styles, each flying the Vietnamese flag. Traditional junk ships with corrugated brown sails, pontoons, smaller day and fishing boats, and more contemporary boats, such as ours, all shared the waters. 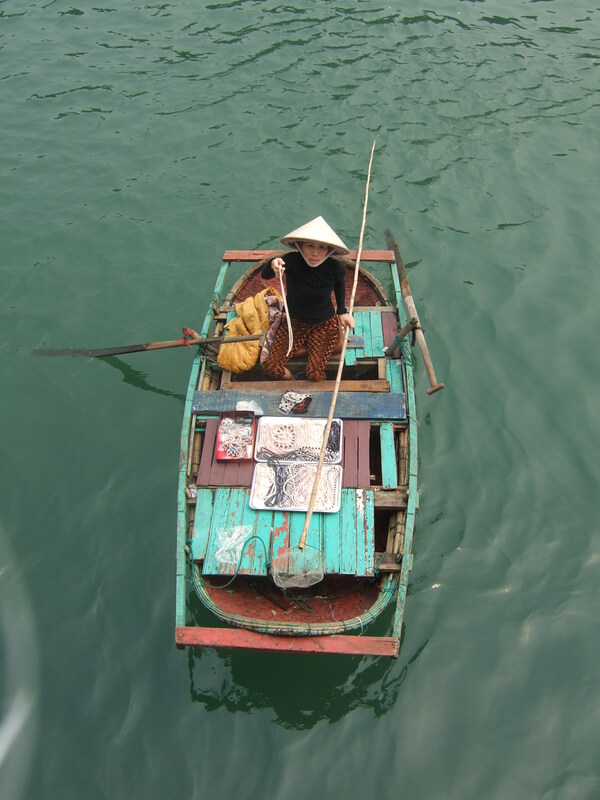 At one point, a rowboat carrying a vendor with an assortment of wares disturbed our serenity by soliciting us unrelentingly about buying a string of pearls, which she dangled over our balcony in a small net at the end of a wooden rod. While initially intrigued, we eventually retreated to the safety of our cabin and shut the blinds. 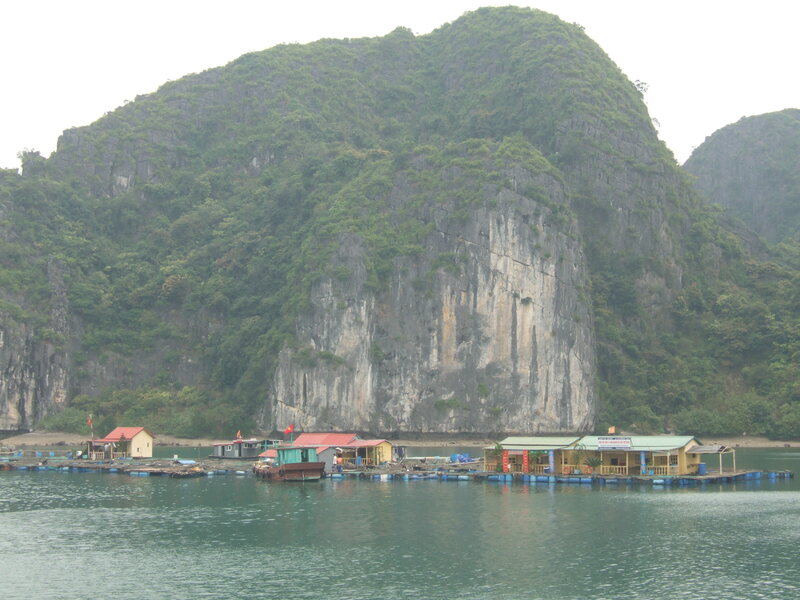 The bay’s history, itself, is quite rich and storied, as research indicates ancient cultures occupied the Halong Bay area as early as 18,000 BC, with the name Ha Long (“descending dragon”) deriving from the gods dispatching dragons spewing jewels that formed islands and stone mountains throughout the bay, thwarting the attacks of potential invaders. 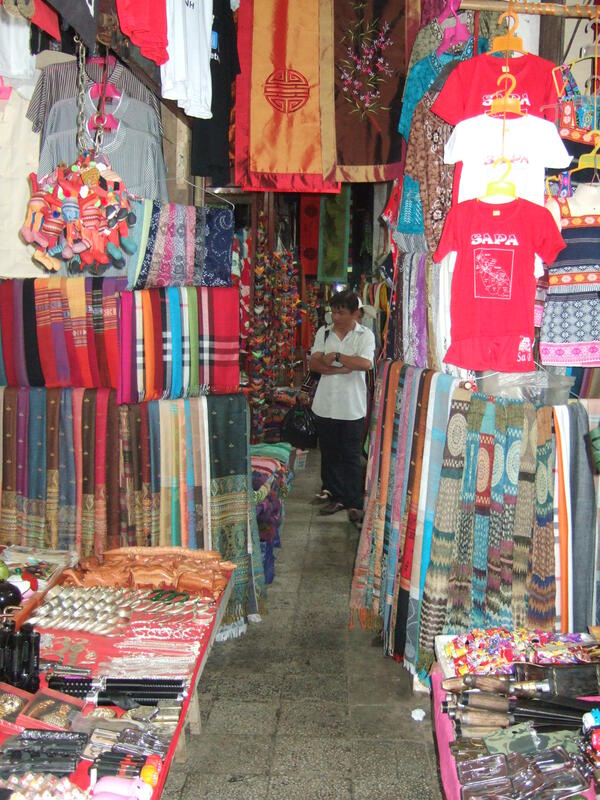 Said vendor who disturbed our serenity. At 12:55 PM, a pronouncement was made over the loudspeaker alerting us that lunch would be served at 1:00 PM. 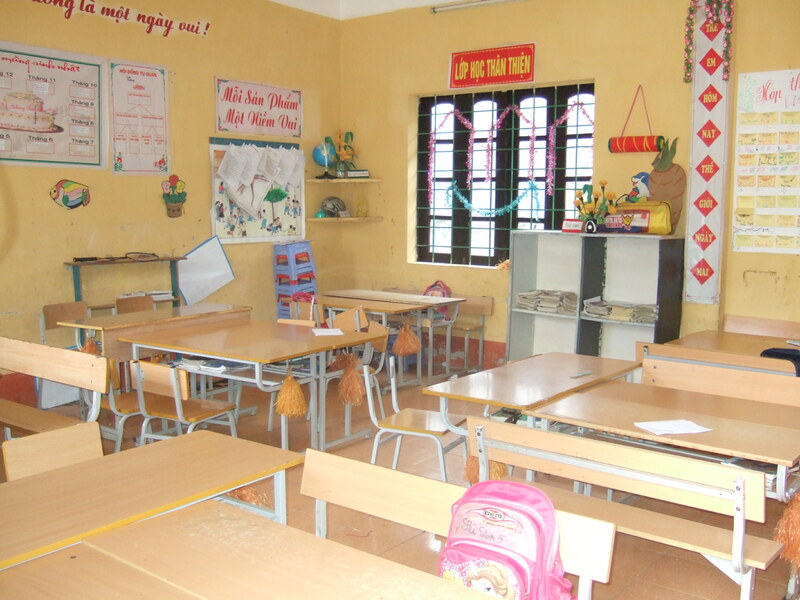 Lunch tables were set for individual families, and substantial aluminum buffet containers overflowed with pork, rice, noodles, and chicken, all flavored with Vietnamese spices such as lemongrass, mint, cilantro, ginger and cinnamon. 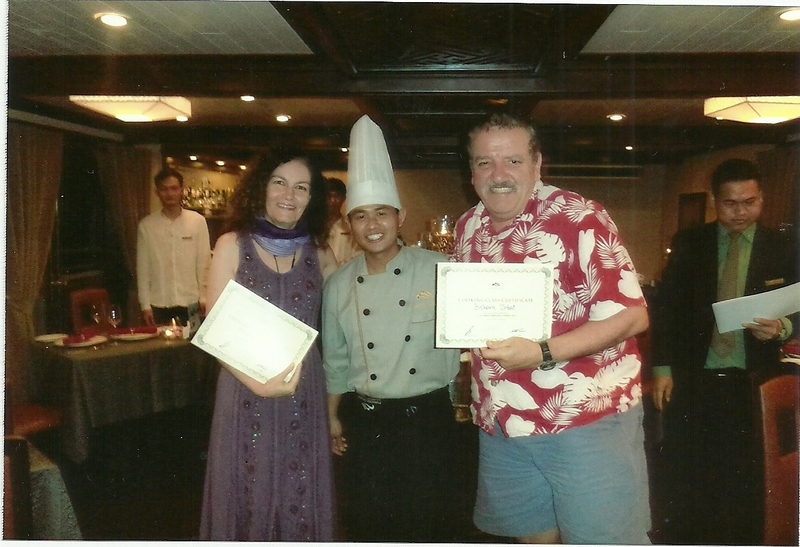 Ronald, our cruise director, made the rounds to ensure everyone was happily sated, and fully aware of upcoming activities. 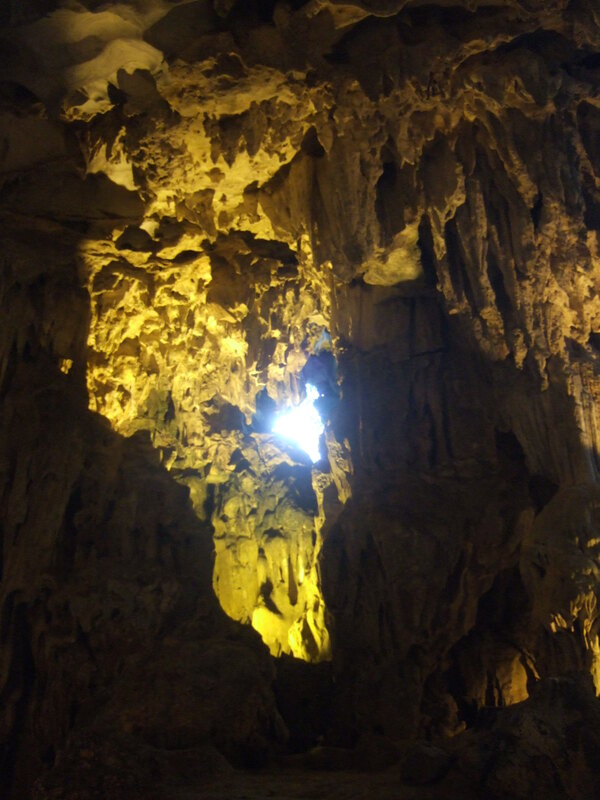 Soon after our meal, ensconced in our cabin and nodding off, another announcement jolted us out of our reverie conveying that we would depart for Surprise Cave (Hang Sung Sot), a massive and celebrated grotto on Bo Hon Island, at 2:30 PM. Lifejackets were placed over our heads and buckled in place by the cabin crew as we loaded onto a smaller boat with several rows of benches. 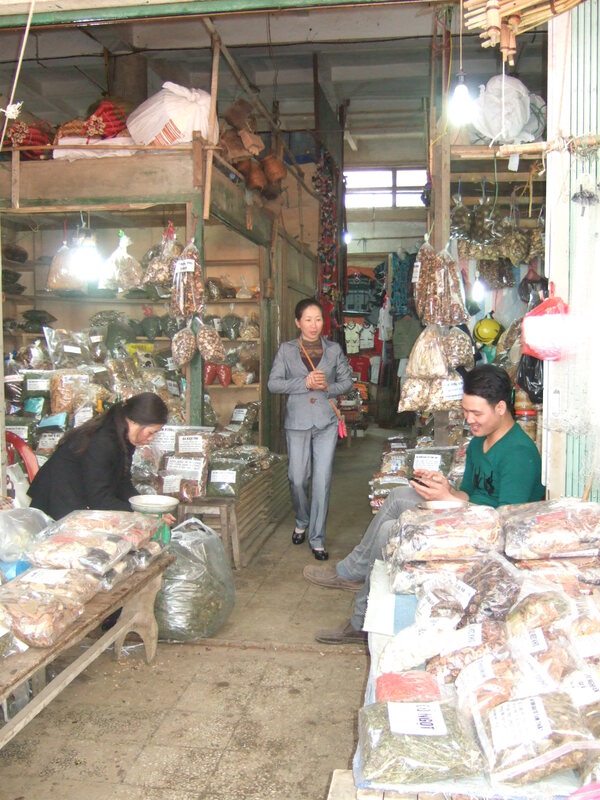 Within a short interval, we were on the wharf of Bo Hon Island being greeted by the necessitous merchants at the ready to sell visitors souvenirs and trinkets. 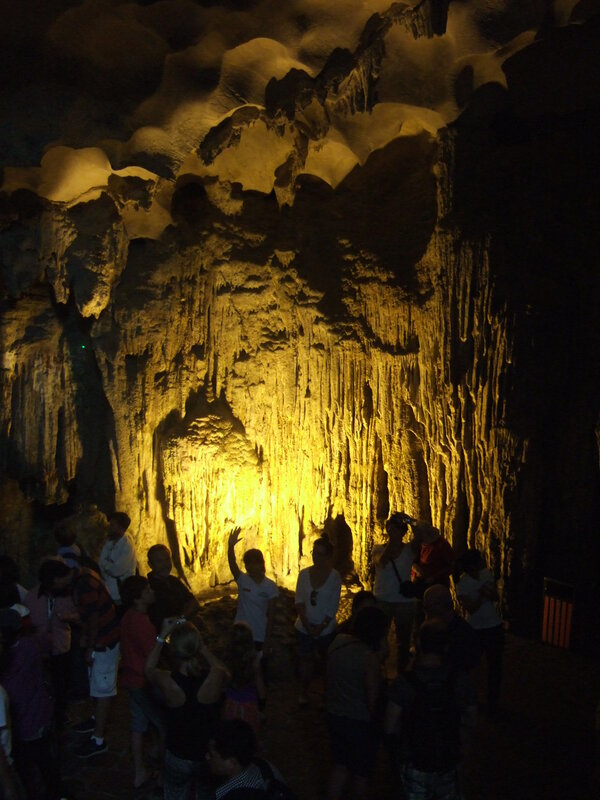 After a steep climb of uneven stone stairs we arrived at the grotto’s imposing entrance. 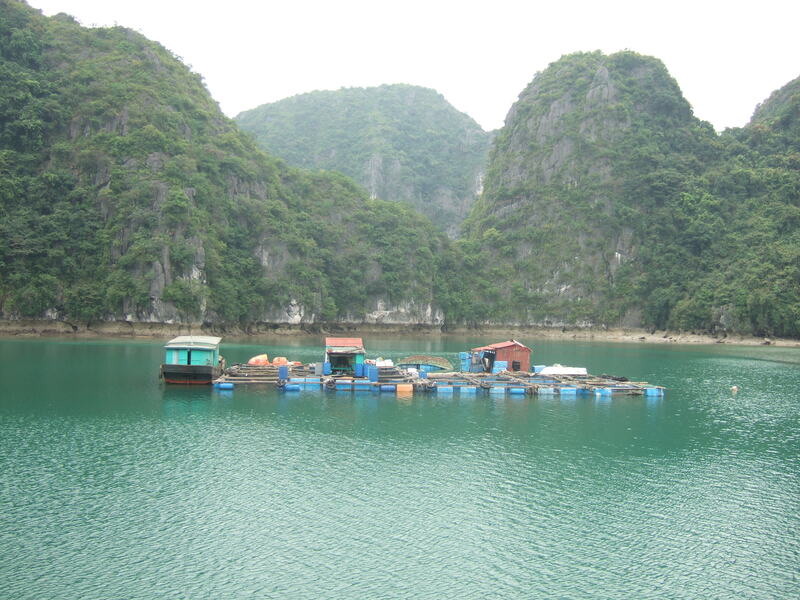 Dock at Bo Hon Island. 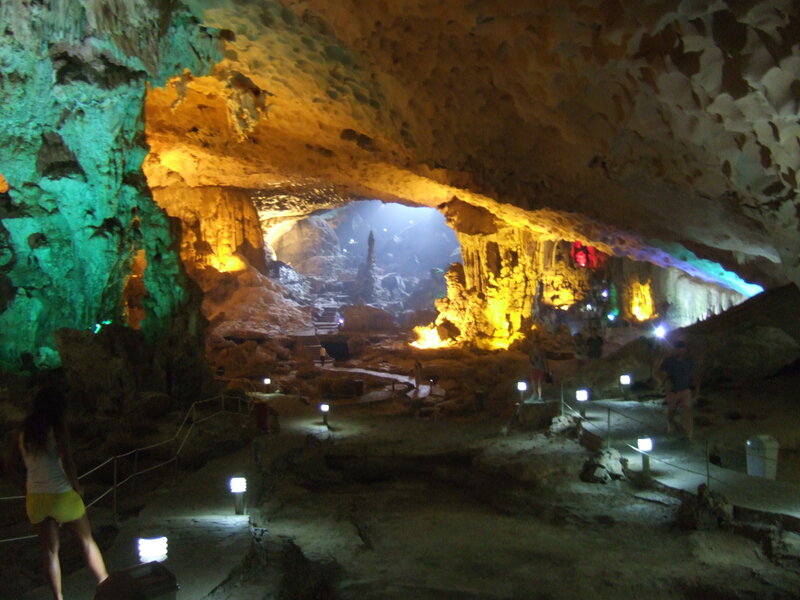 Several chambers within the cave housed haunting stalagmites and stalactites and kaleidoscopic lighting that displayed ostensible shapes of creatures, like dragons, turtles, and elephants. 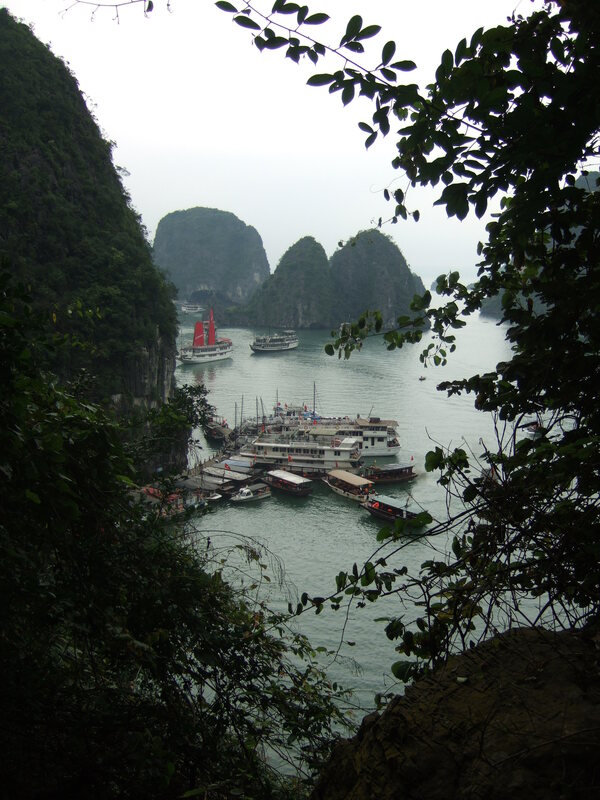 Exiting the grotto, we were rewarded with a splendorous view of Halong Bay as we cautiously descended the stairs to the dock. 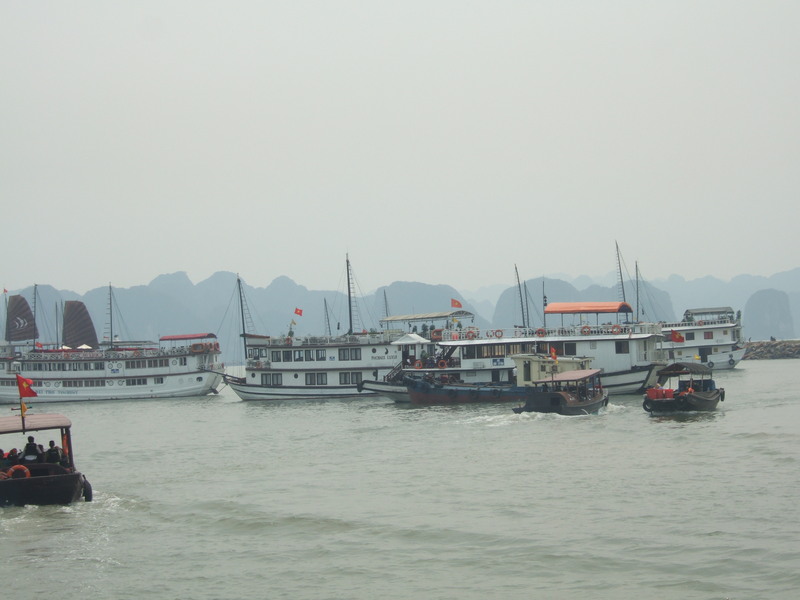 By late afternoon, we were assisted, hand by hand, from the transport boat to our cruise ship, offered lightly scented moist cloth towels and a refreshing citrus drink, before resuming our cruise through the beguiling limestone archipelago. 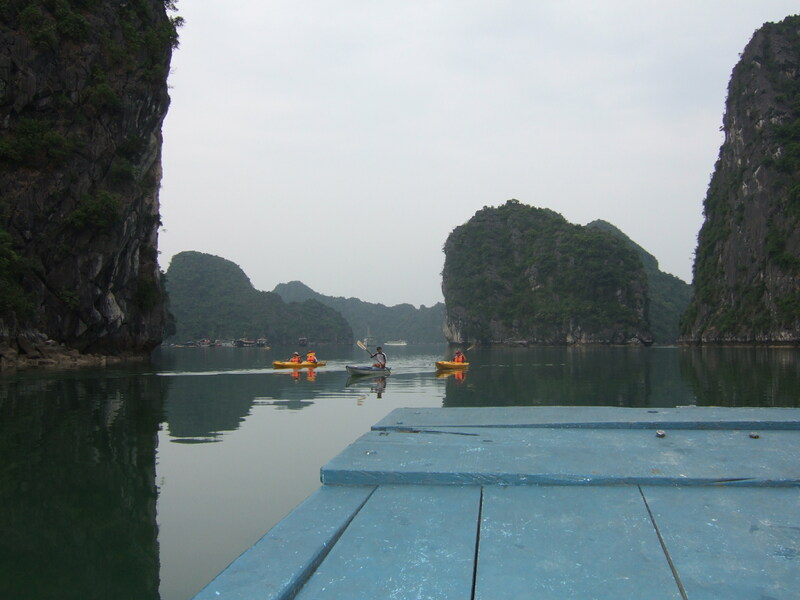 Shortly after, we docked near Ti Top Island where guests enjoyed swimming, kayaking, climbing several hundred steps to the summit of a limestone structure figured prominently on the island, or simply lazing on the beach. We chose the latter alternative, as the step climbing to and from the grotto had left our muscles crying out for a break. 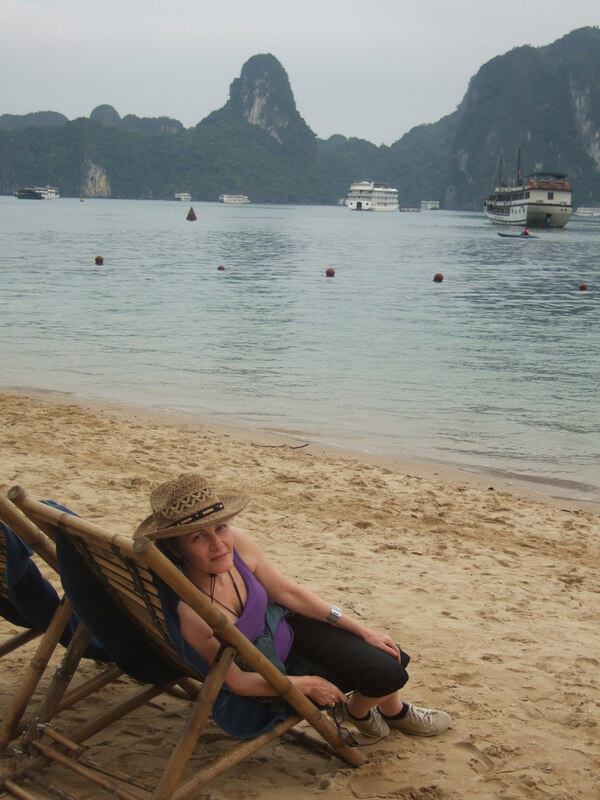 Lazing on Ti Top Island. 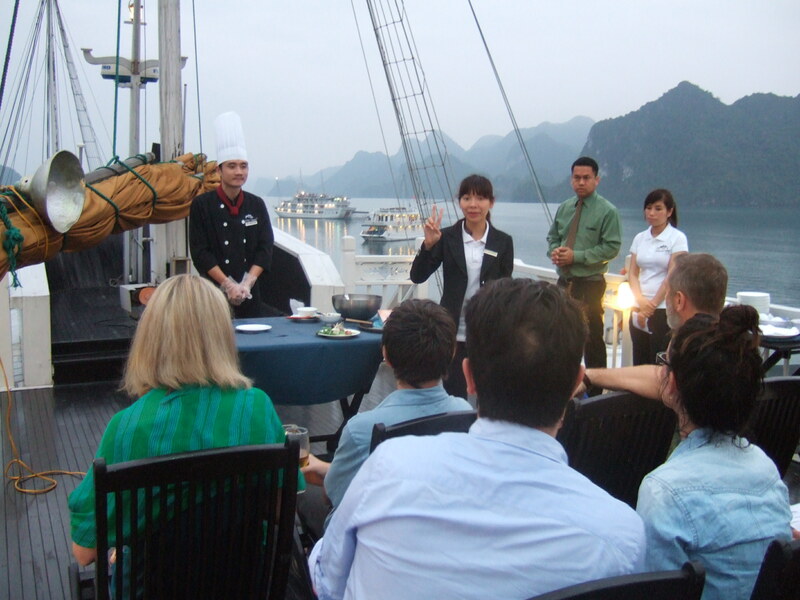 At 5:30 PM, we were on the cruise liners’ top deck learning how to make Vietnamese spring rolls with other cruise guests while the ship’s chef, cruise director, and cabin crew looked on, offering words of encouragement, while the sun set over the bay. We were the last up showcasing or skills at pasting fish sauce on rice patties, folding up the ingredients (shrimp, mint leaves, cilantro, basil, garlic, lettuce, and lime juice) into the patty and tucking the edges back into the wrapper. 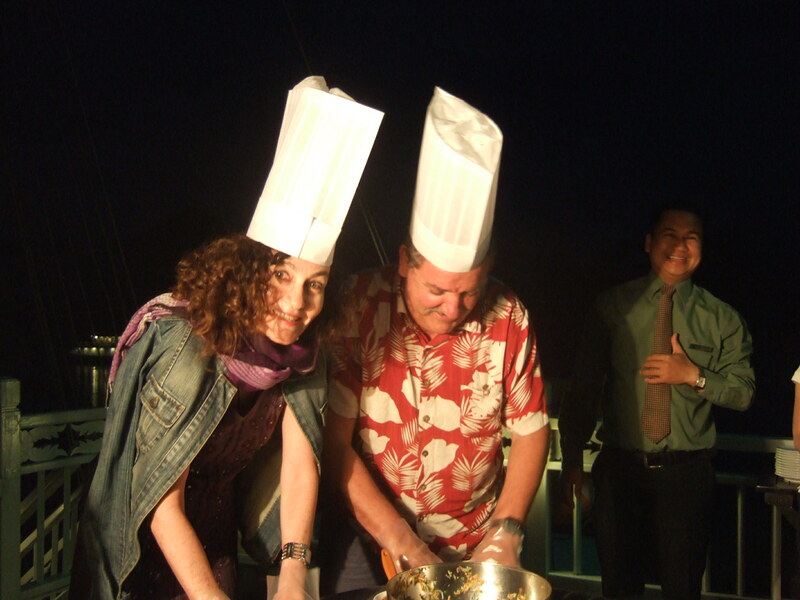 Within the first several seconds of our demonstration, the chef’s hats placed on our heads by the cruise director only moments ago were whisked away by the sea breezes; we were truly big-headed. 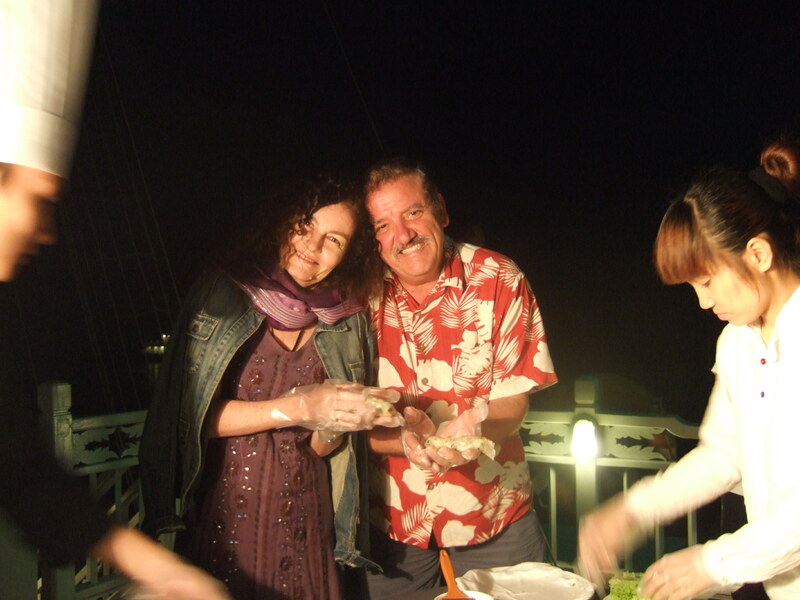 The cooking exercise was complemented with “Happy Hour” festivities, including a “two for one” offer and complimentary rice wine, a potent drink of choice for Vietnamese. Our dinner began with the dispensing of “Cooking Class” certificates, followed by a five-course Vietnamese meal (similar in composition to our lunch buffet), and ended with the showing of the film, “The Quiet American” starring Michael Cain; a movie that focuses on Vietnam’s conflict with the French in 1952 along with events leading up to America’s war in Vietnam, all amidst a nefarious love triangle. 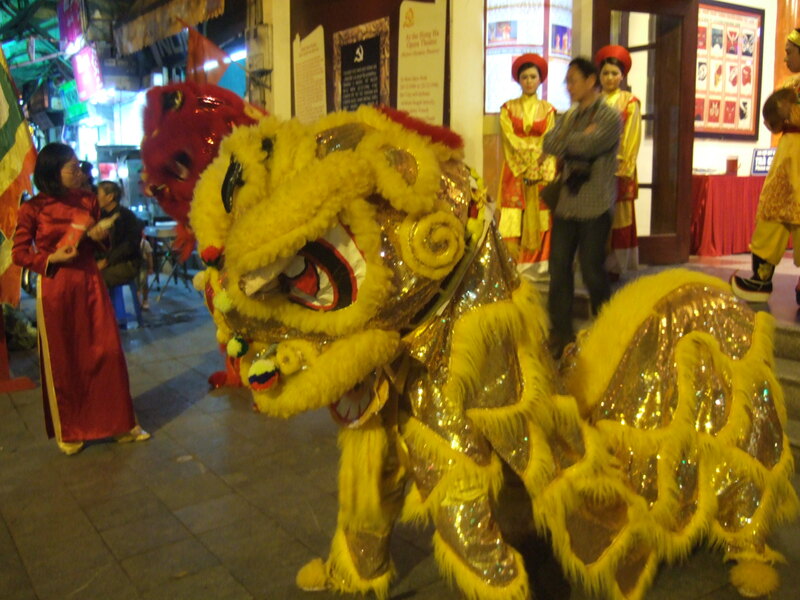 We slept peacefully overnight, and although we had the opportunity to participate in a Tai Chi session at the break of dawn on the sundeck, we determined the extra hours of sleep were an extravagance we did not want to miss. 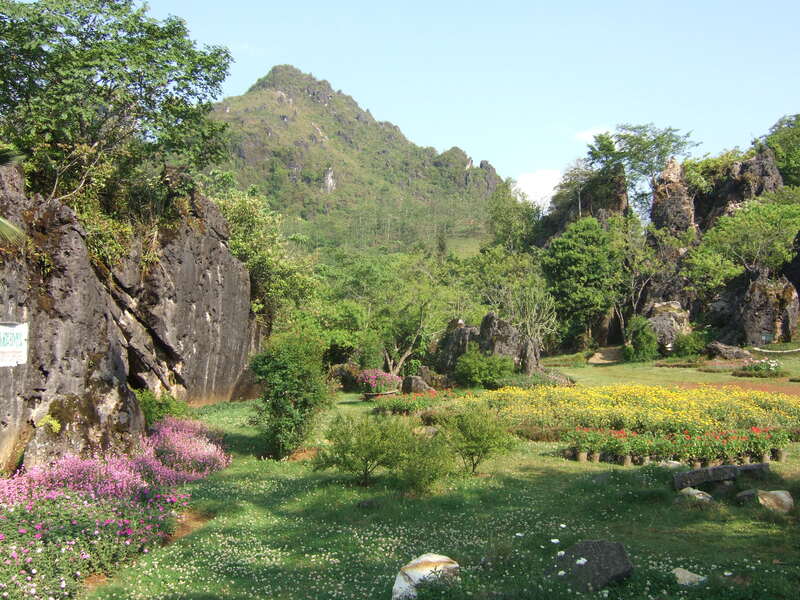 Of course, we did not opt out of breakfast served, buffet-style, at 8:50 AM, boasting exotic fruits, Vietnamese pastries, “made to order” omelets, and alluring views of distinct limestone formations through oversized windows of the dining area. 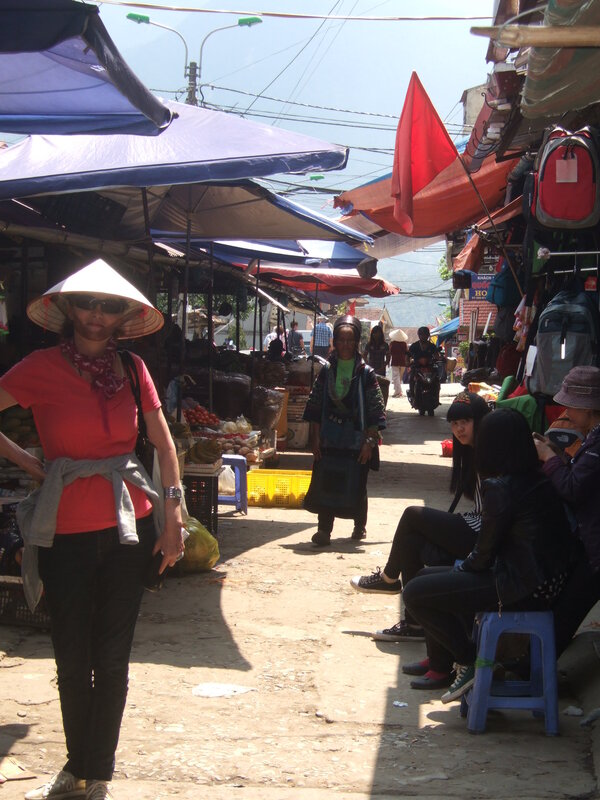 Keeping to the activities schedule, at 8:30 AM, we were boarded a day cruiser to visit Viet Hai Village on Cat Ba Island. 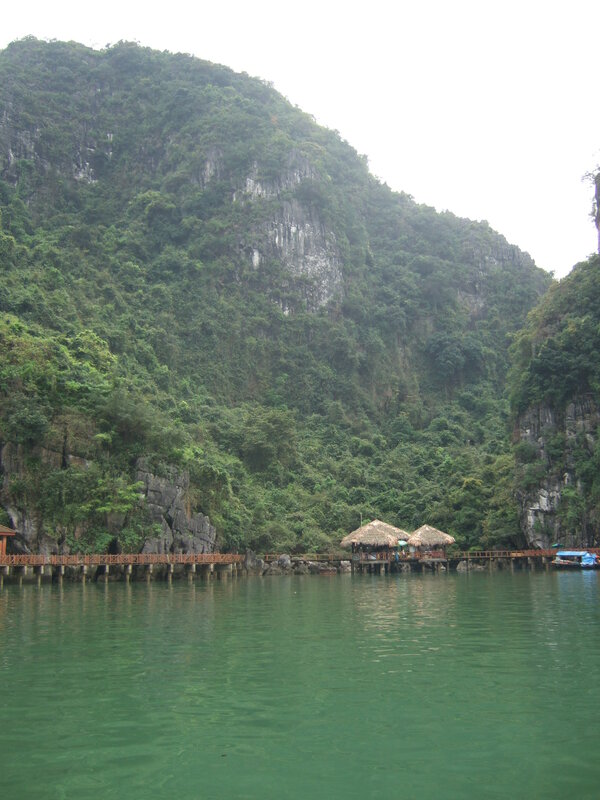 A two hour trek by motor boat afforded us added views of the elaborate and picturesque chain of limestone isles, sparkling azure waters, and a captivating network of floating fishing villages. 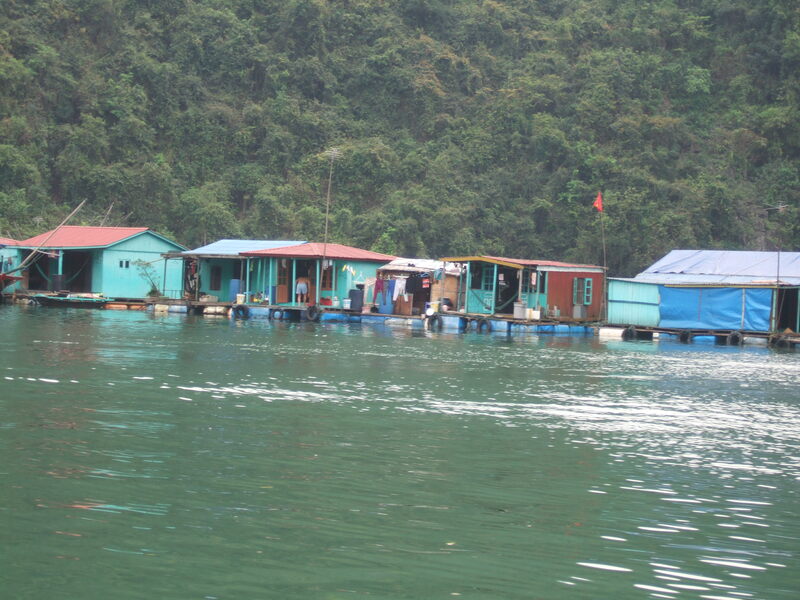 Roughly 1,000 people live in dwellings on these floating villages where the occupants support themselves through fishing and aquaculture. Currently, concerns are growing around residents’ safety due to recent powerful storms, as well as the continued sustainability of vulnerable ecosystems. 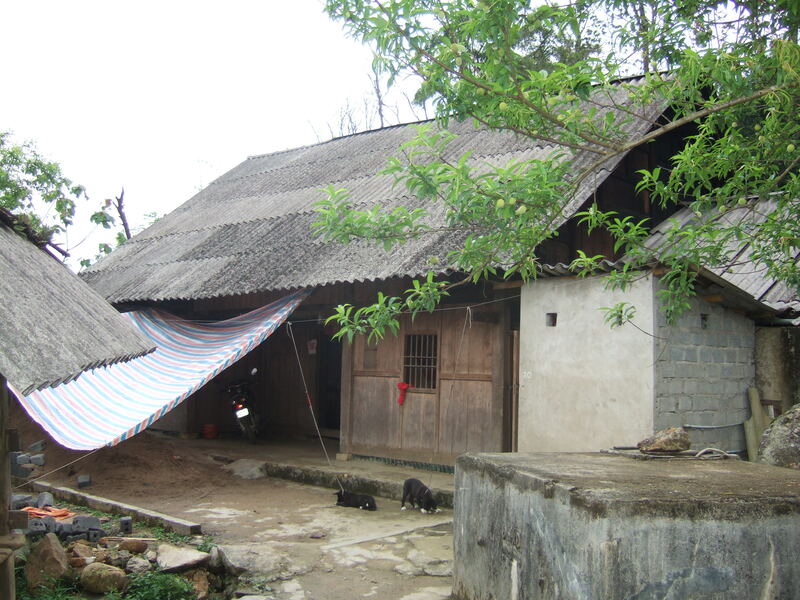 Our Cat Ba Island guide divulged that he spent his formative years in one of these villages, and his family may be required to leave due to the ever-increasing destruction from storms. 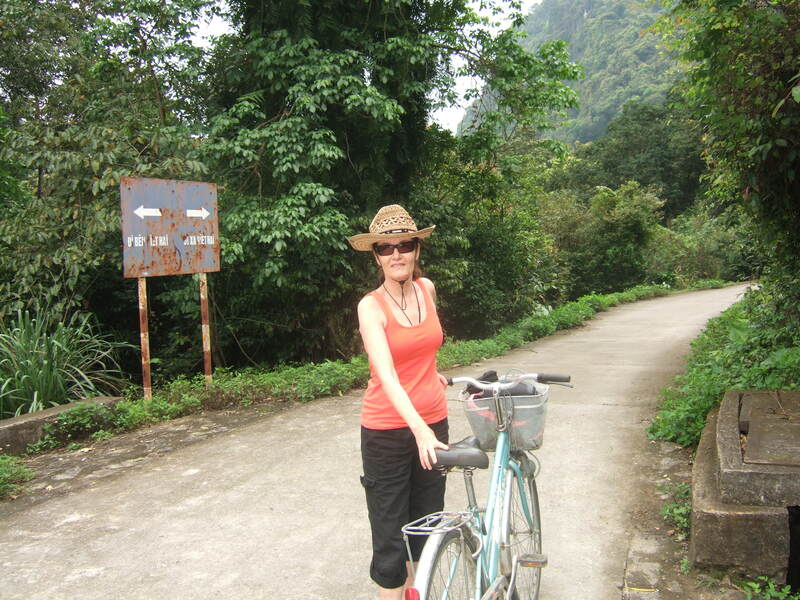 Headed for Cat Ba Island. Arriving on Cat Ba Island, Bishara, with a heavy backpack containing our essentials and an inherent lack of balance, made an attempt to jump from our cruiser to a smaller boat, with two young Vietnamese men assuring they would assist in a safe dismount, that resulted in a slippery landing, a twitching boat, and Bishara and the two assistants flat on their backs. Despite my angst, Bishara jumped up, laughing, while grabbing each of the young men by an arm and pulling them upright. 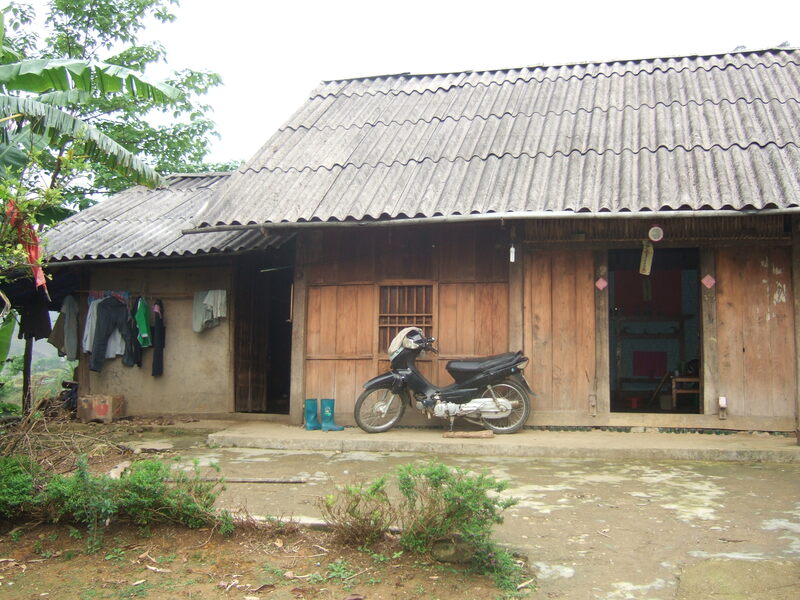 After determining that all was fine, we were given the option of hopping on the back of a scooter or riding a bike into the village of Viet Hai. 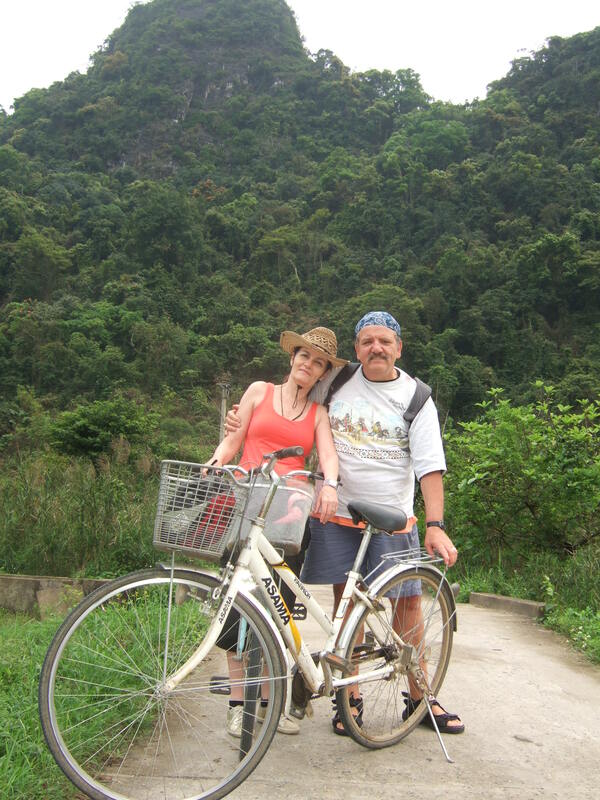 We elected for the latter alternative, and were pointed in the direction of some rather rickety-looking bikes. Undaunted, I jumped on the first bike I sampled, and was off. Close behind were Bishara, two young couples, and our guide. 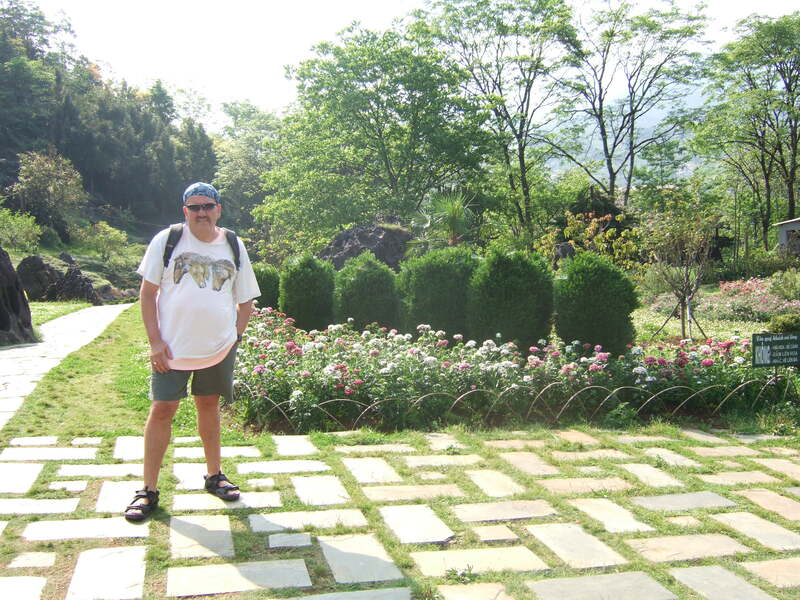 We traveled along a concrete path with flourishing greenery bordering our route and blanketing the surrounding stone forms. Silhouettes of the village appearing in the background. 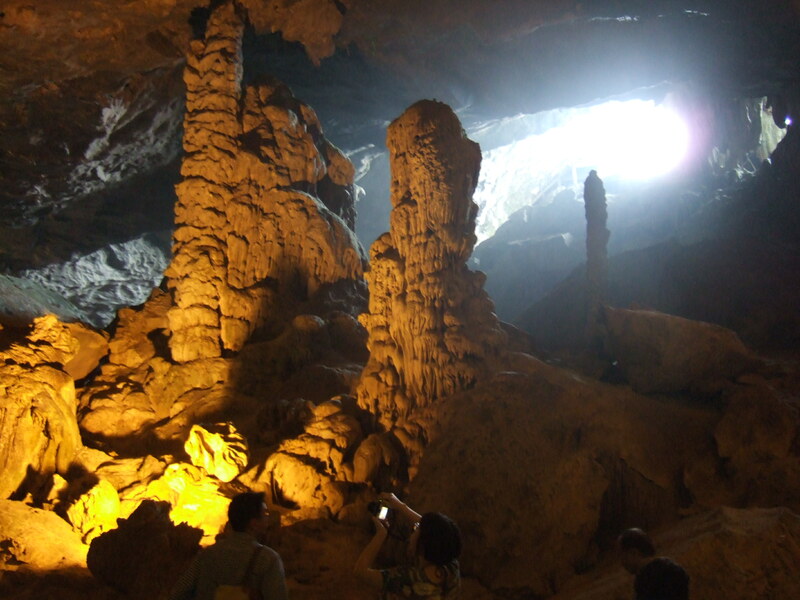 Within forty minutes, the silhouettes of single story structures appeared at the base of a rocky ridge. 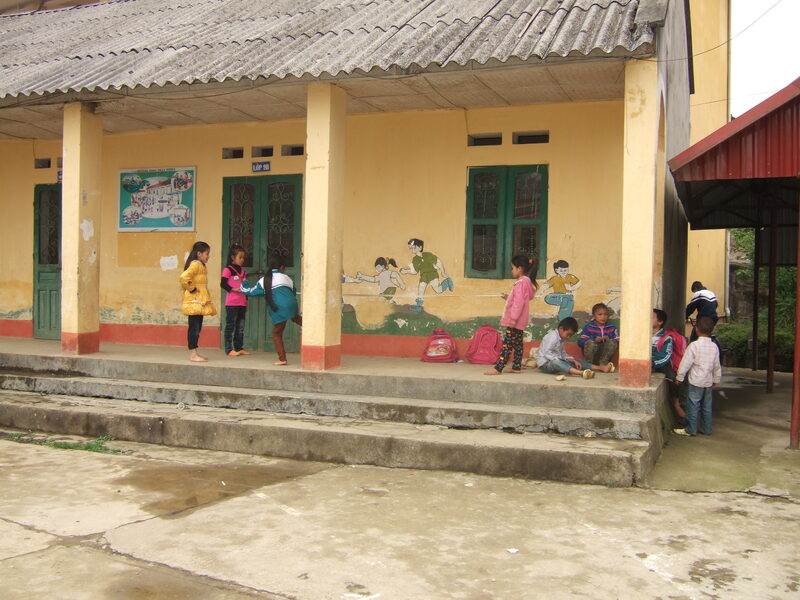 Biking to the edge of town, our guide pointed out a small medical office, as well as a grade school and nursery school. 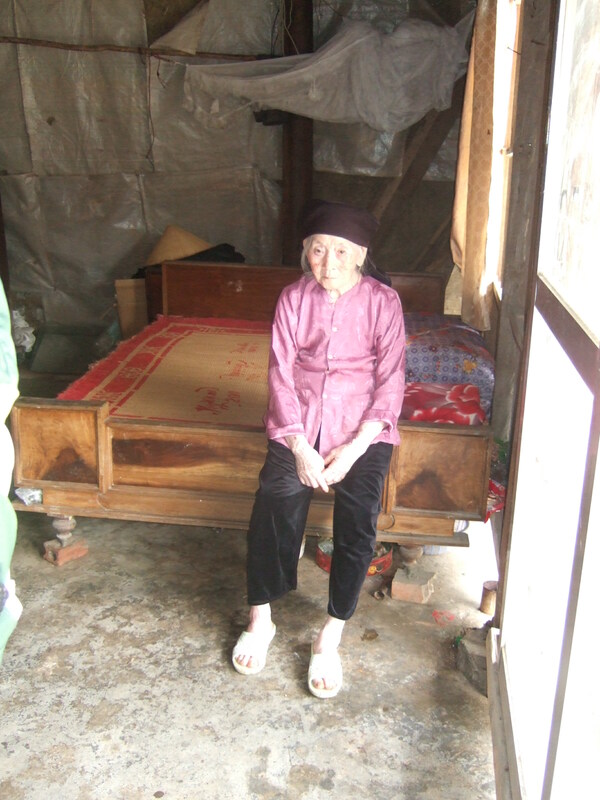 We were all preoccupied, however, with a prepossessing 95 year-old woman, matriarch of the village, who inhabited an austere dwelling with a sliding glass door, and slept on a straw mat atop a wooden box propped up with bricks beside a plastic tarp sheltering a nearby wall. The village people, we were told, took care of this matron’s every want; including making provisions for cooking and medical needs. Oh, the stories locked behind the faded and seasoned eyes of this aged beauty. 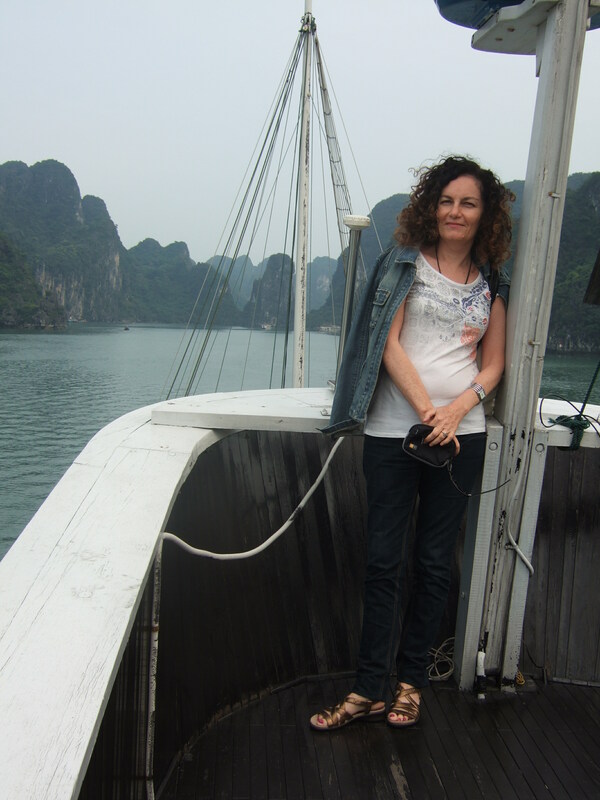 After a glorious ride back to the dock and re-boarding the Paradise Cruiser, we were served a sumptuous multi-course lunch on an open air deck, and ultimately anchored at the Dark and Light Caves. While some kayaked, we embarked on a small power boat with new friends and indulged in the allure of the surrounding setting. 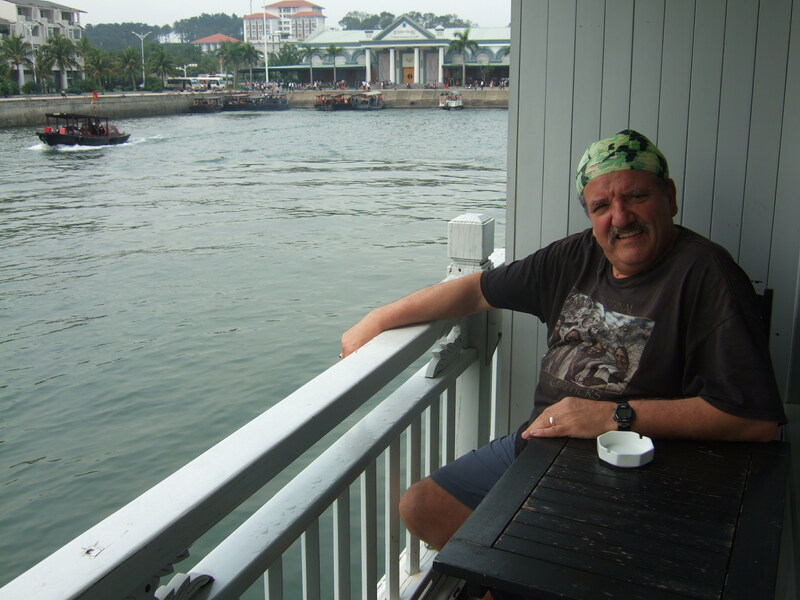 We were aboard our main cruise ship by late afternoon, and the next morning docked at Tuan Chau Island, the origin point of our cruise. 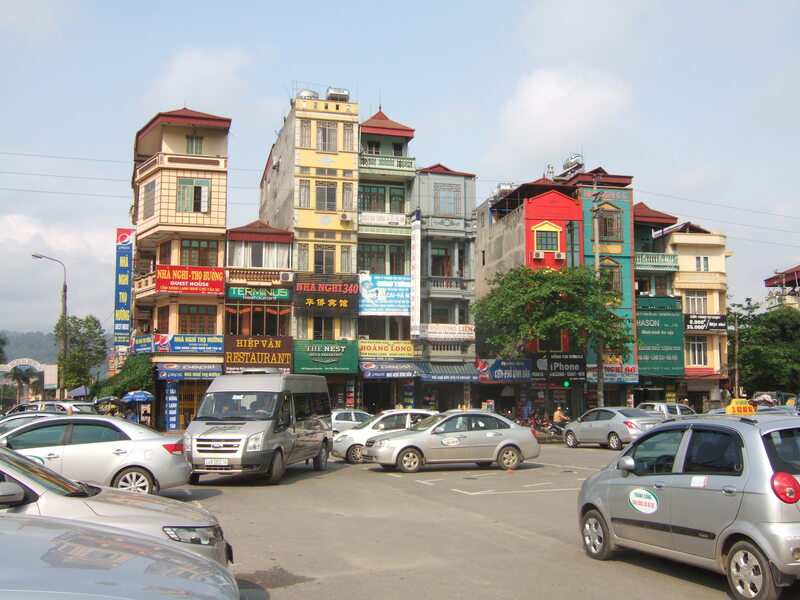 After an enchanting trip, we looked forward to returning to lively Hanoi for a couple of days before traveling by overnight train to the mountain town of Sapa. “You’ve got to be kidding,” I responded, incredulously. 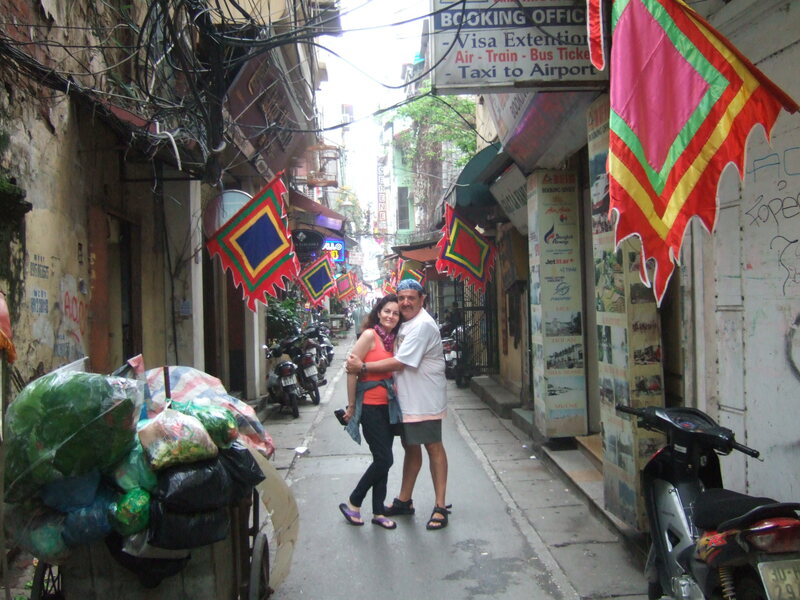 “Why would you want to go to Vietnam for vacation?” My husband, Bishara, and I were having breakfast, a time often reserved for airing a variety of issues, planning for upcoming activities, and such. 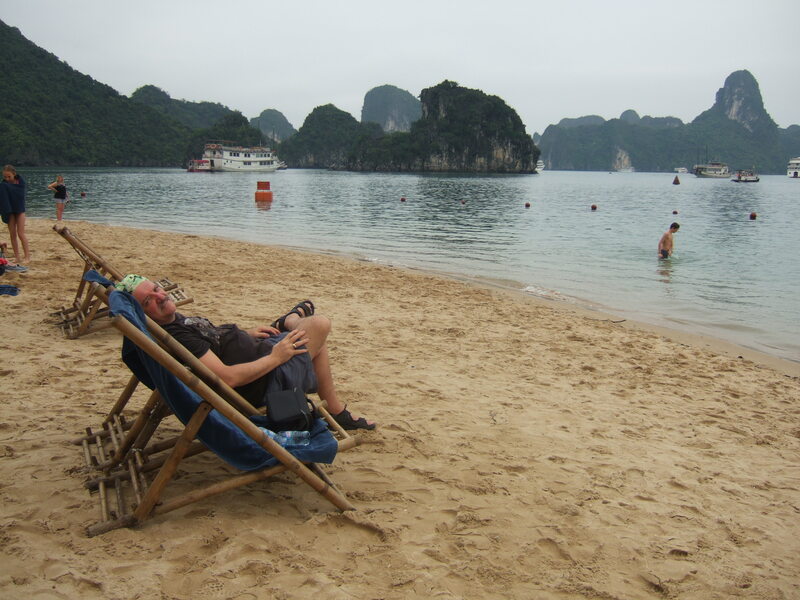 Not to say that the idea of vacationing in Vietnam had not been broached before by my husband. For the last several years, Bishara has, on occasion, garnered the courage to advance the notion, which I have always, not so indelicately, struck down. 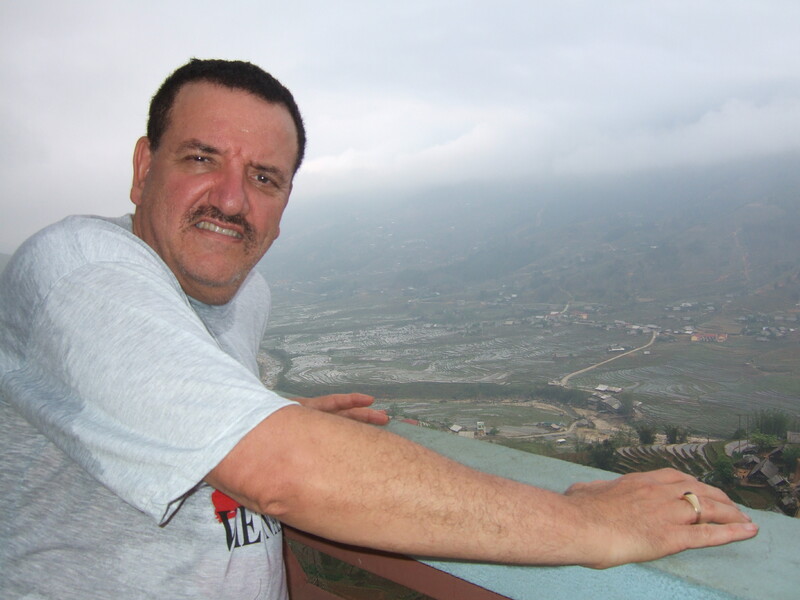 Living in the Arab Gulf, Saudi Arabia in the early 2000’s, and Qatar for the last nine and a half years, has afforded us some remarkable travel opportunities, which we have taken full advantage of. 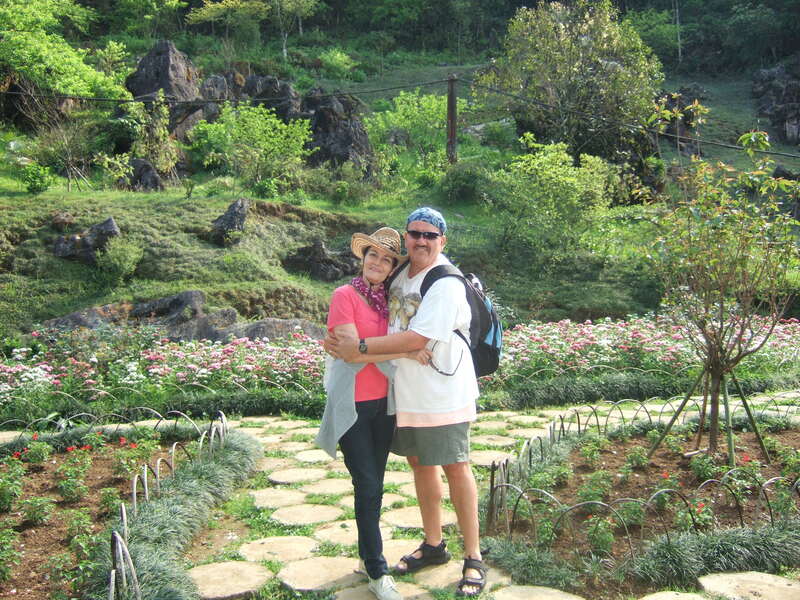 We have particularly appreciated the relative convenience of visiting Southeast Asia, and have had the good fortune of travelling to Thailand, Indonesia, and Malaysia. 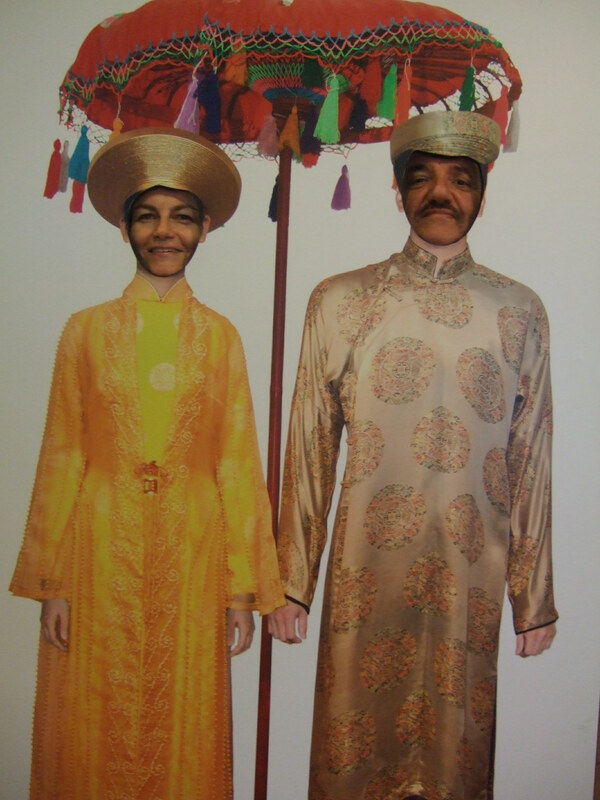 Our time in each of these countries has been nothing short of wondrous and life enriching. 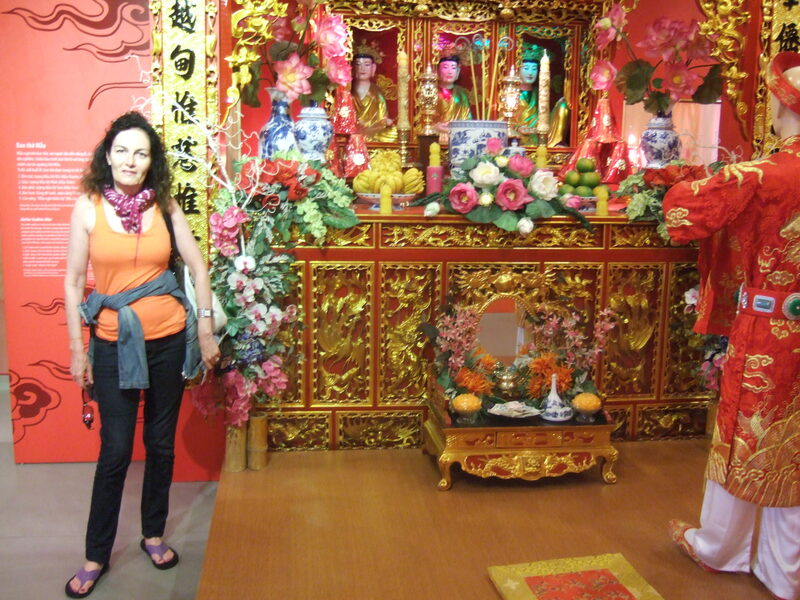 Vietnam, in my mind, however, was a different story. America had fought a contentious war there, and had lost. 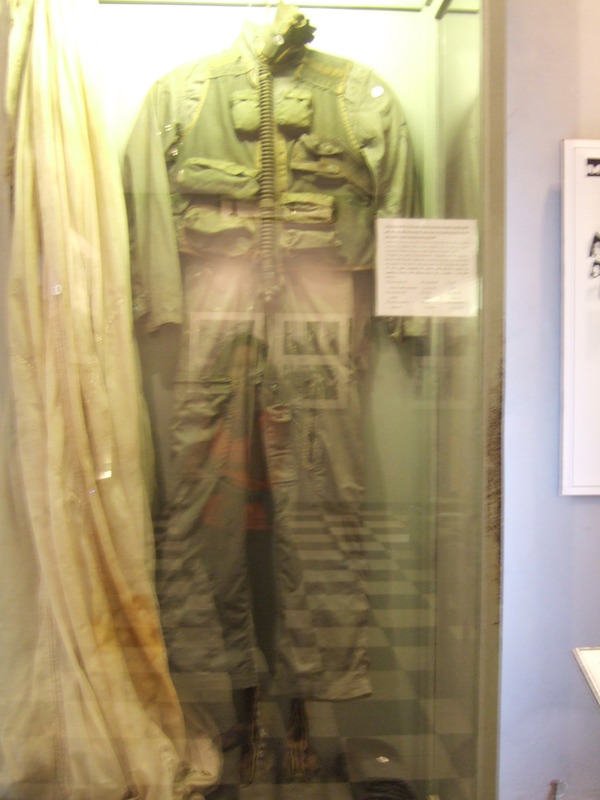 Etched in memories of my 1960’s childhood were the nightly airings of the frontline battles on our family TV, against a backdrop of lush tropical settings, ubiquitous rice paddies, and the fallen being transported by comrades to waiting medical helicopters. This was definitely not a favored vacation destination. Bishara, who had been watching the same images on TV as a child halfway around the world in Jordan, had a more visceral reaction to the scenes. 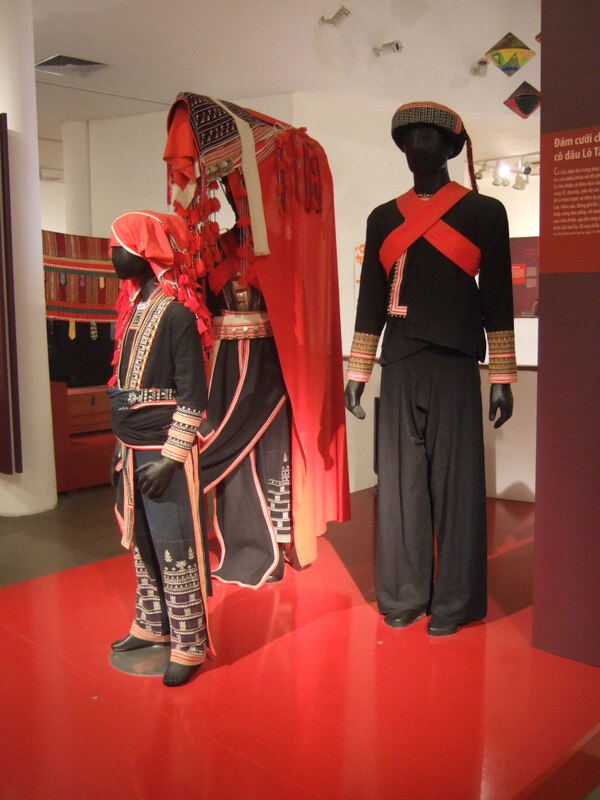 Having experienced warfare, first-hand, in Jordan and later in Lebanon’s civil war, Bishara felt more empathy for, and a personal connectedness to, the war weary on both sides of the conflict. 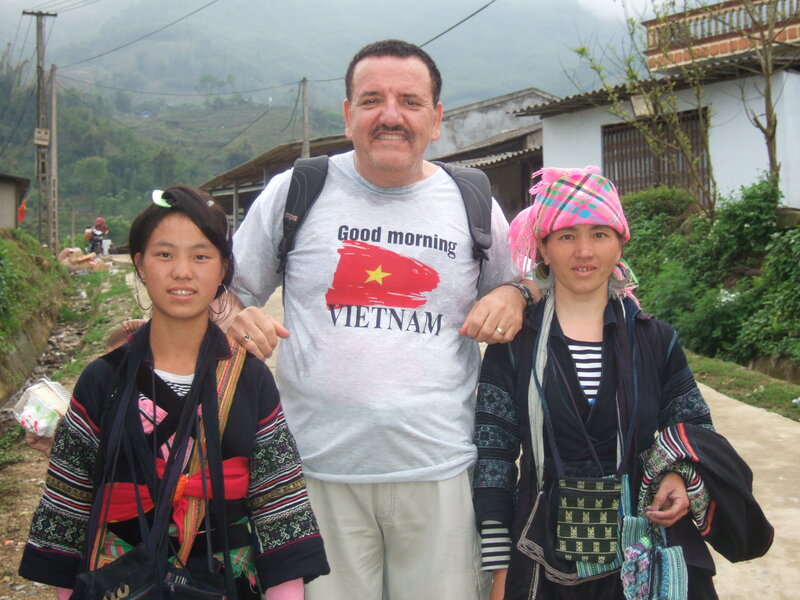 My resolve began to dissolve several months ago when I began hearing reports from expatriate friends who had visited Vietnam and revealed that this country on the Indochina Peninsula was a captivating place with magnificent scenery, a rich history, and sumptuous food. 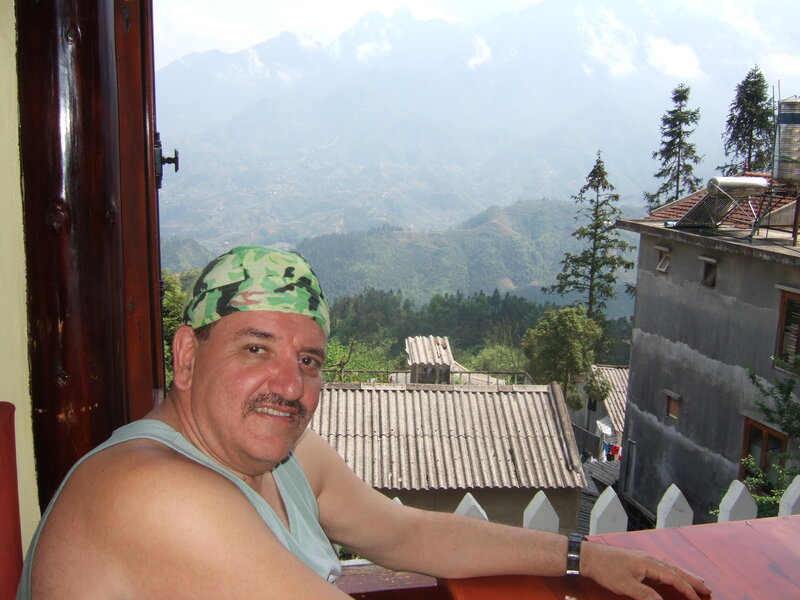 So maybe there was something to Bishara’s penchant for vacationing in Vietnam. 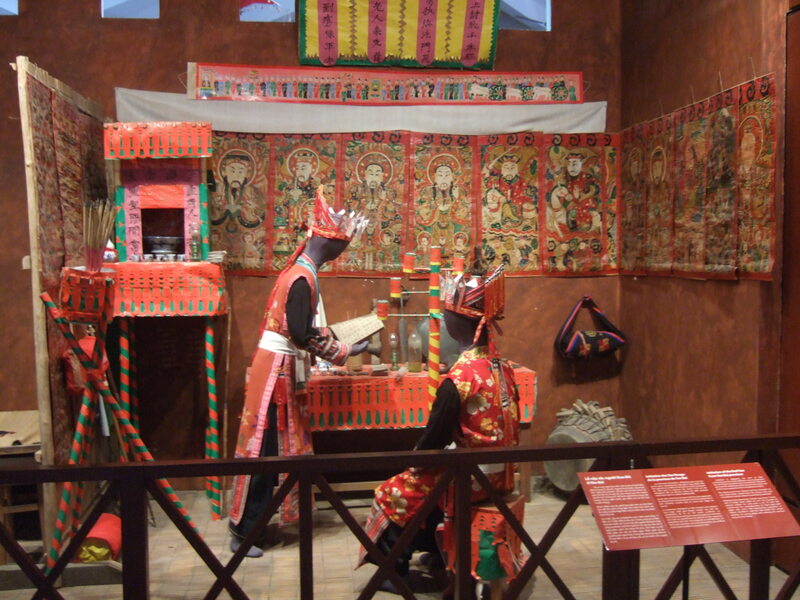 I began doing the research and determined that while there were many travel plan options when in the country, the north had the mountains, diverse ethnic groups, and an intriguing history. 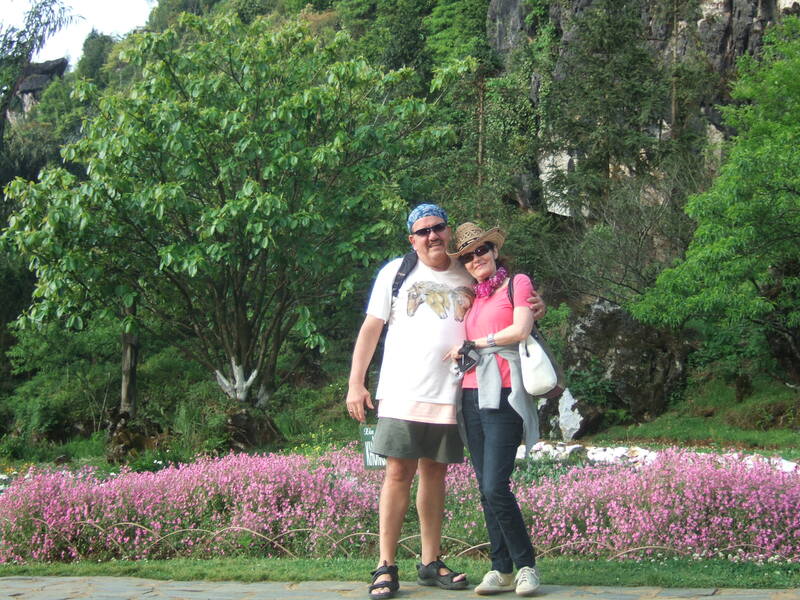 A plan was developing, and we eventually settled on a 10-day trip in early April with Hanoi as home base, and side trips to include a cruise on Halong Bay (to the east of Hanoi) and Sapa, a picturesque mountain town in the northeast of the country. 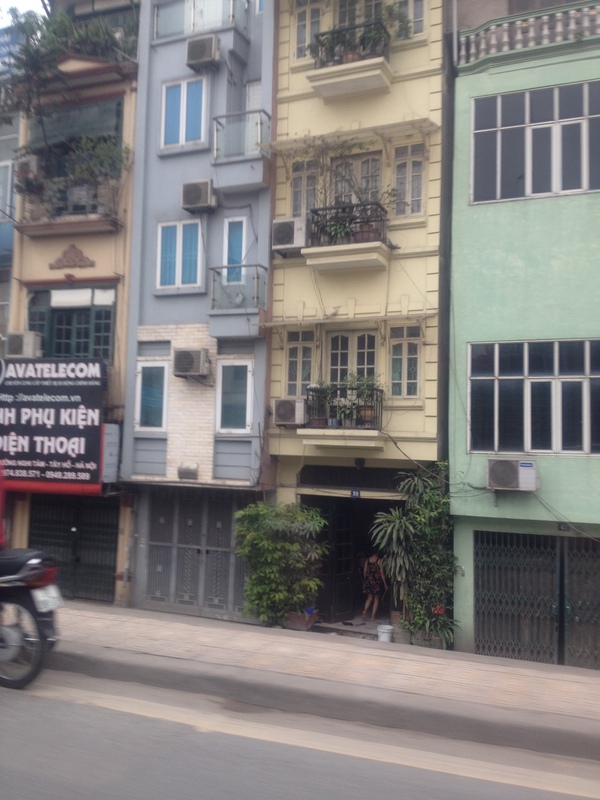 Many tall, narrow buildings in Hanoi. Blurs of small trucks, scooters, and women wearing conical straw hats working the rice paddies off the highway began crystalizing into alluring tall, narrow buildings hinting of French colonialism with flowered balconies and wrought iron railings, more scooters, and quaint tree-lined streets, as we entered Hanoi’s Old Quarter. We were already enamored. 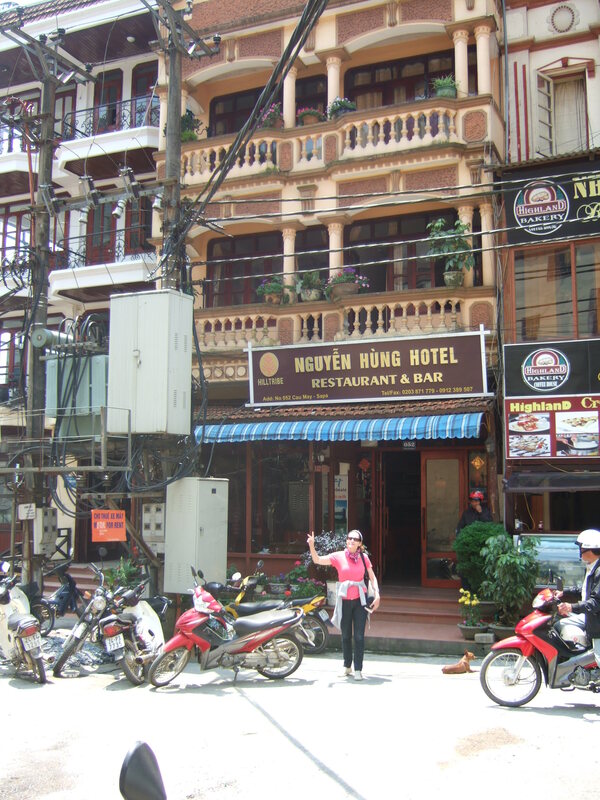 Within an hour we arrived at our accommodations, the Hanoi Elegance Ruby Hotel, located in a lovely and active alleyway in the middle of the Old Quarter. A porter and several representatives of the hotel came outside, warmly welcomed us, and all helped to expedite the movement of our luggage from the car into the boutique hotel. 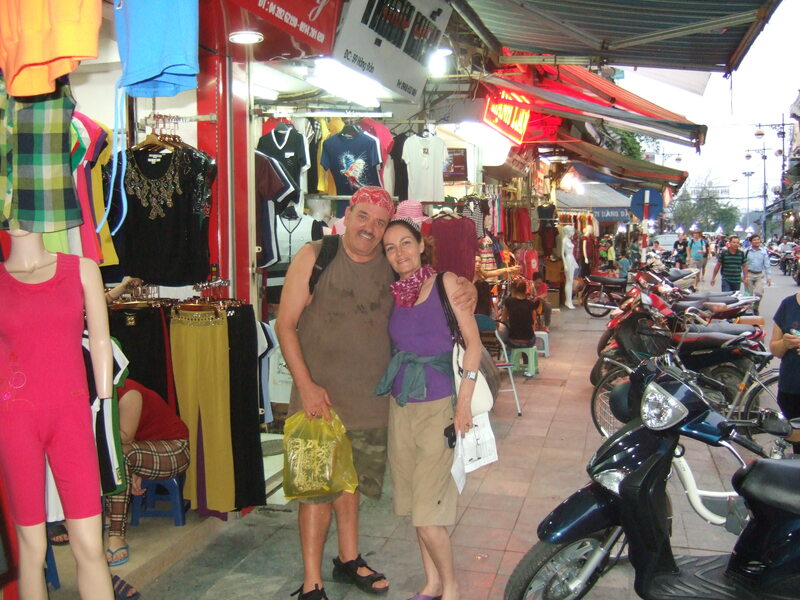 Once inside, we were offered wet cloth towels to freshen ourselves, fruit juice, and suggestions on sites of interest and dining options in Hanoi. 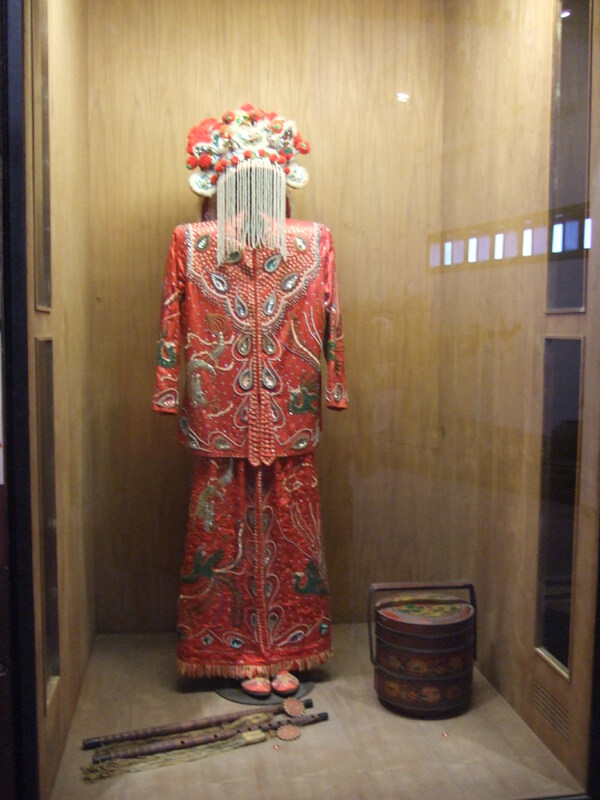 Before we knew it, the porter nabbed our luggage and began running up five flights of stairs, while we rode the diminutive elevator with a hotel receptionist. 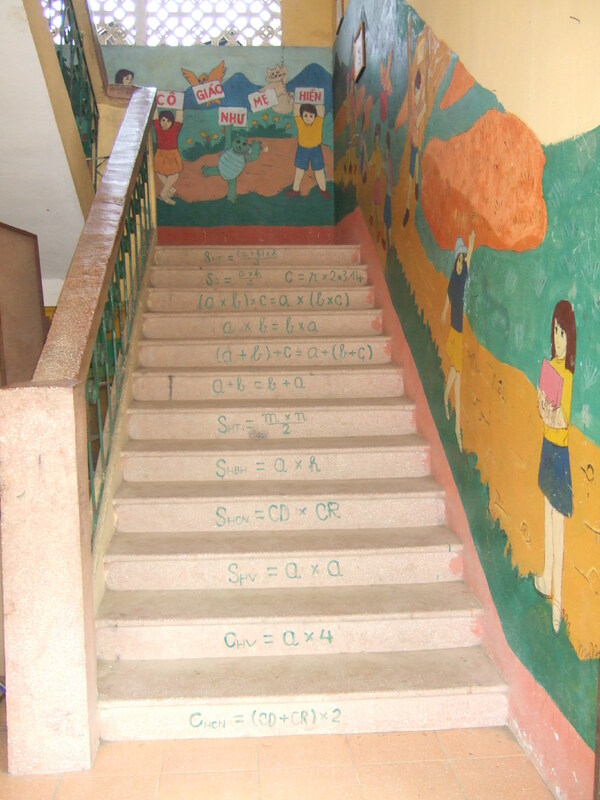 When Bishara expressed concern over the porter carrying our unwieldy luggage up all those stairs, the receptionist casually predicted that the porter would beat us to the fifth floor; and he was right. Our room was designated “VIP,” however, in style and design, only. Cost was merely average by American standards. 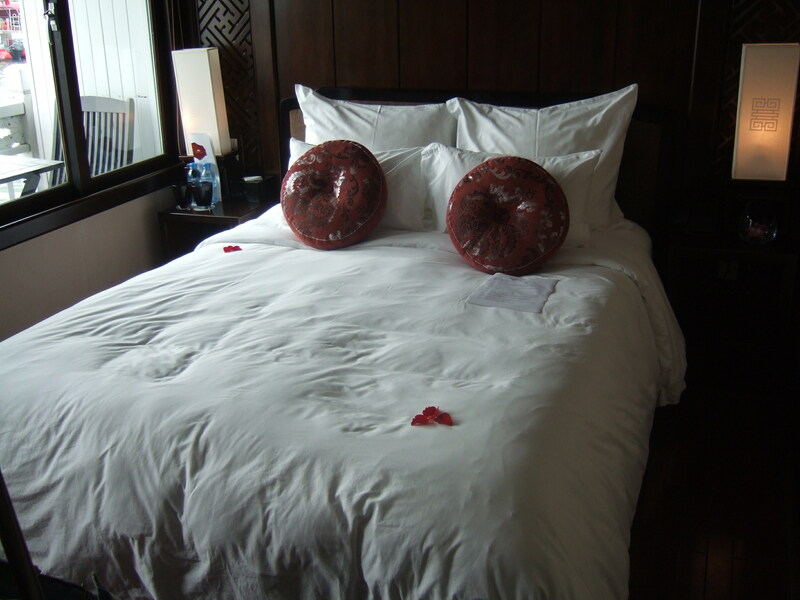 Spacious, with hardwood floors, beautiful finishings and furnishings in the Vietnamese style, red flower petals scattered on the bed, a balcony, and complimentary bottle of wine, the room was exceedingly comfortable. 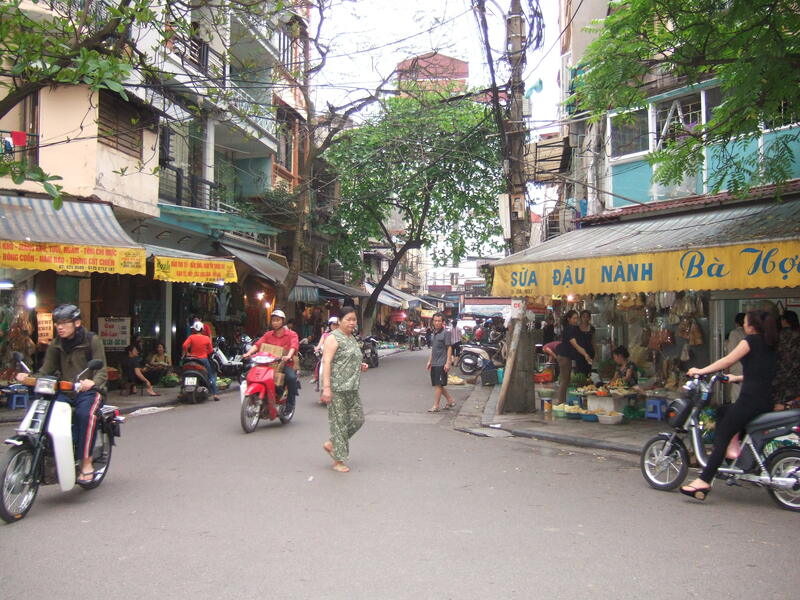 After settling in, Bishara and I headed downstairs, anxious to sample Vietnamese cuisine and Hanoi’s Old Quarter. The Old Quarter’s patchwork of roads and alleyways (originally 36 streets) are nearly 1,000 years old, and emerged from a series of working villages, each plying a specific trade. 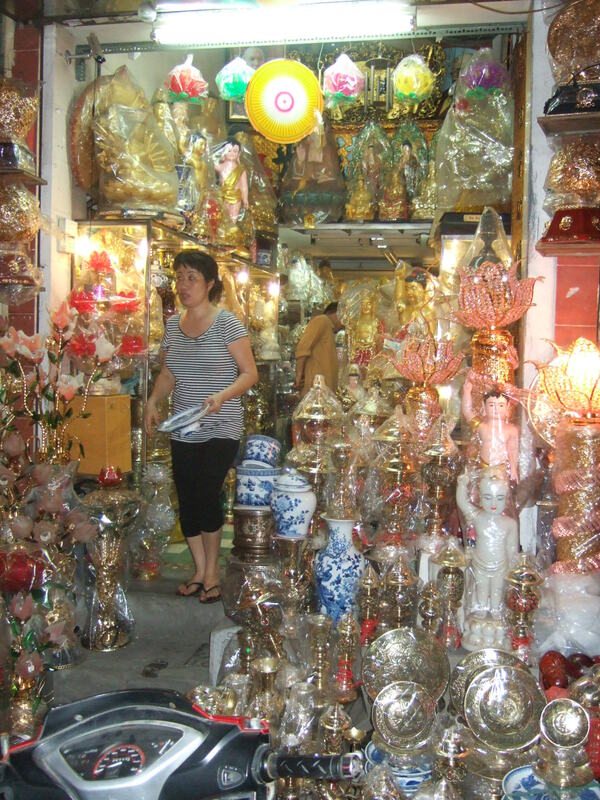 Some streets harbor the same trades as centuries ago, like sheet-metal and tin materials; others have changed to focus on items like bamboo or electrical merchandise; and still others are a hodgepodge of different offerings, from t-shirts and dessert sweets, to hair salons and spas. 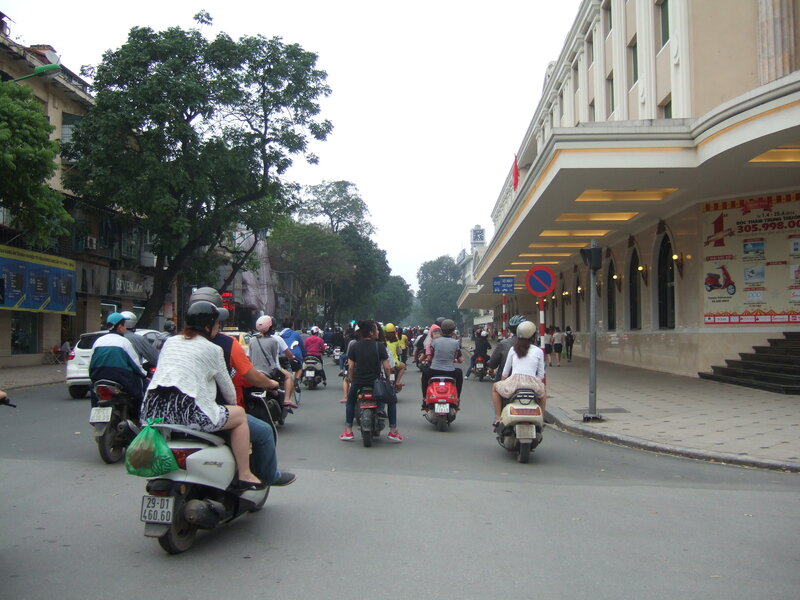 These days, motor scooters are everywhere, in the streets and rows upon rows parked on the sidewalks, oftentimes limiting the space for walking, but somehow lending to the chaotic charm of the place. 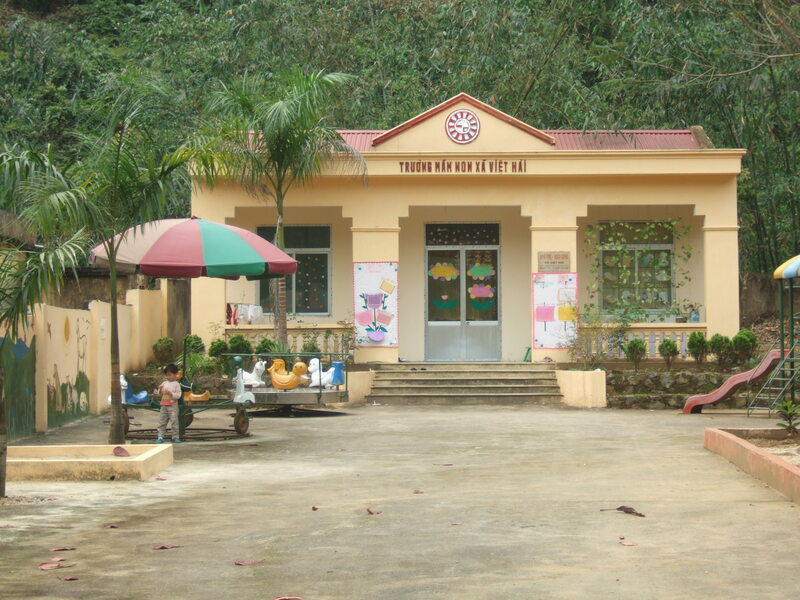 The reception desk had recommended Quan An Ngon restaurant for a traditional Vietnamese meal, and since it was not an easy walk, a taxi service was called. Two hotel business cards were handed to us with the receptionist stressing that the card would come in handy when returning to the hotel. 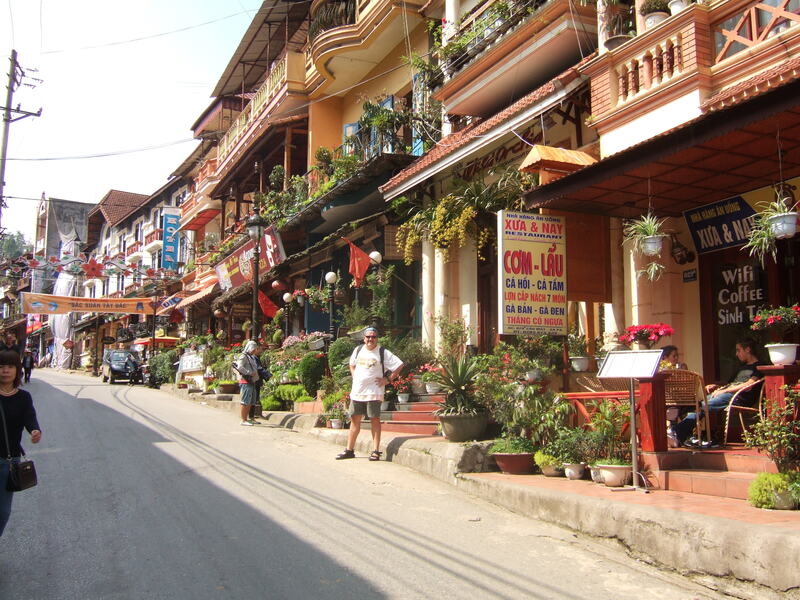 Slipping into the waiting taxi, I told the driver we were going to the Quan An Ngon restaurant. Dead silence. 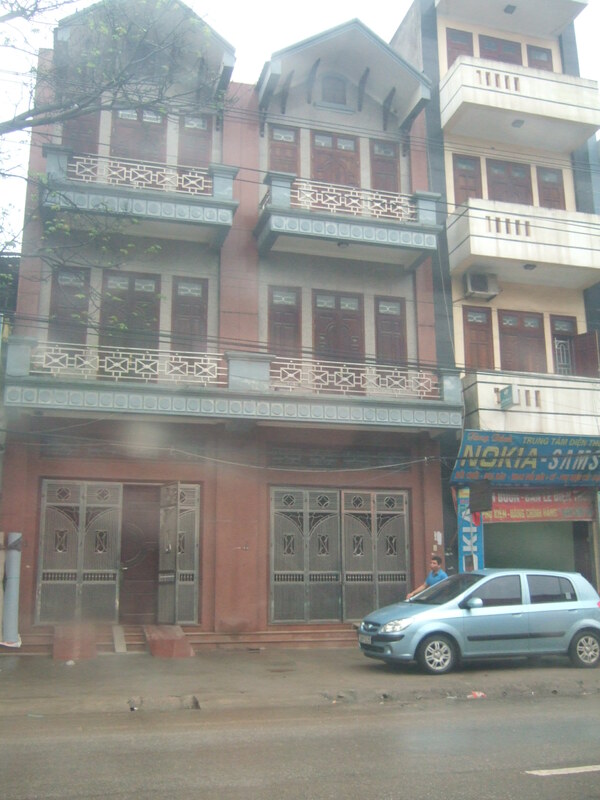 Again, Bishara this time; “We are going to Quan An Ngon restaurant.” Not a sound. Fifteen minutes later, the driver stopped and pointed, unceremoniously, to the right. “Ah, this must be the restaurant,” I remarked. 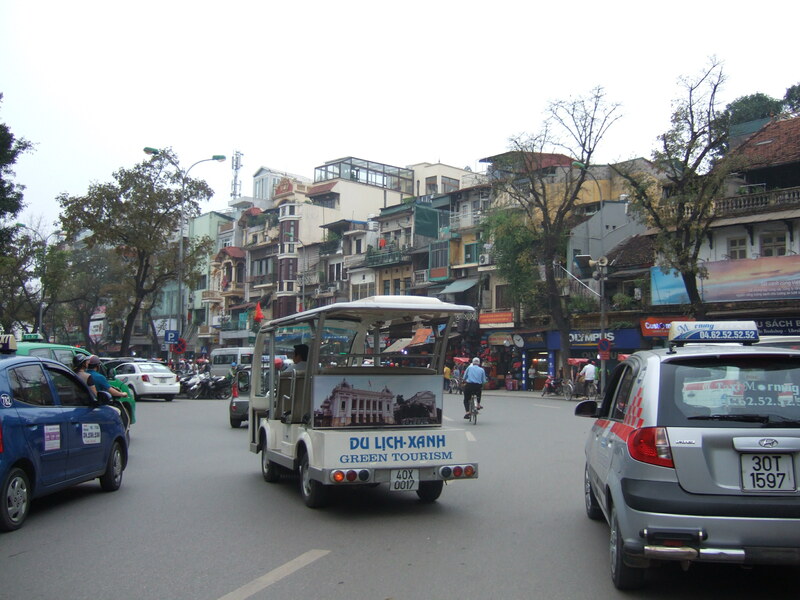 It would become apparent that Hanoi taxi drivers rarely spoke English; evidently, the hotel had spoken with the driver, or taxi service, about where we would be dining. Looking out for our welfare and that of other hotel guests was an enduring priority; always carried out, though, in a most understated and unpretentious manner. 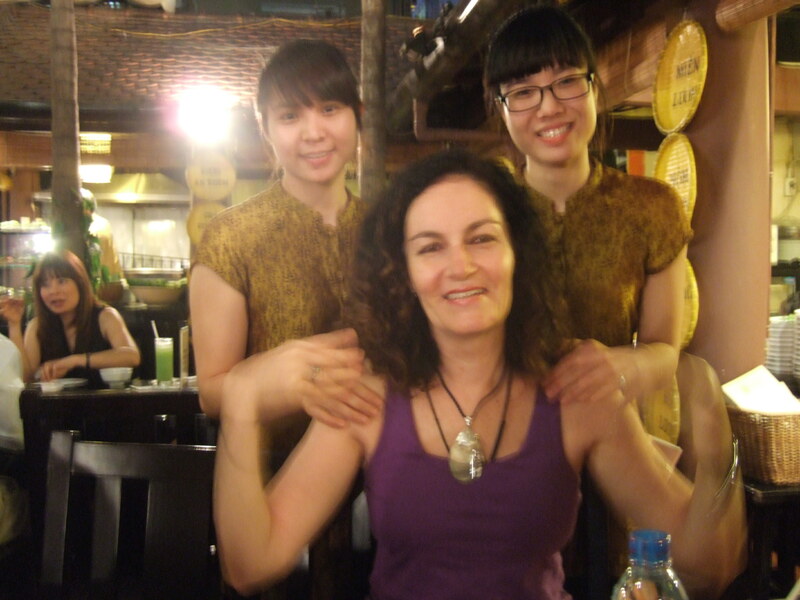 Two of our cheery servers at Quan An Ngon restaurant. 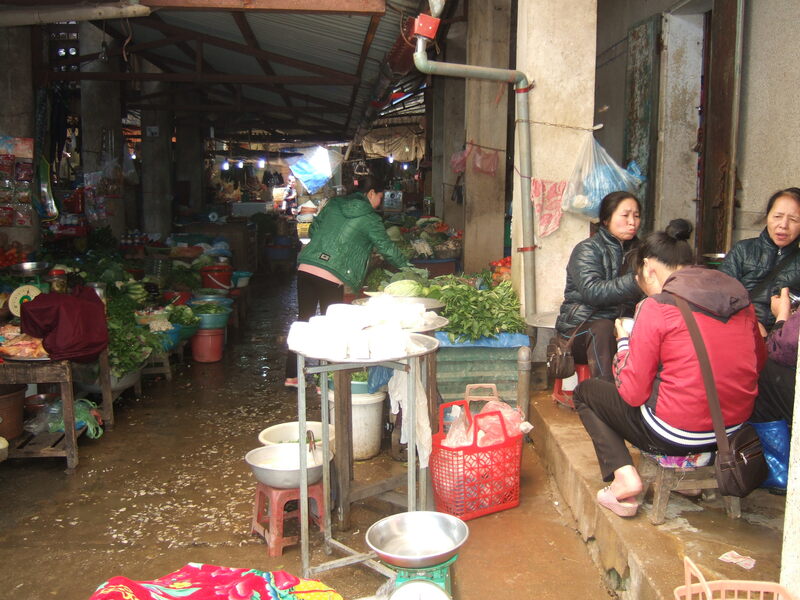 Entering through the open wrought iron gates of Quan An Ngon restaurant was like being transported to a festive fusion of one part open air garden, one part bustling marketplace. 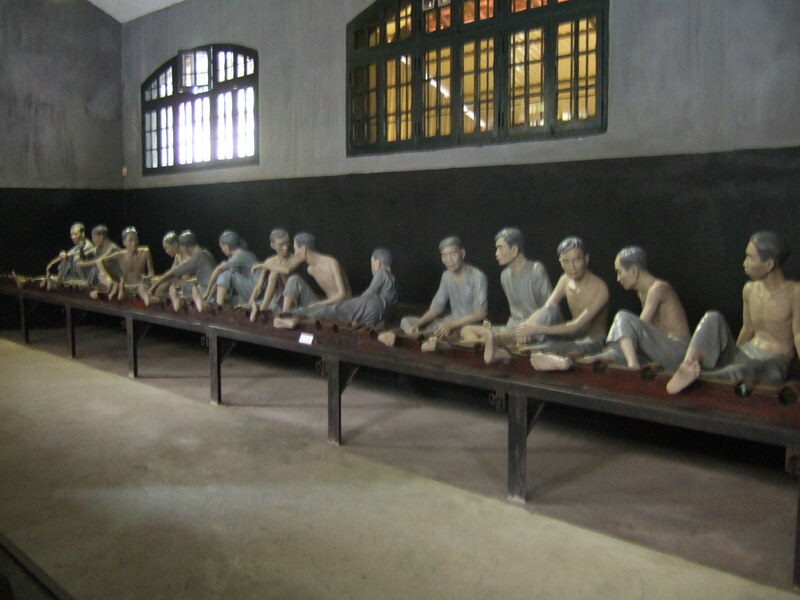 I hesitated over sitting at a communal table preferring, instead, a private table, however, there were no private tables available, so we sat alongside Europeans at a long public table. In time, a single lady from the Netherlands joined us, and the camaraderie that ensued certainly enhanced our evening. 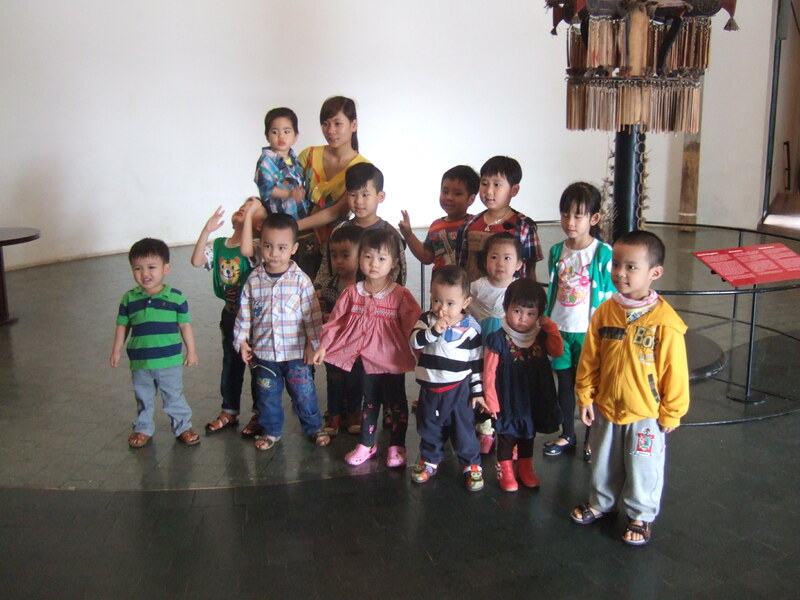 A happy spirit and wonderful ambience permeated Quan An Ngon. Several smiling and amiable servers approached our table and patiently deciphered meal items from the menu. 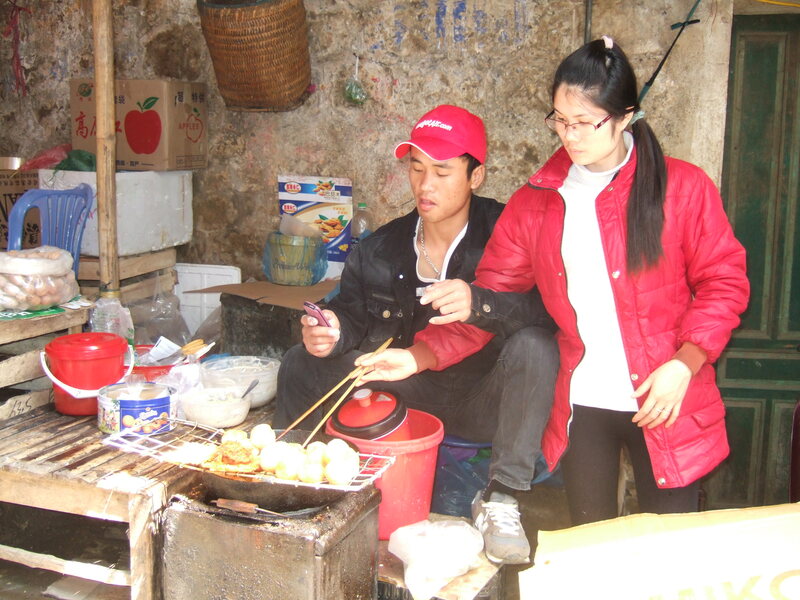 The suggested choices included Vietnamese fried pancakes (bánh xèo), pork soup with noodles (Bánh canh Trảng Bàng), and barbecue pork (thịt nướng). We must have looked a bit hapless, since a couple of servers, pulling plastic gloves over their hands, came bounding over when we received our food, and proceeded to show us how those “in the know” eat traditional Vietnamese meals. And there is definitely an apropos technique for most entrees, which involves combining repast elements using chopsticks, of course. The bánh xèo was the most complicated to assemble; the process beginning with the server placing mixed greens (fresh mint, parsley, spinach, lettuce, and cilantro) on a thin rice patty. Next, a crispy rice patty is folded up and positioned over the greens, and bits of pork and shrimp are arranged on top. The server then showed us how to roll up the original rice patty with the mixings and dip it into special Vietnamese fish sauce. 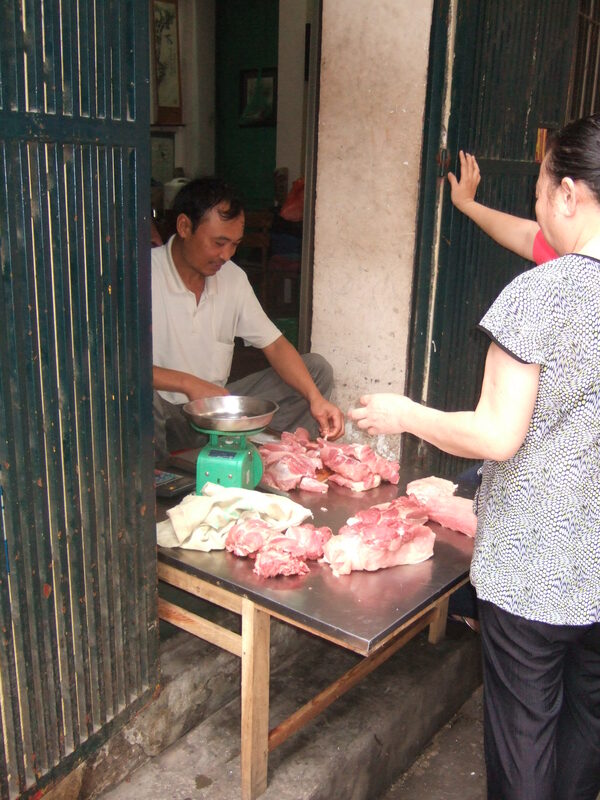 Bishara and I practiced several times, and eventually became semi-proficient at assembling the various elements of bánh xèo, however, we were much more accomplished at consuming the final product, a flavorful and crunchy mix that was absolutely delectable. The Bánh canh Trảng Bàng (pork noodle soup) was equally as savory, although the necessary prerequisites for “chowing down” were much simpler; a side bowl of mixed greens are occasionally pilfered and nudged into the soup for a refreshing and tangy taste. We also enjoyed an order of fresh spring rolls wrapped in lettuce leaves and thịt nướng (grilled barbecue pork), however, the latter was a bit too spicy for me. We topped our meal off with a highly palatable plate of fried bananas in coconut milk. 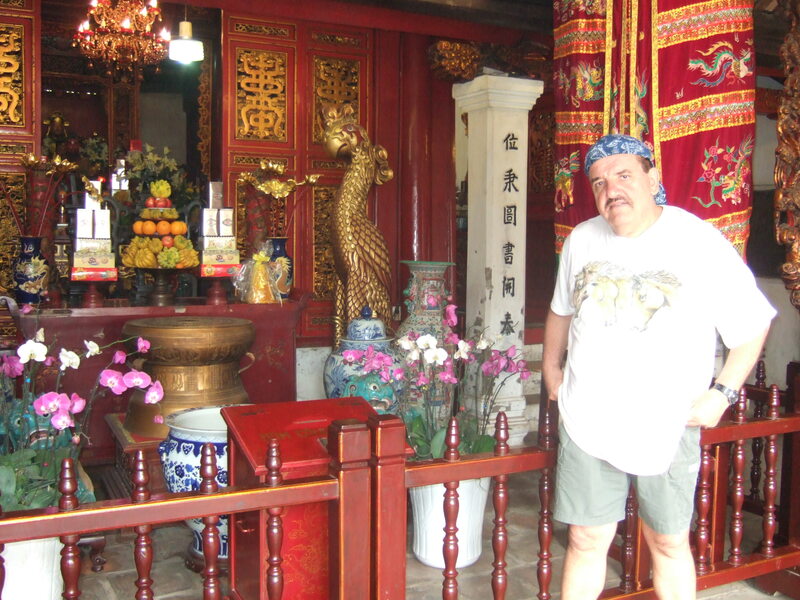 We had been told by Canadian expatriate friends who had visited the country the previous year that the American dollar ruled in Vietnam, however, we were still taken aback when our bill was 190,000 Vietnamese dong, or just under 9 U.S. dollars. 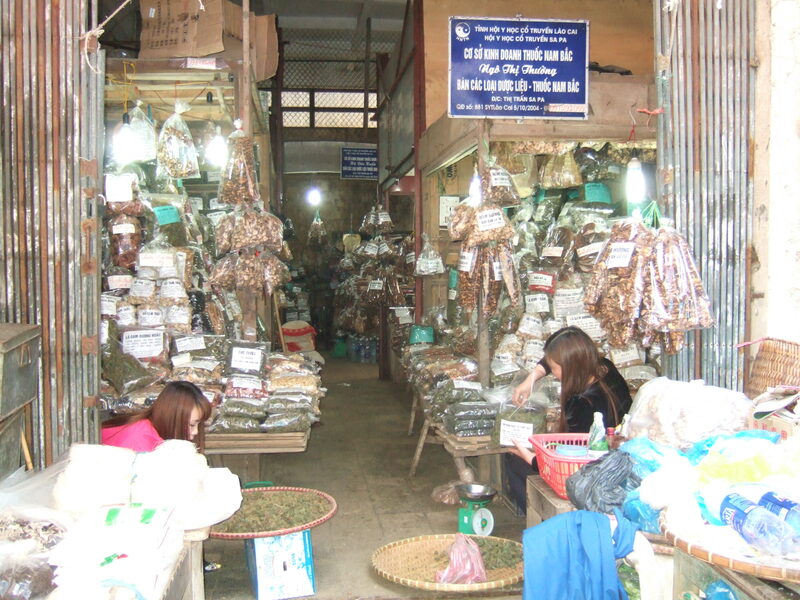 Our meals in Vietnam rarely exceeded five U.S. dollars. The hotel business card did, indeed, come in handy on our ride home. Once again, the taxi driver spoke not a word of English, but nodded enthusiastically when he read the name of our hotel on the card. We weaved through streets filled with scooters, cyclos, pedestrians, and Hundai cars all miraculously avoiding collisions, a low din of honking filling the air. 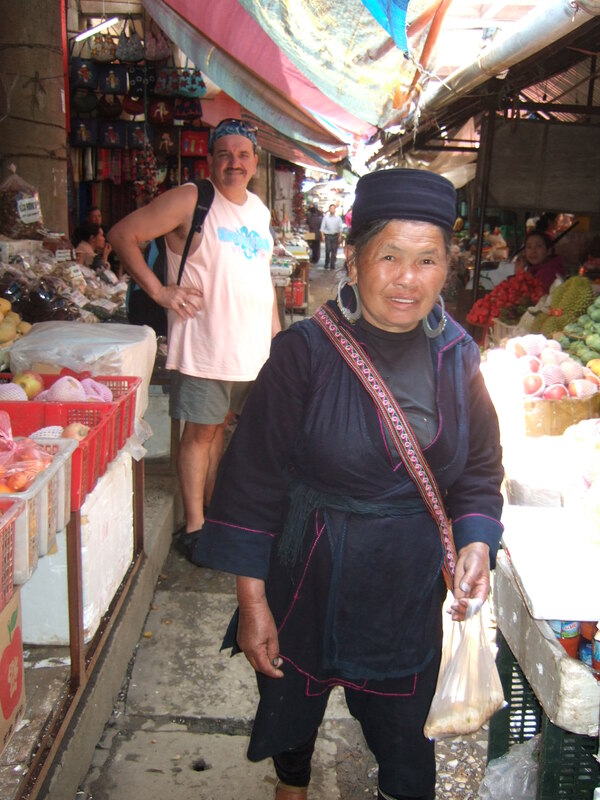 As soon as he spotted us, the hotel porter rushed out to open our car door, and graciously walked with us to a nearby market stall when he heard we needed to purchase bottles of water; we are water fiends, especially when on vacation. 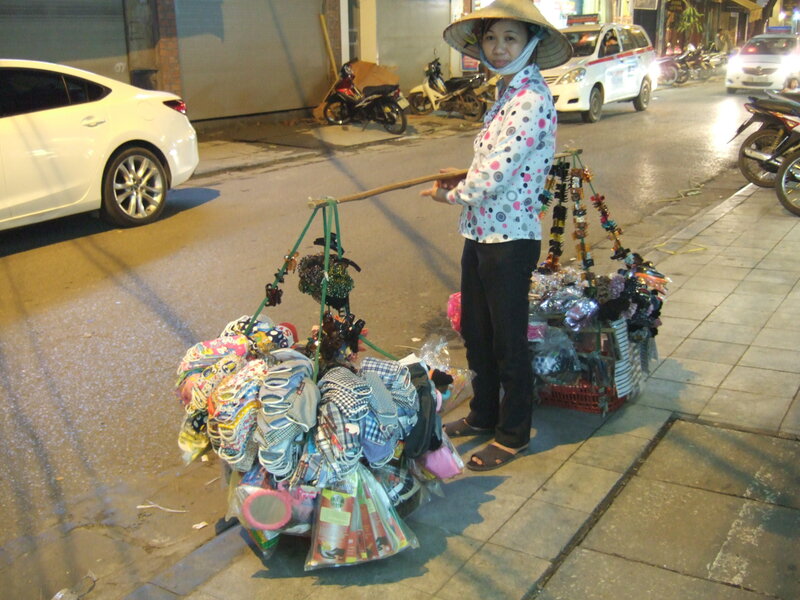 Shoulder pole vendor in Hanoi. On the way back to the hotel, a woman with a shoulder pole selling a variety of household wares and trinkets, motioned to me and inquired with hand signals if I was interested in a hair clip. I, naively, sampled a sparkly hair clip, and the lady immediately said “one million dong.” My jaw dropped. I couldn’t quite get used to carrying millions in our pockets and we had not paid nearly so much for anything, so far. Although one million dong equates to a mere $ 49, this was only a plastic hair clip. Sensing my hesitation, the lady retorted, “five-hundred thousand.” In normal circumstances, a 50 percent drop in price would seem reasonable, however, even the porter was perturbed by the vendor’s nerve. Some clipped words were exchanged between porter and vendor, and the porter motioned for us to follow him to the hotel. 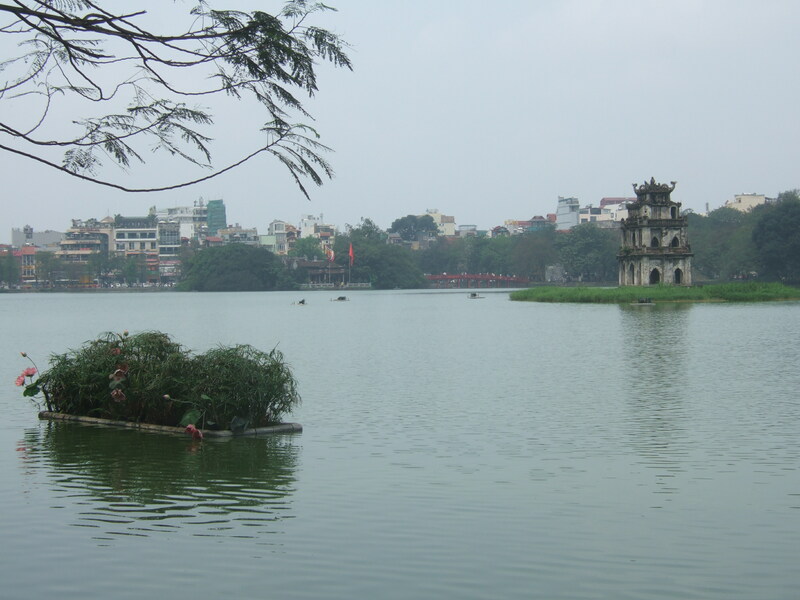 Hanoi, dripping with buoyant rhythm and a joyful soul, easily exceeded expectations. 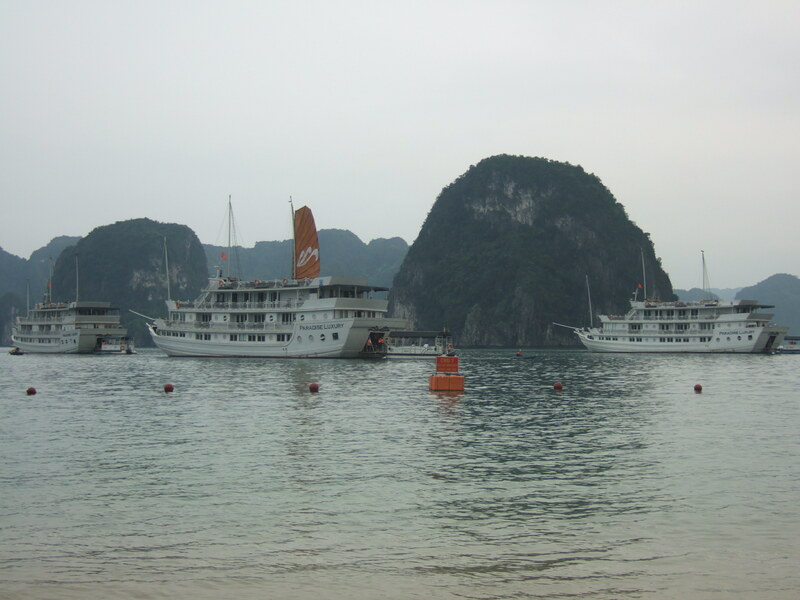 We looked forward to boarding the Paradise cruise ship for a three day/two night journey on Halong Bay the next day, and returning to Hanoi in the next few days.